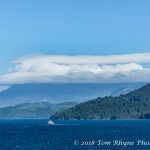 Our last days aboard the Golden Princess were spent cruising the Inside Passage to the port in Vancouver where our cruise ended on the morning of June 16. 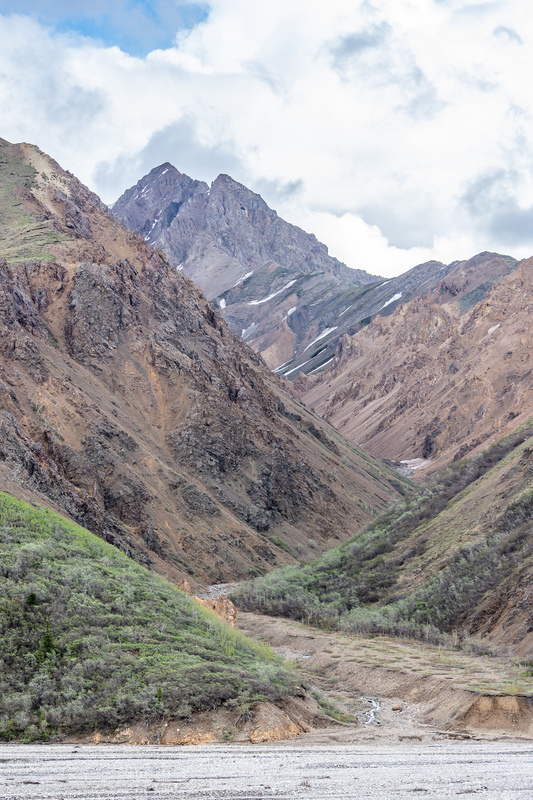 The scenery along the way was eye-popping. 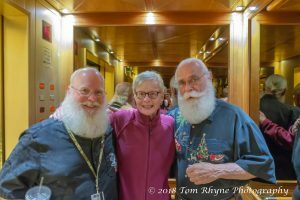 One of the big surprises on the Golden Princess was finding that Santa Claus was on the ship! And not just one Santa, but a group of them in all their bearded glory. We found ourselves on the elevator with a pair of them during this last day on the ship. 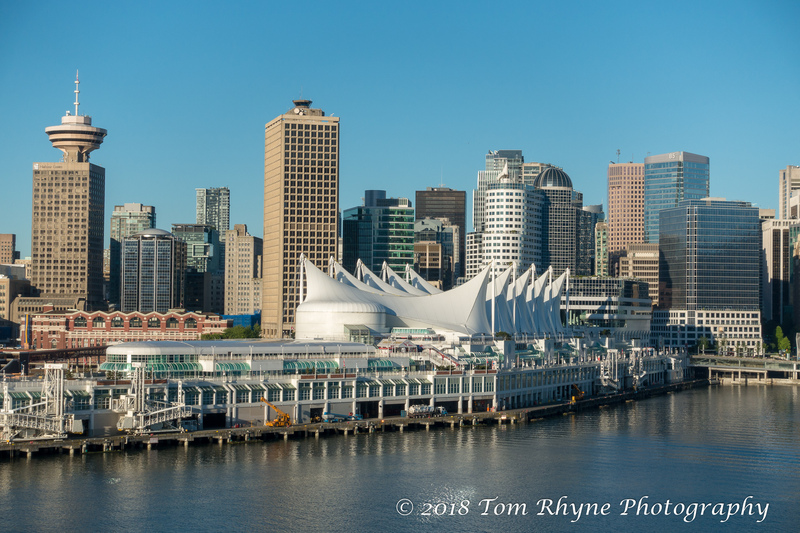 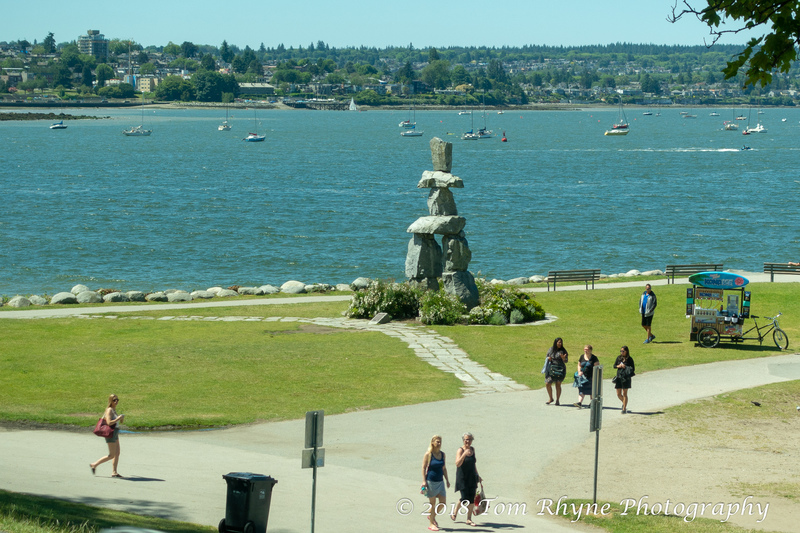 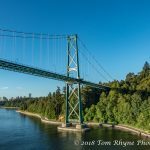 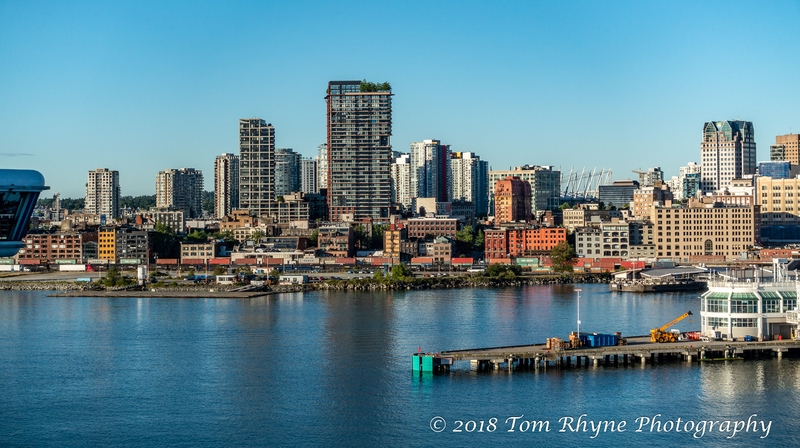 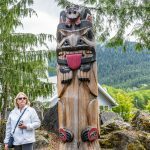 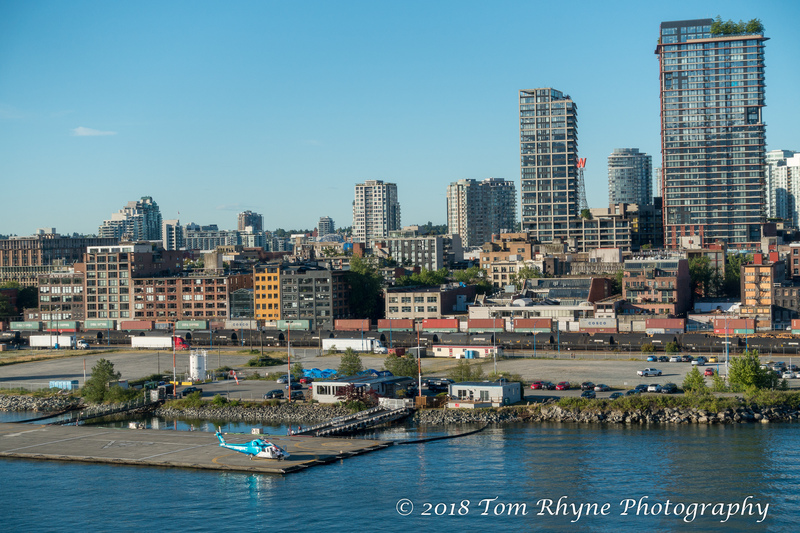 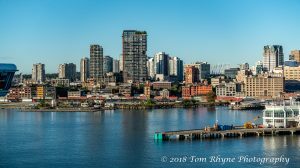 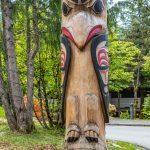 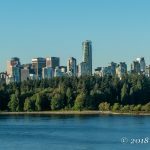 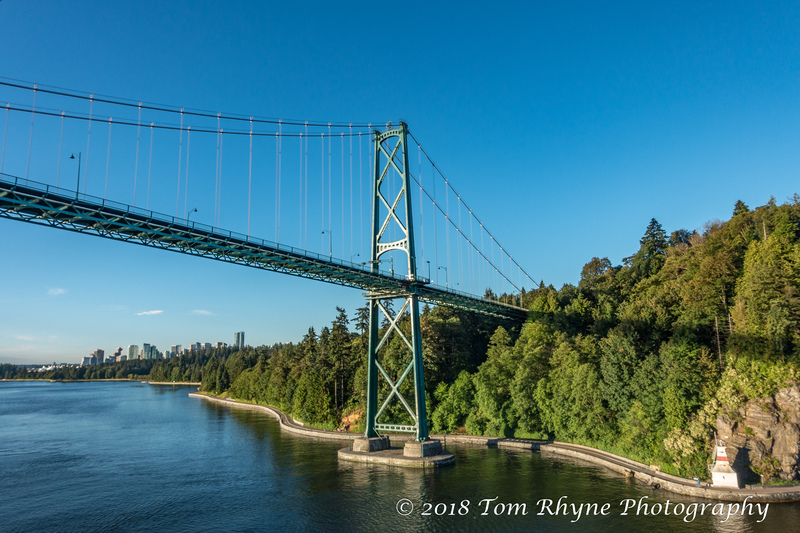 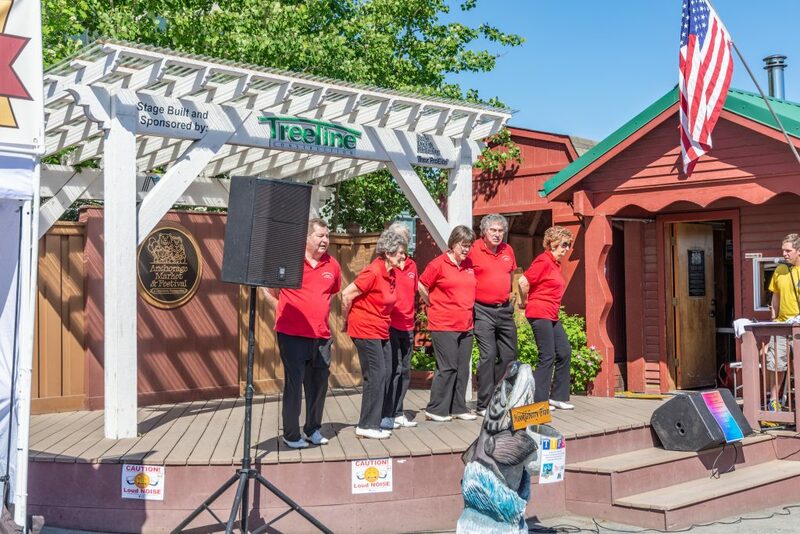 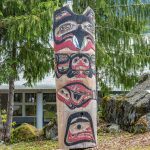 We cruised into Vancouver early on June 16 and disembarked the Golden Princess as our cruise ended. 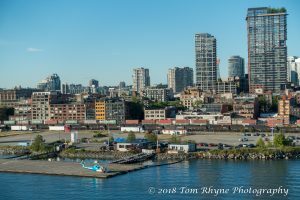 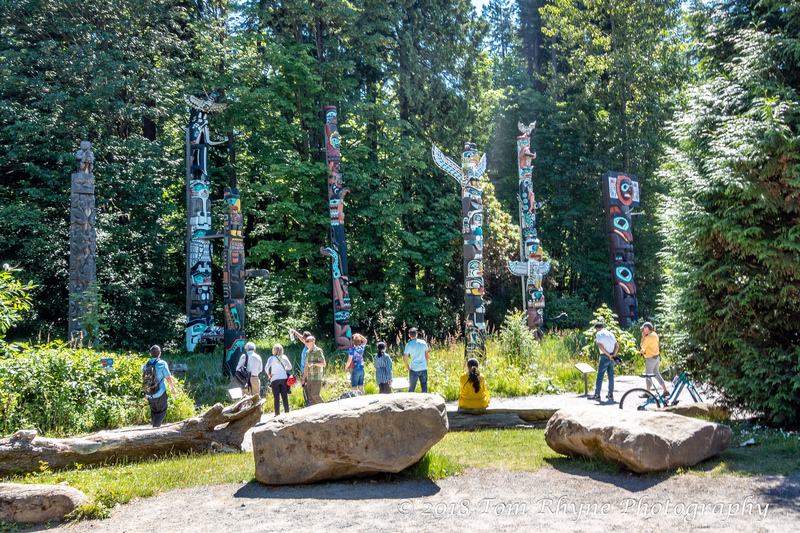 We toured the city of Vancouver and then traveled to Seattle for our flight home. 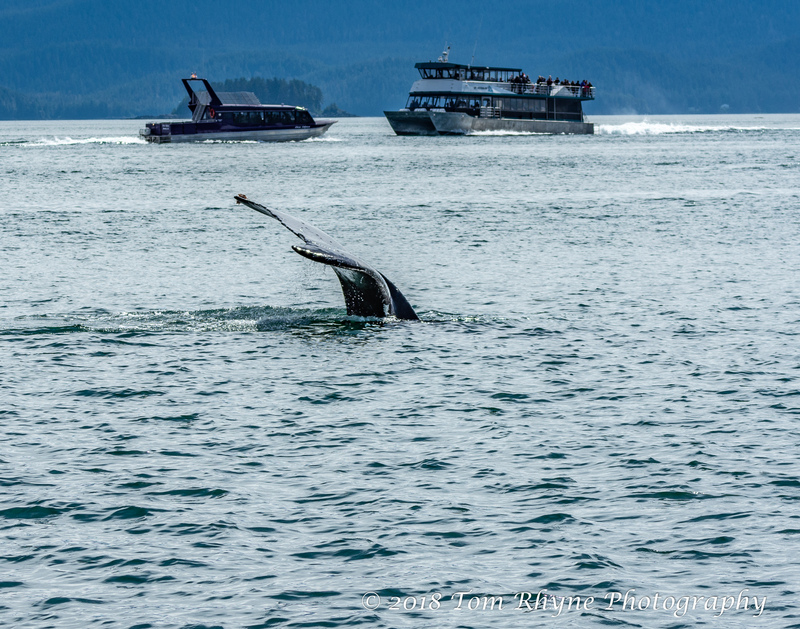 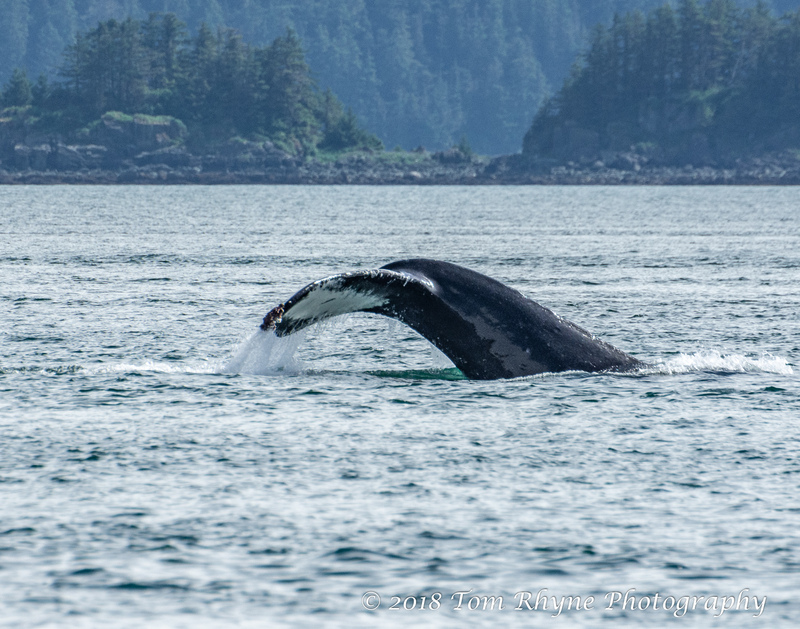 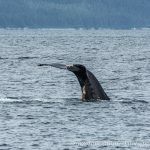 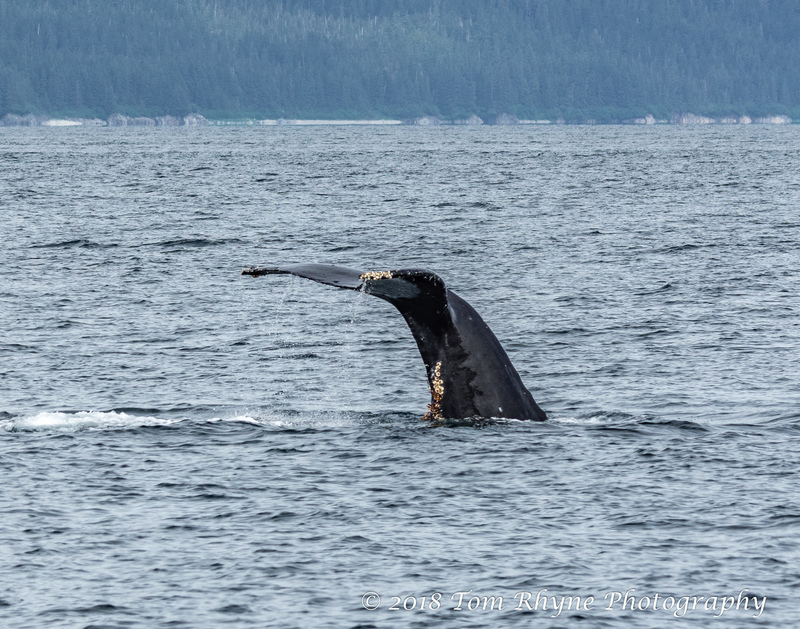 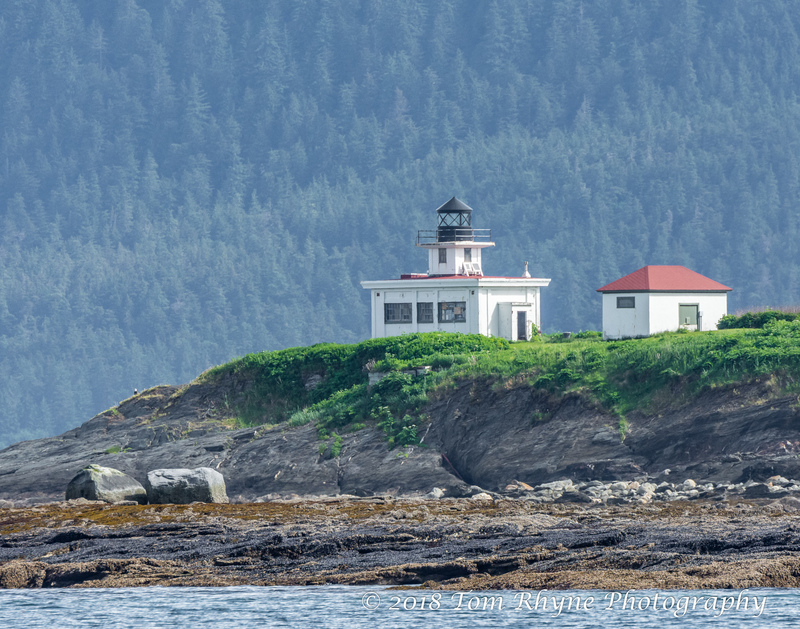 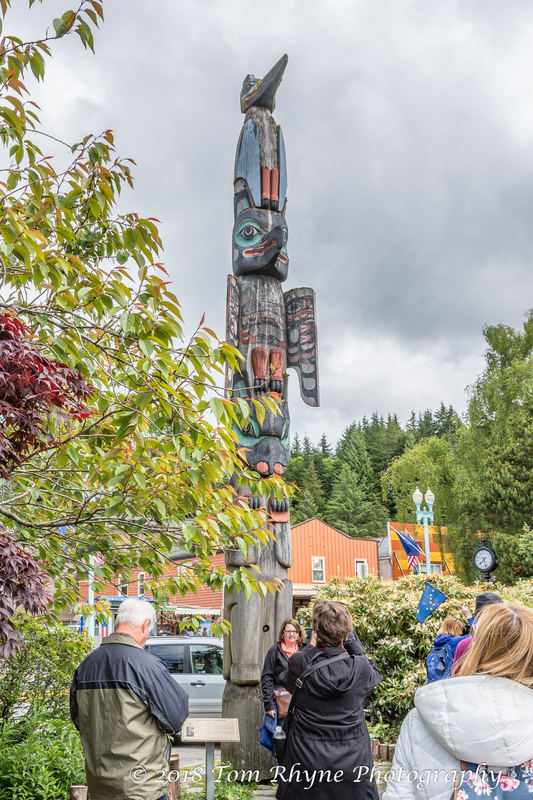 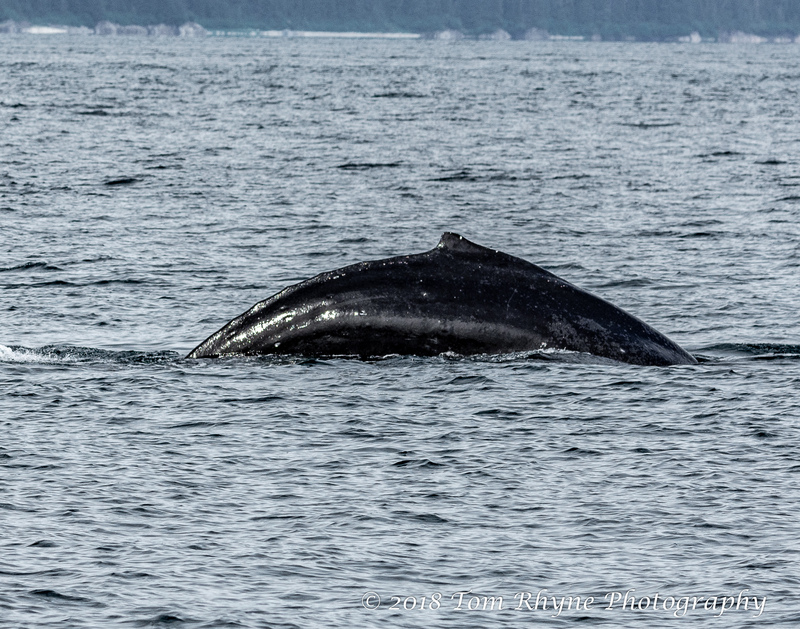 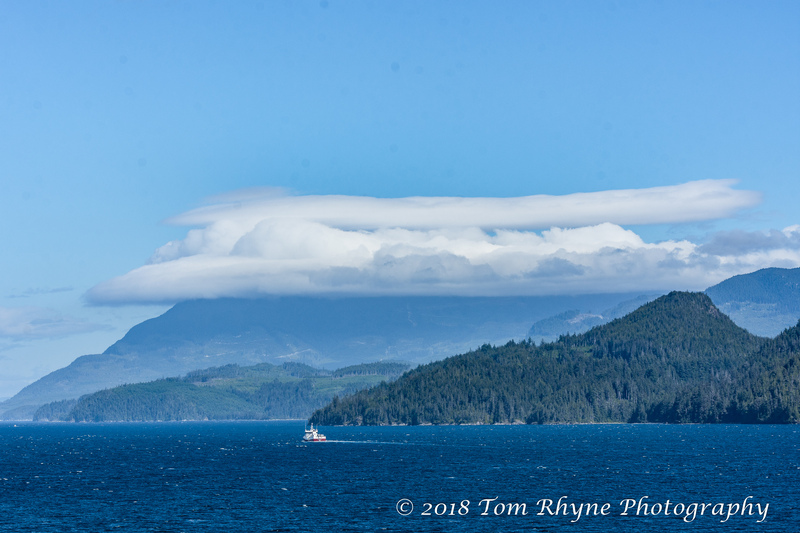 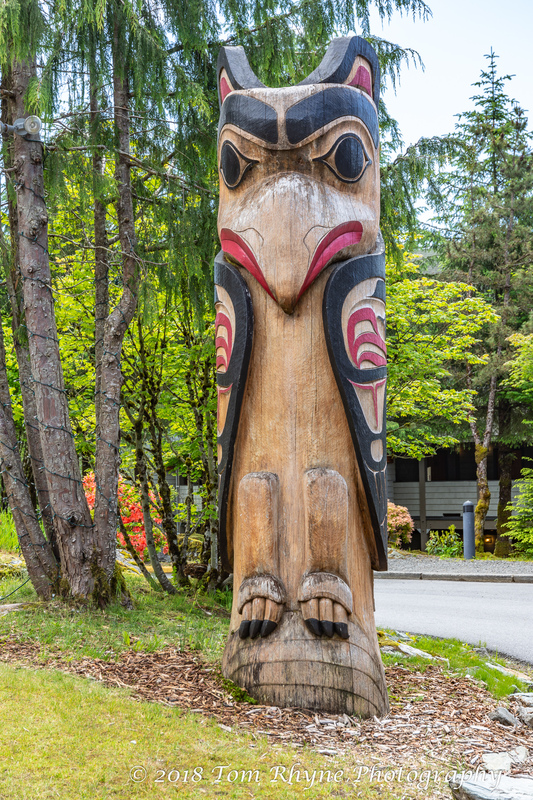 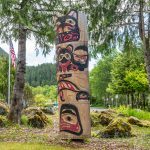 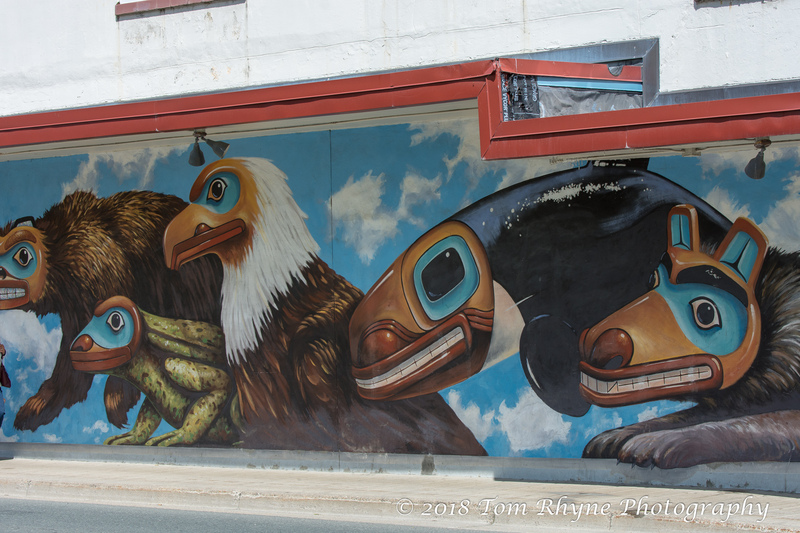 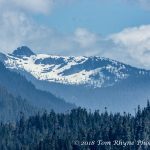 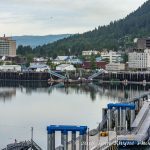 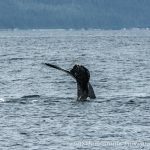 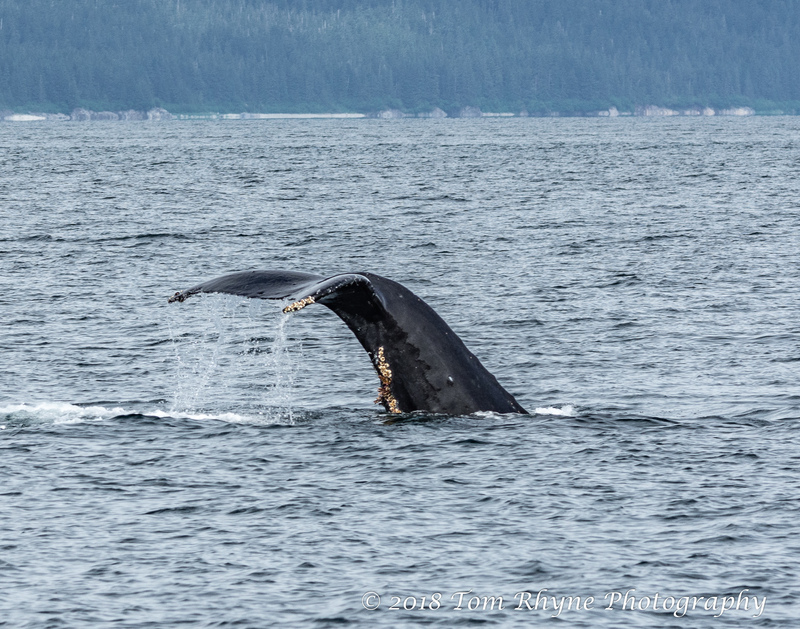 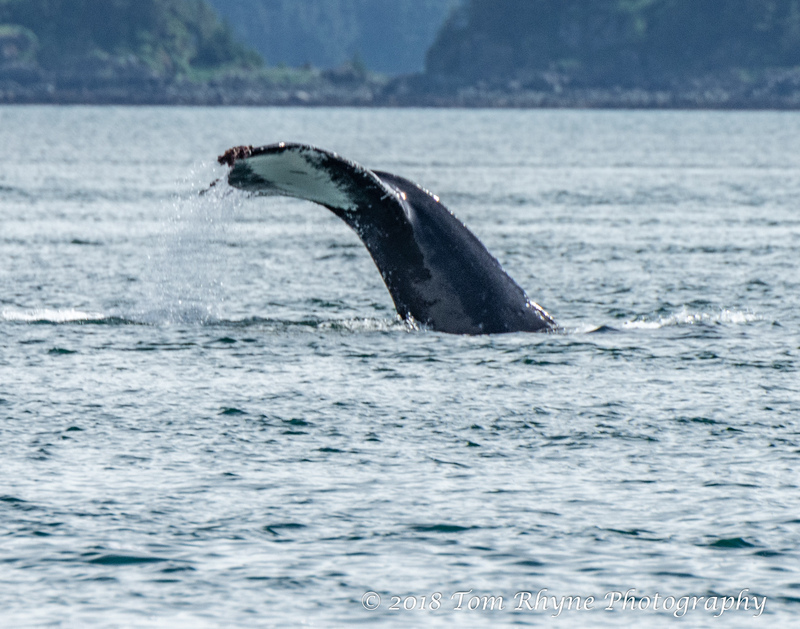 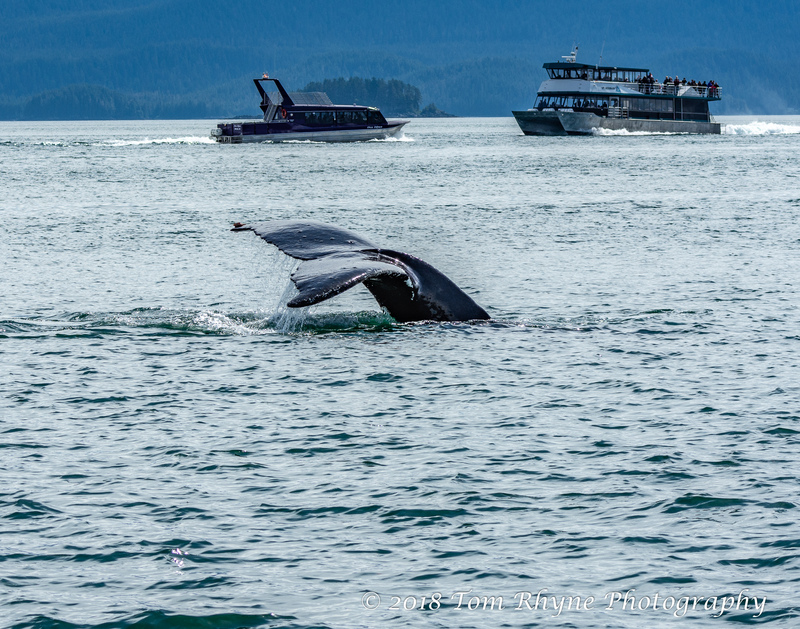 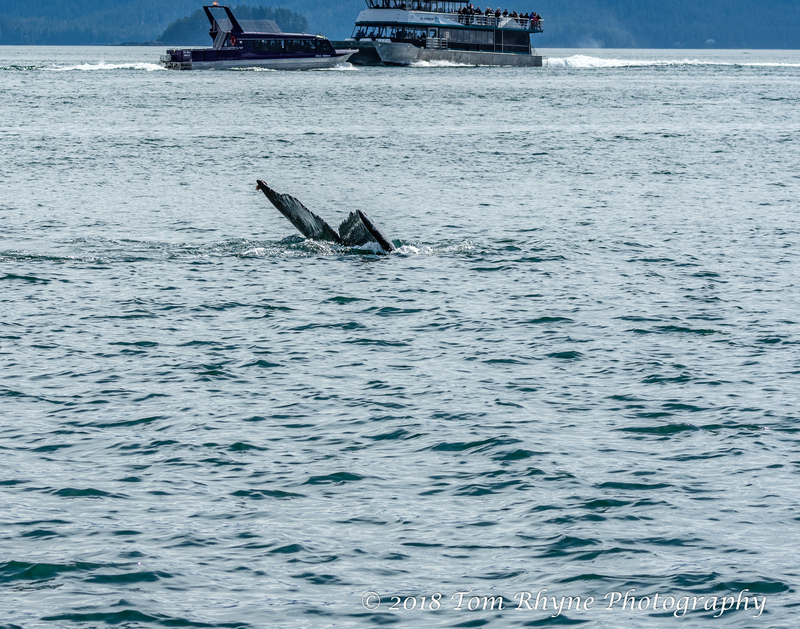 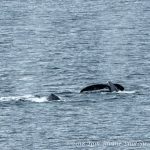 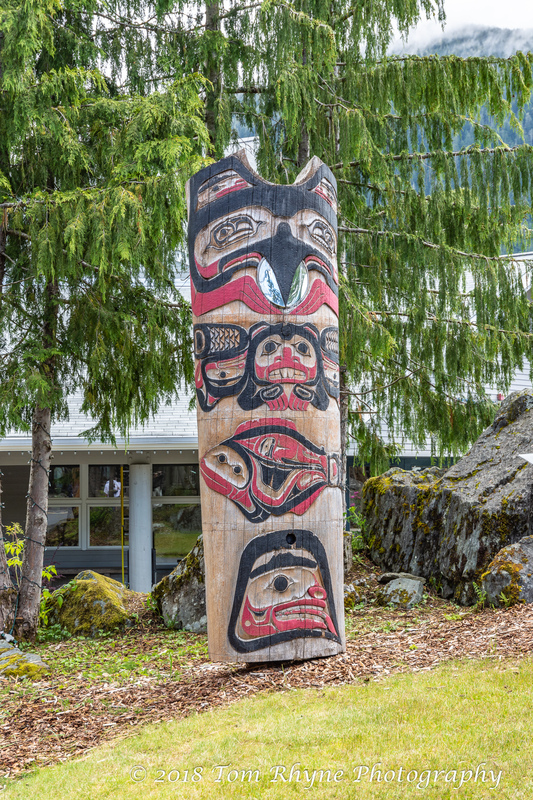 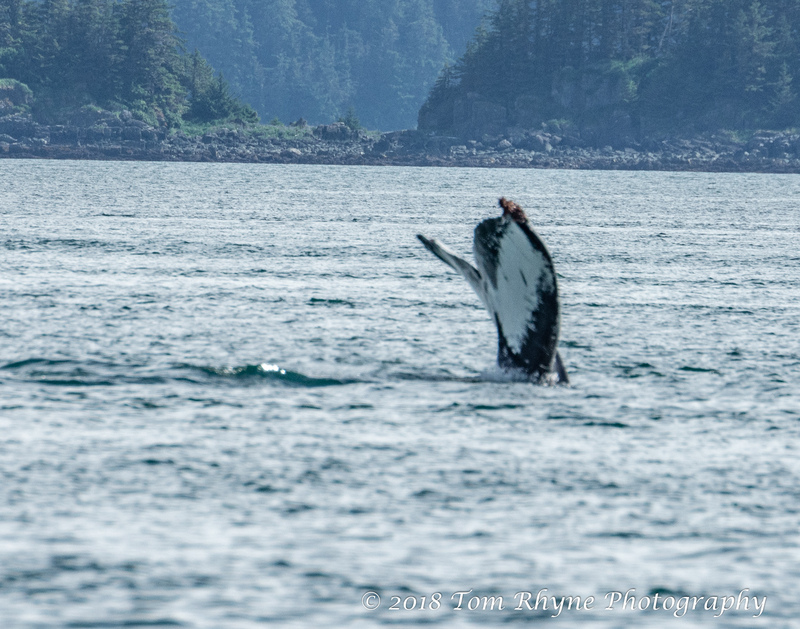 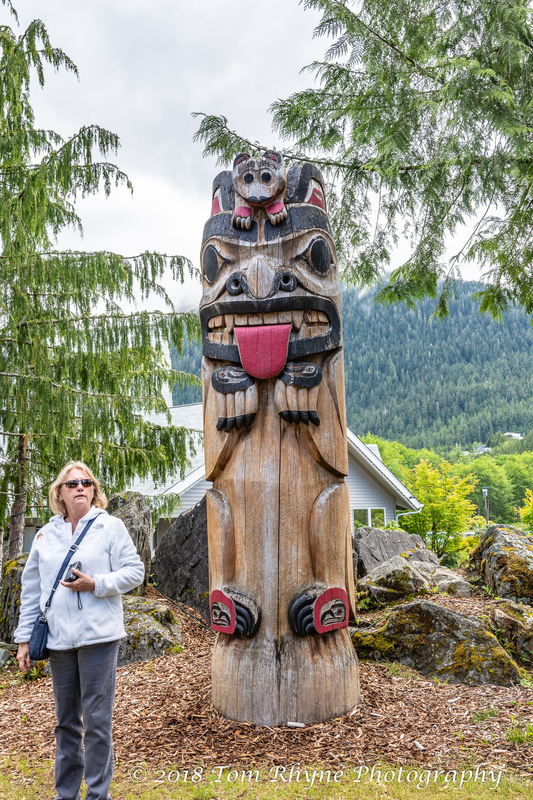 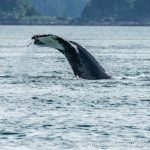 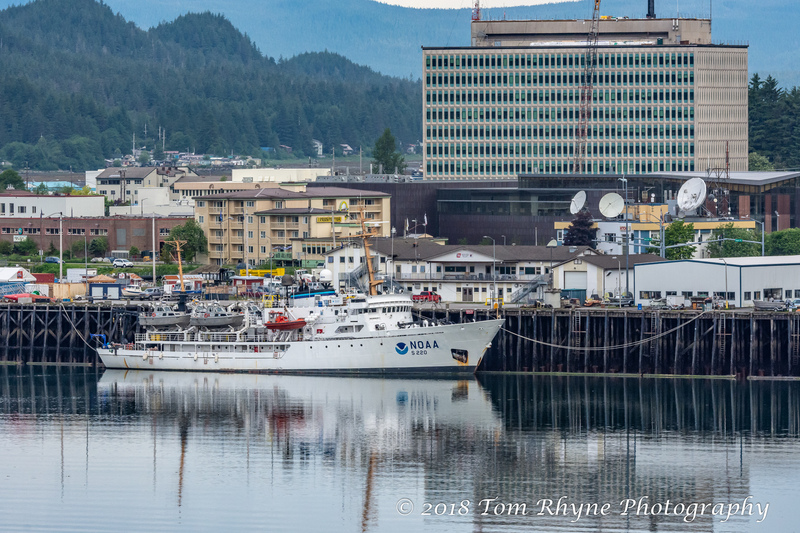 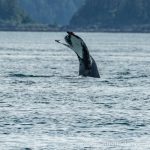 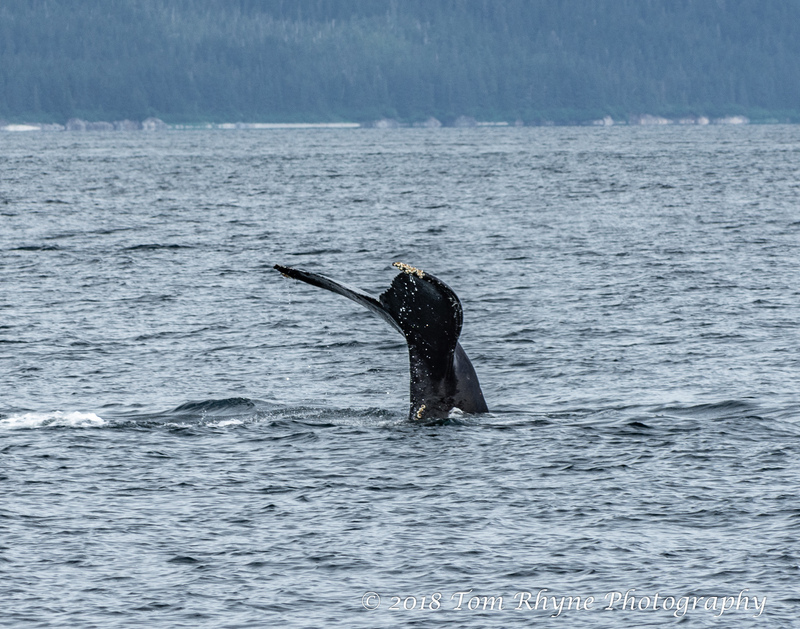 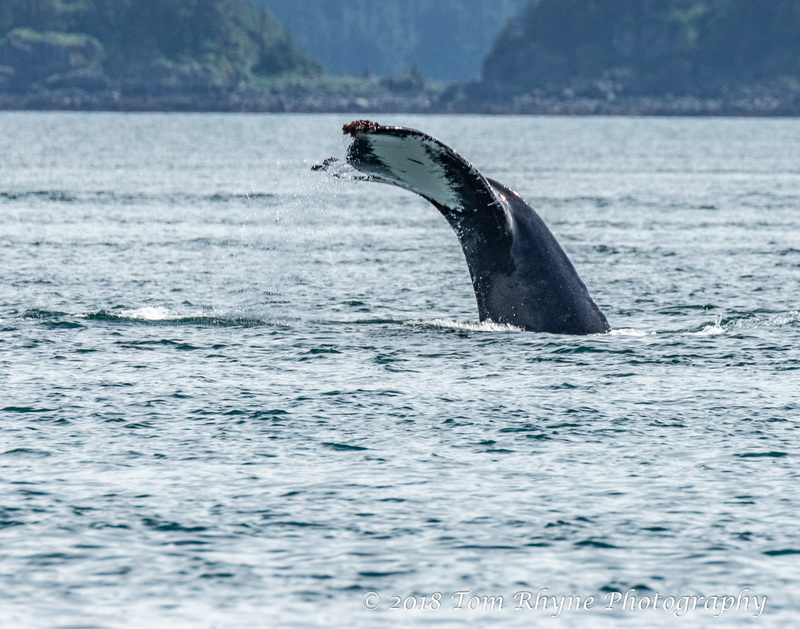 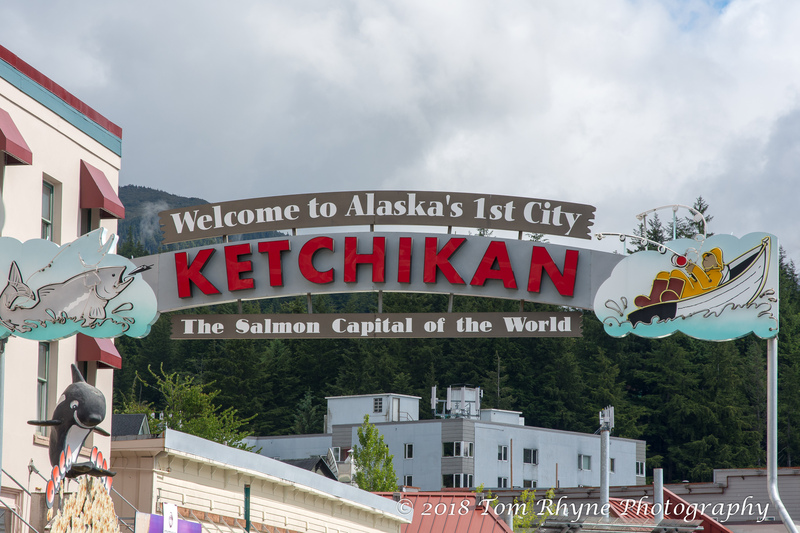 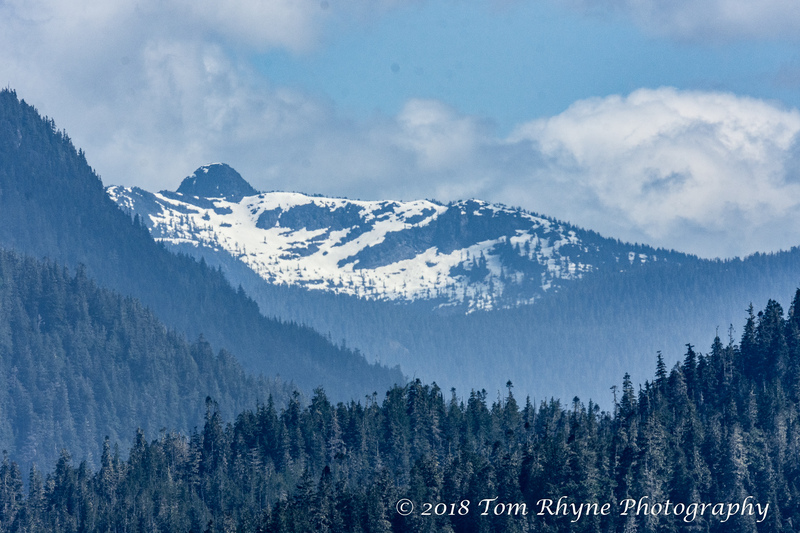 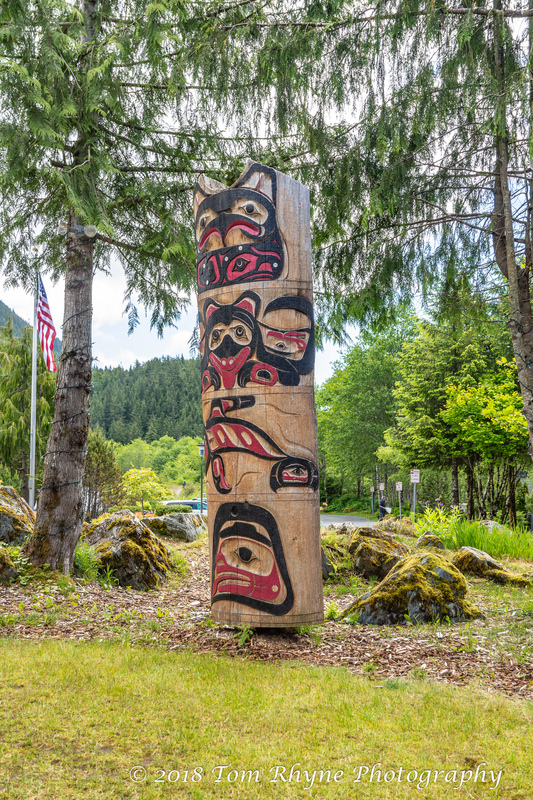 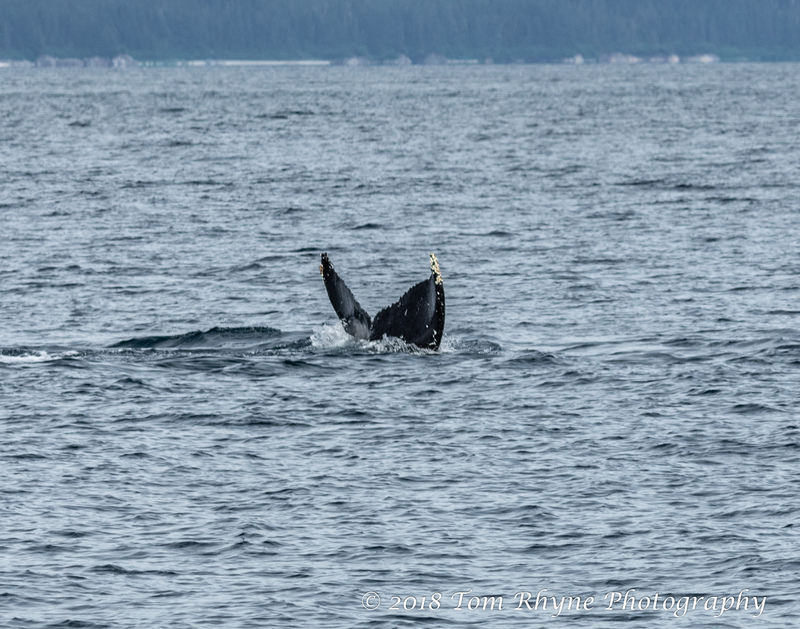 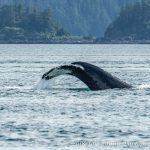 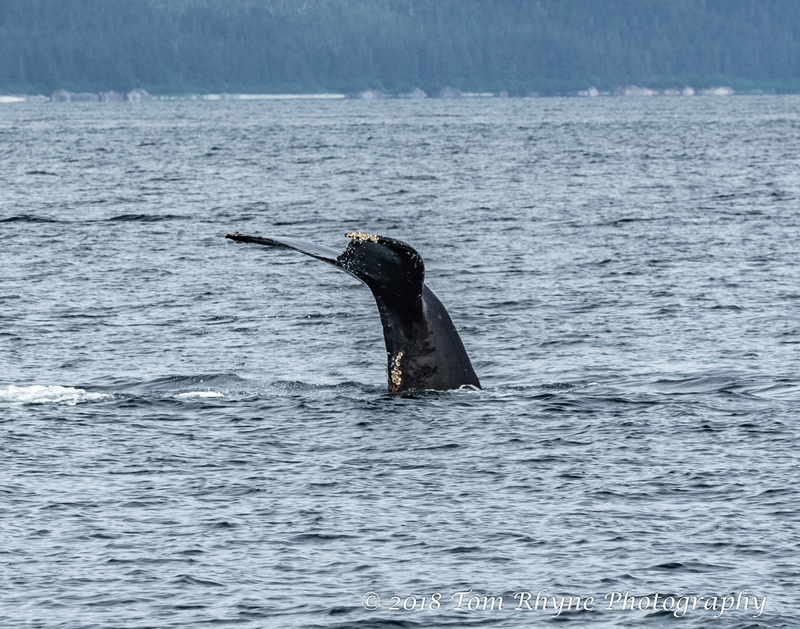 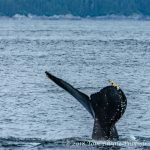 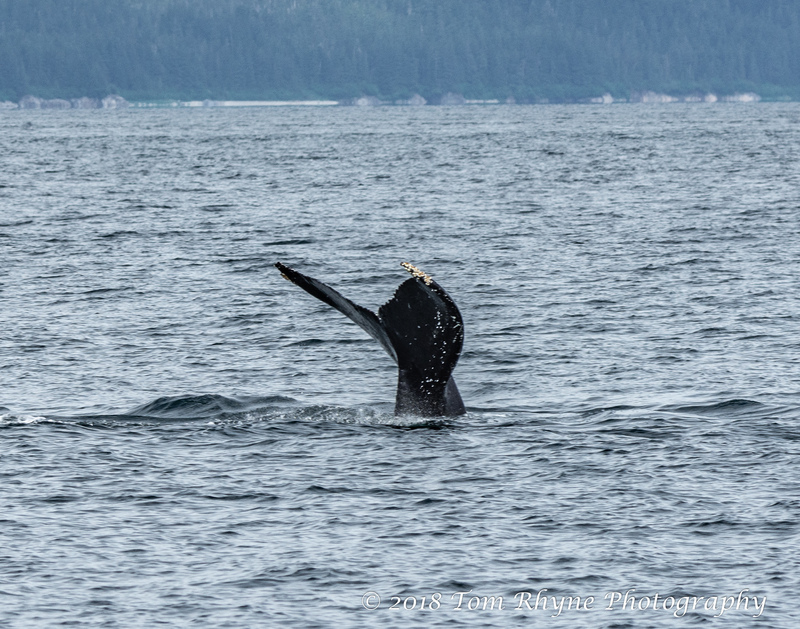 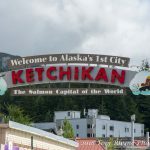 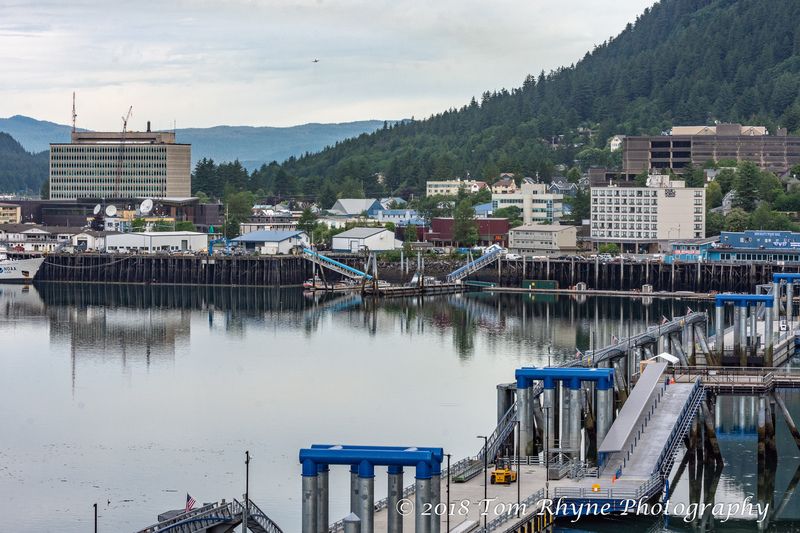 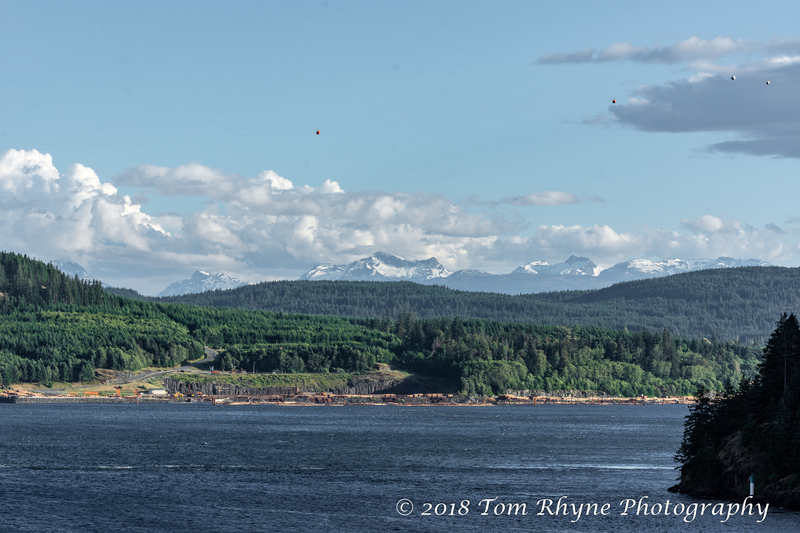 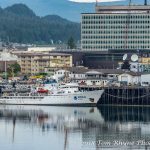 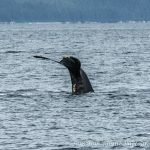 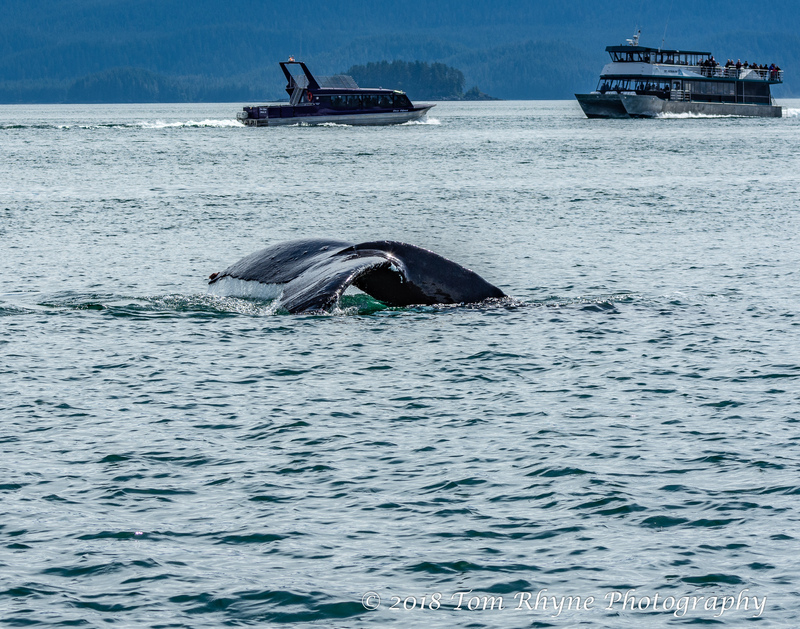 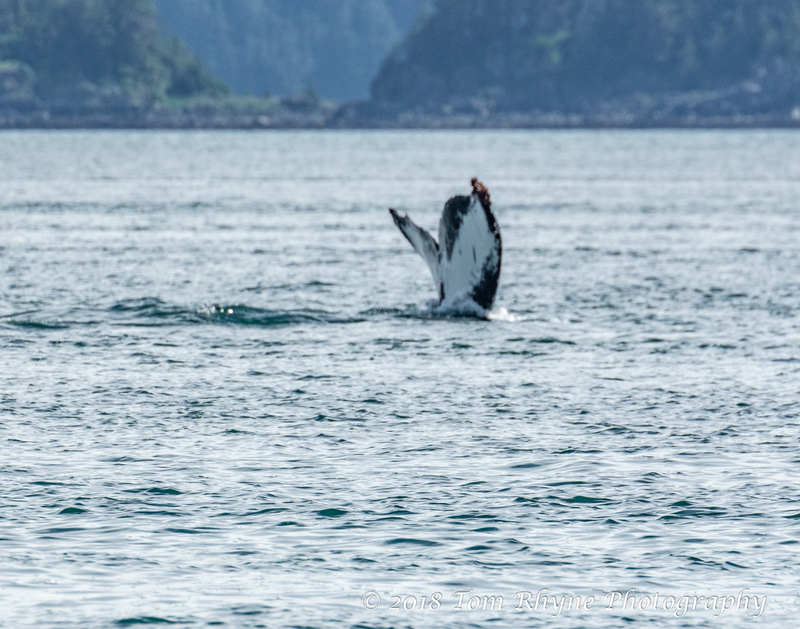 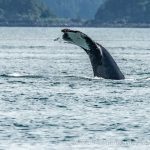 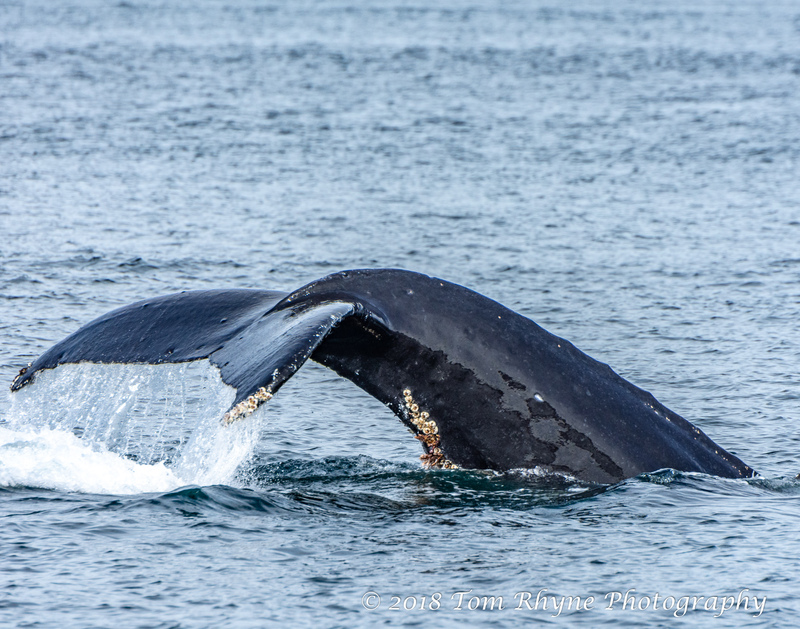 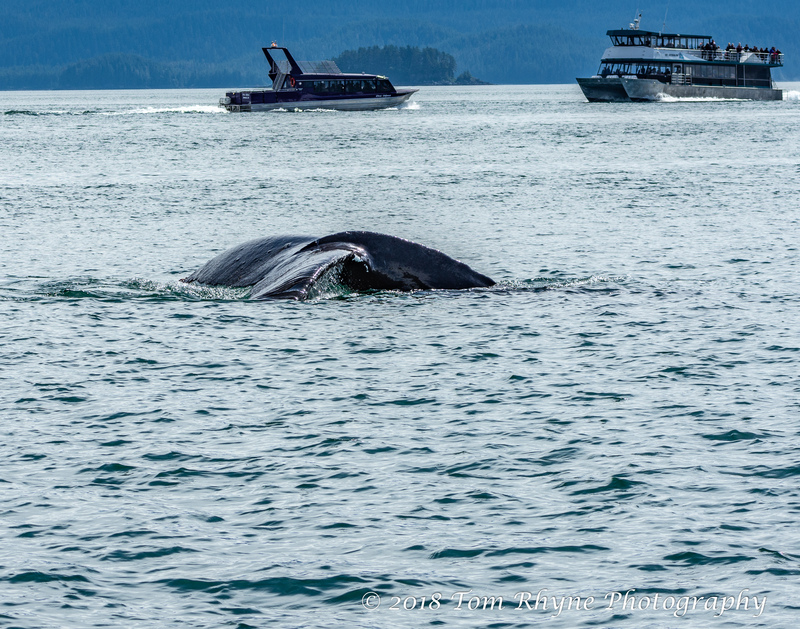 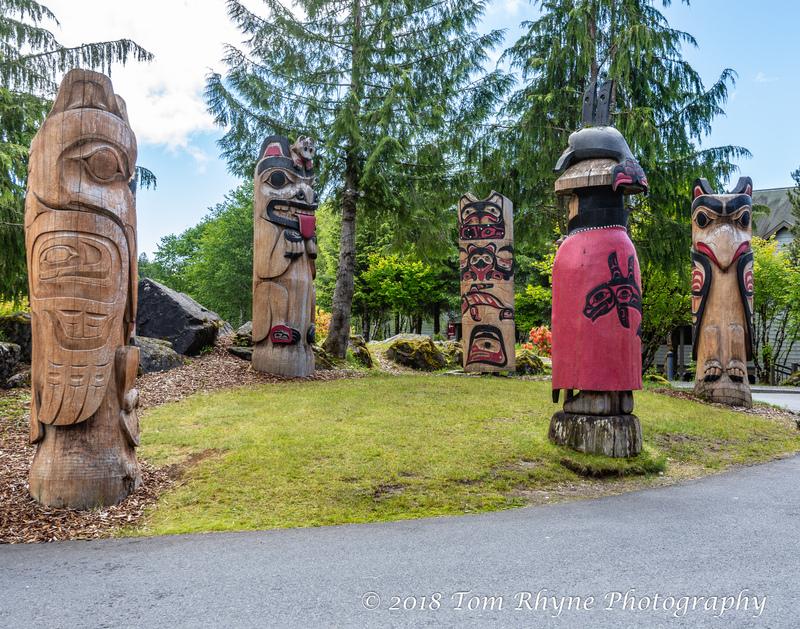 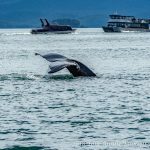 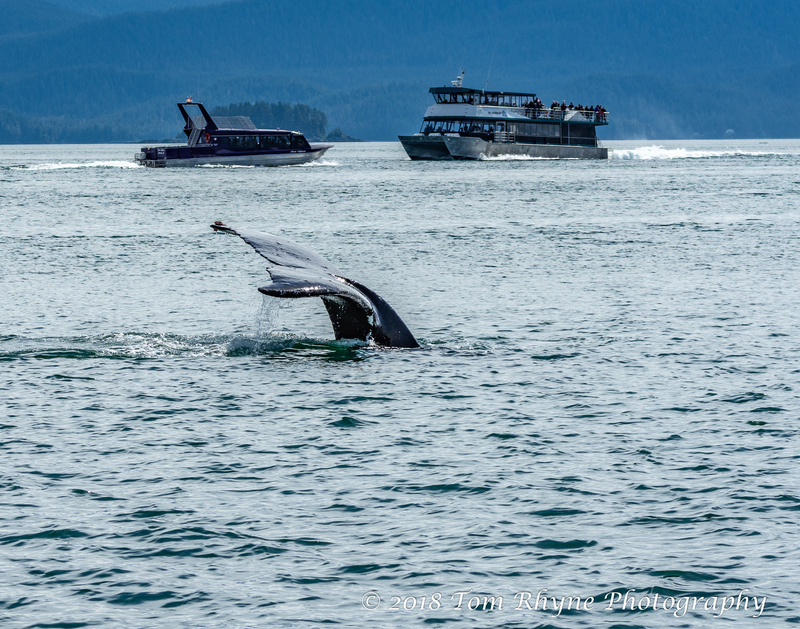 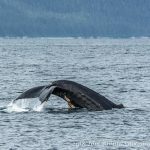 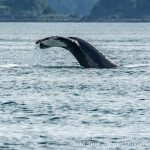 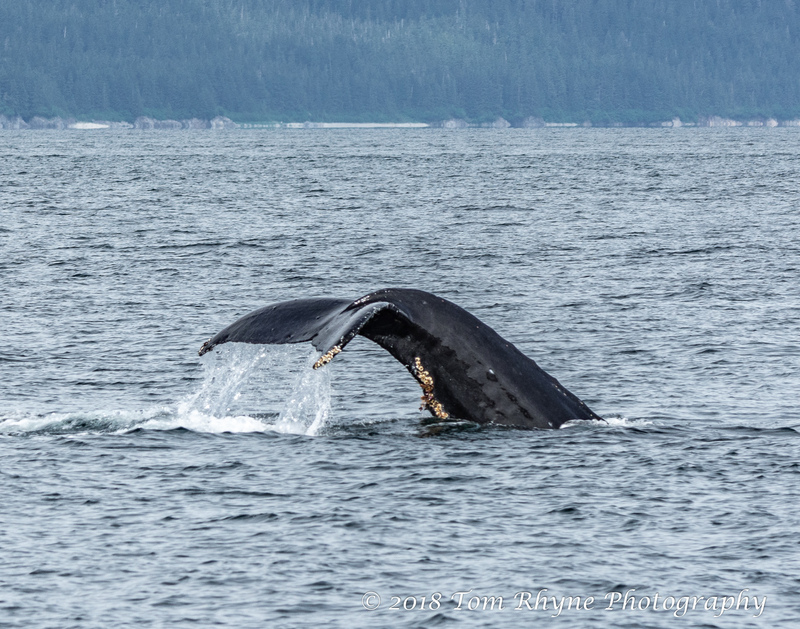 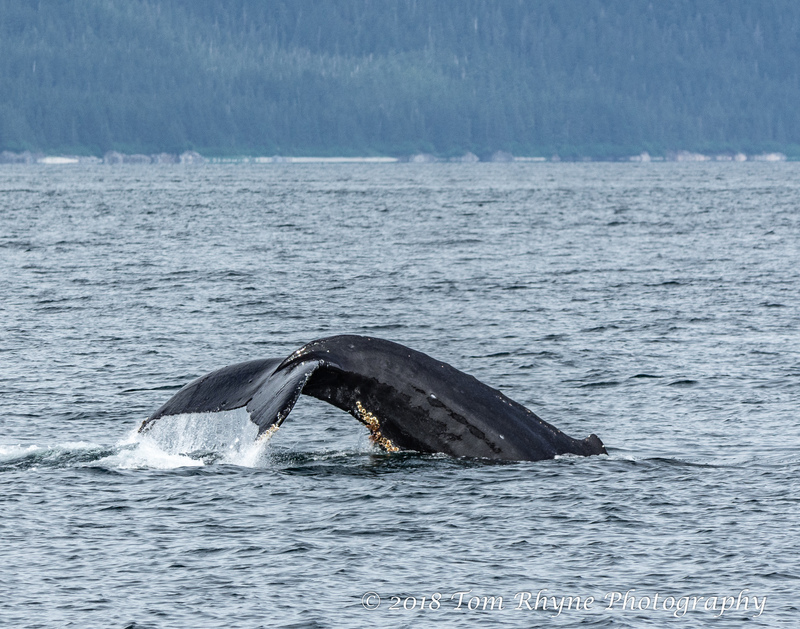 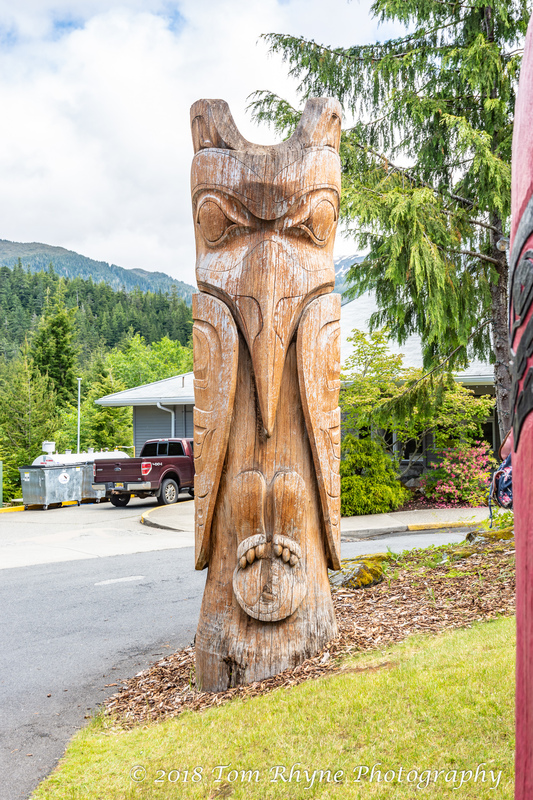 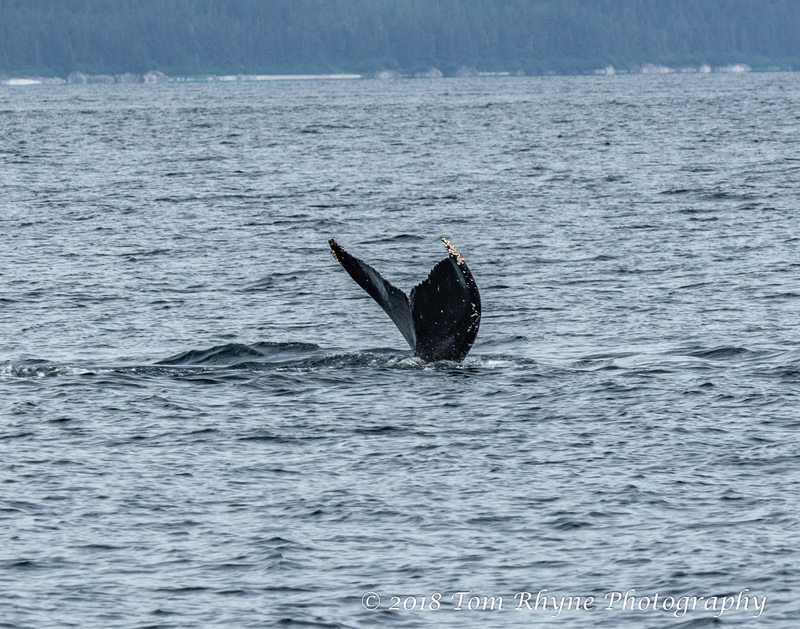 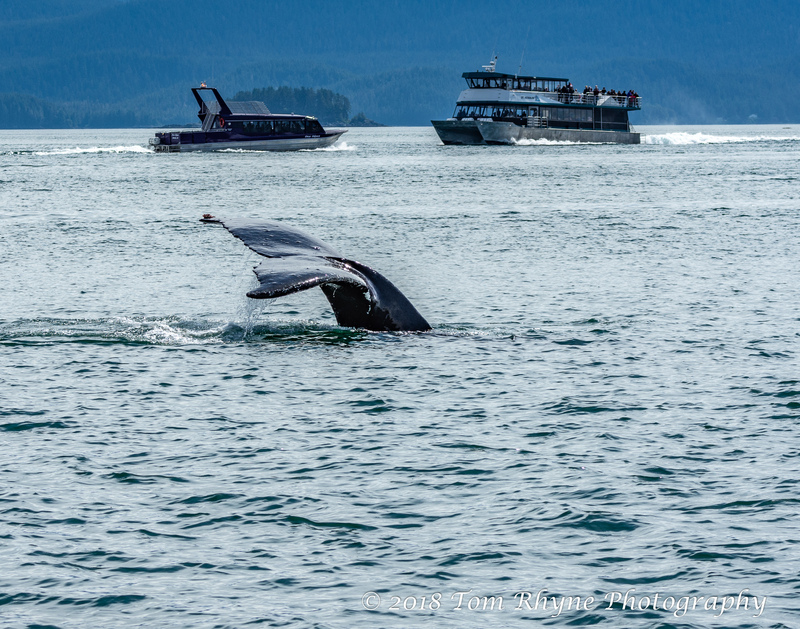 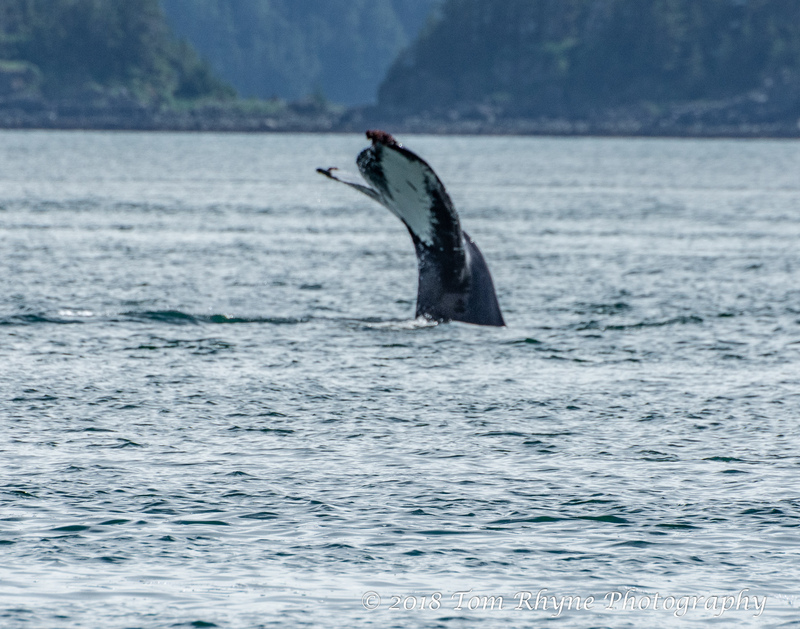 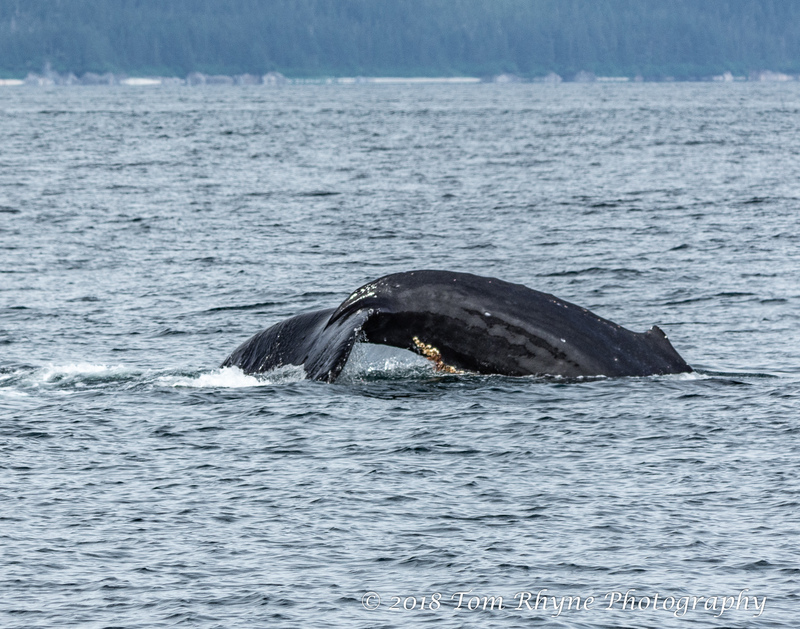 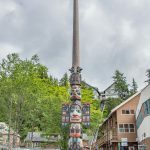 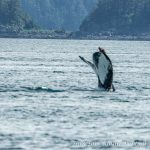 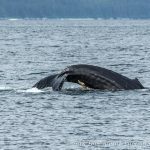 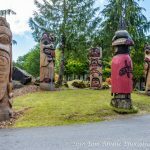 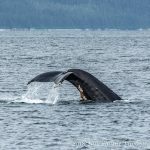 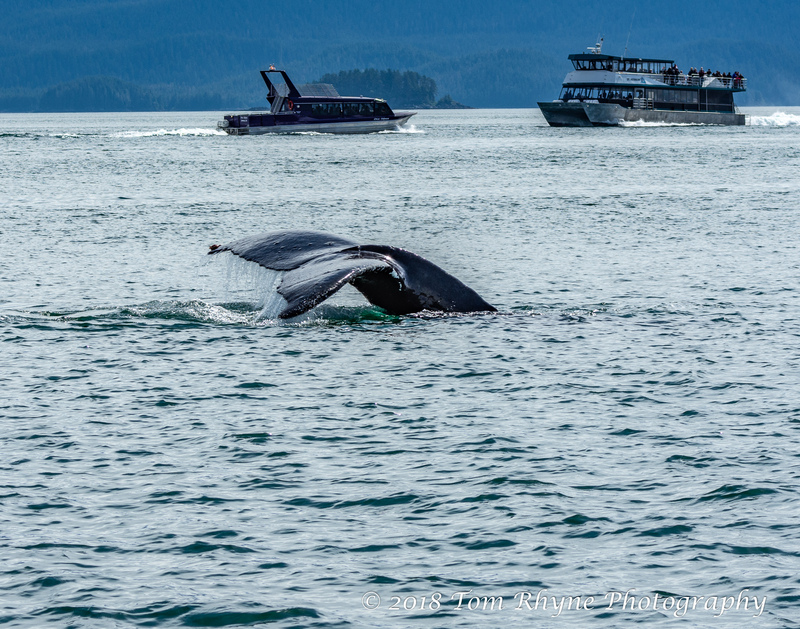 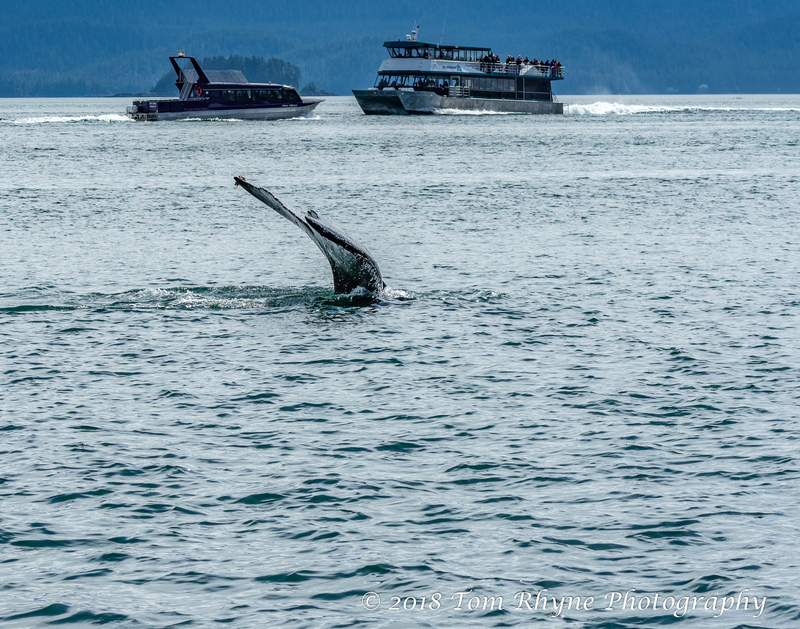 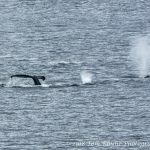 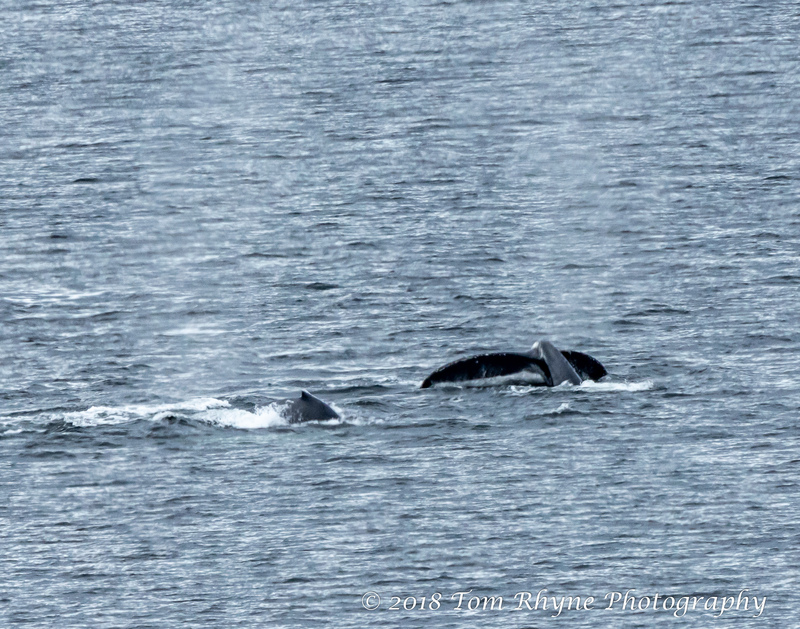 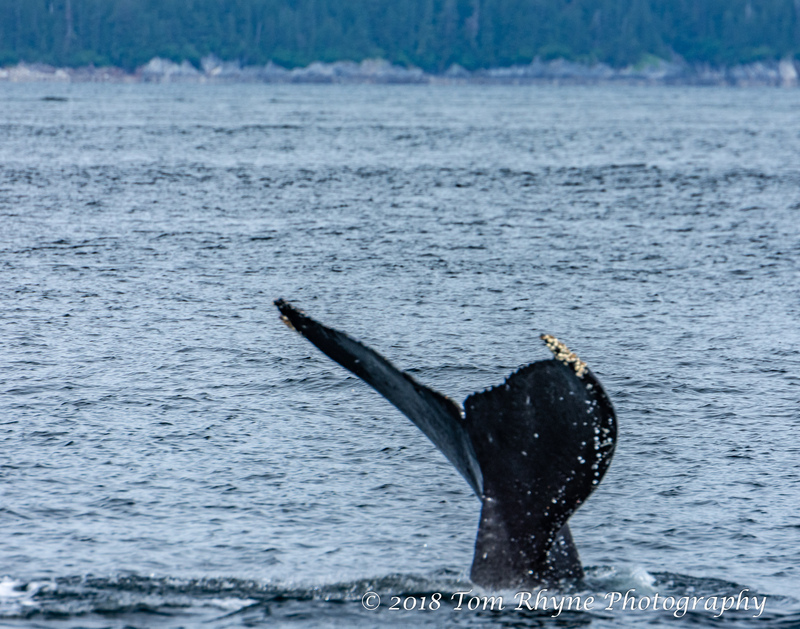 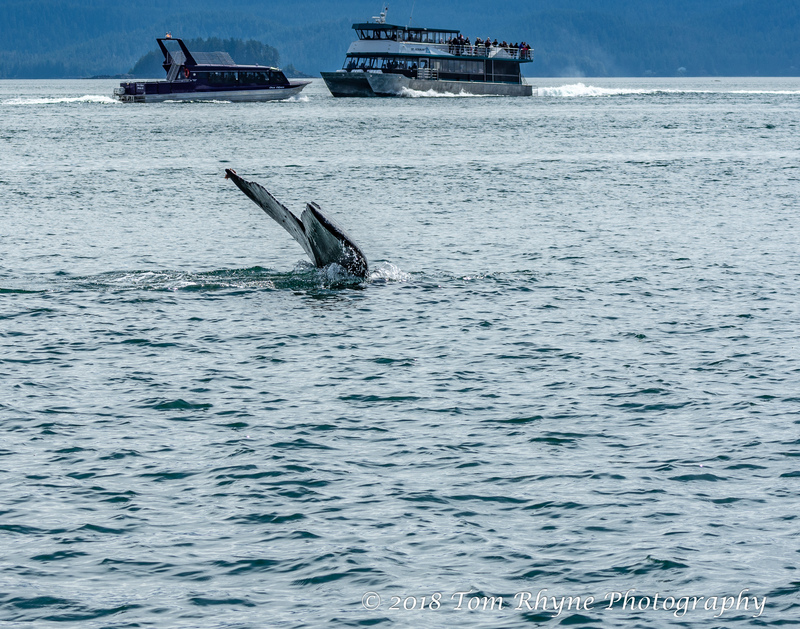 Today we cruise toward Ketchikan, Alaska’s first city, known as the “Salmon Capital of the World” and the “City of Totems.” Along the way we passed a family of humpback whales. 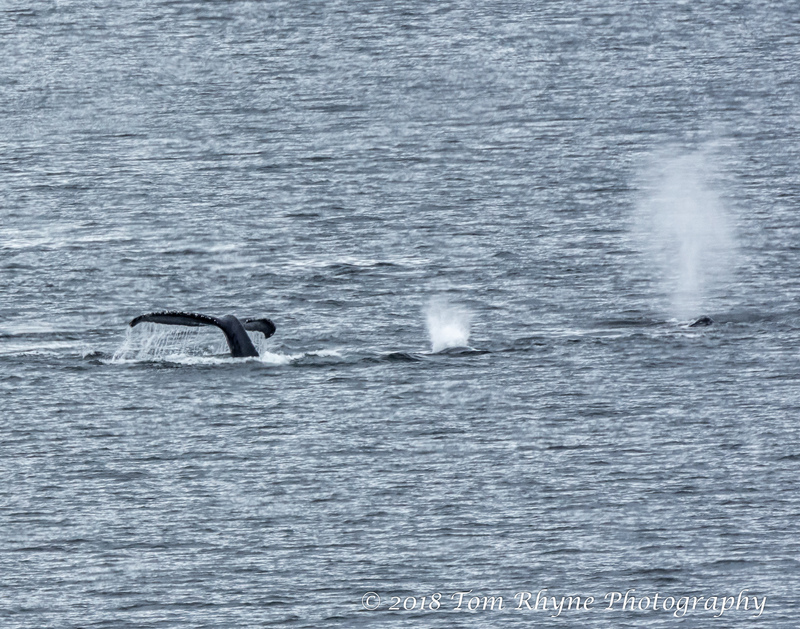 Judging by the backs in view and the number of “blow spouts,” there must have been at least three of them. 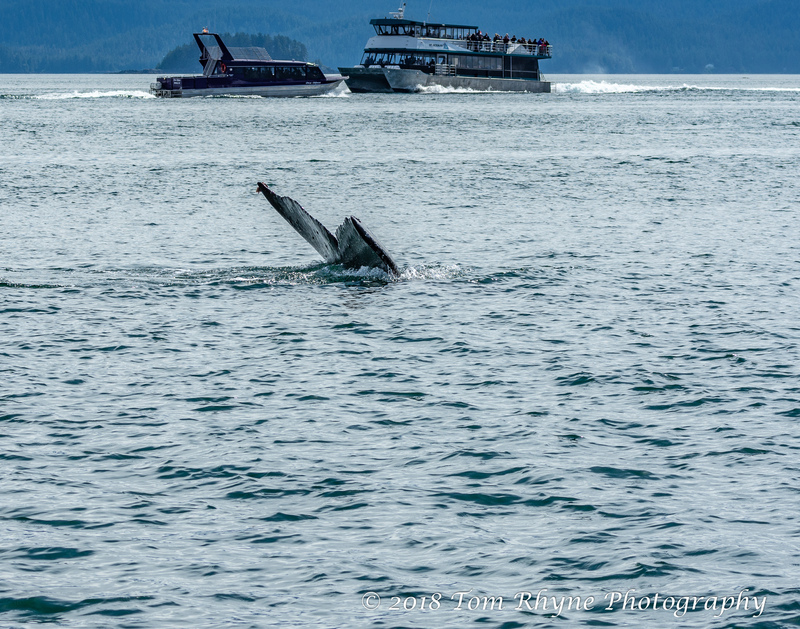 We boarded a jetboat for a whale watching excursion, and the investment paid off handsomely. 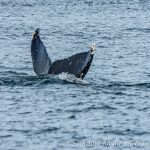 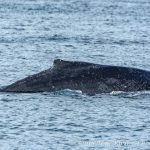 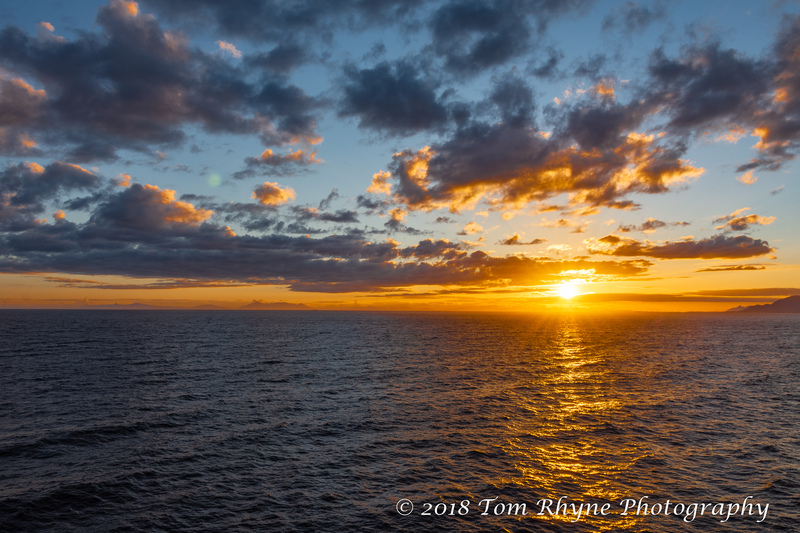 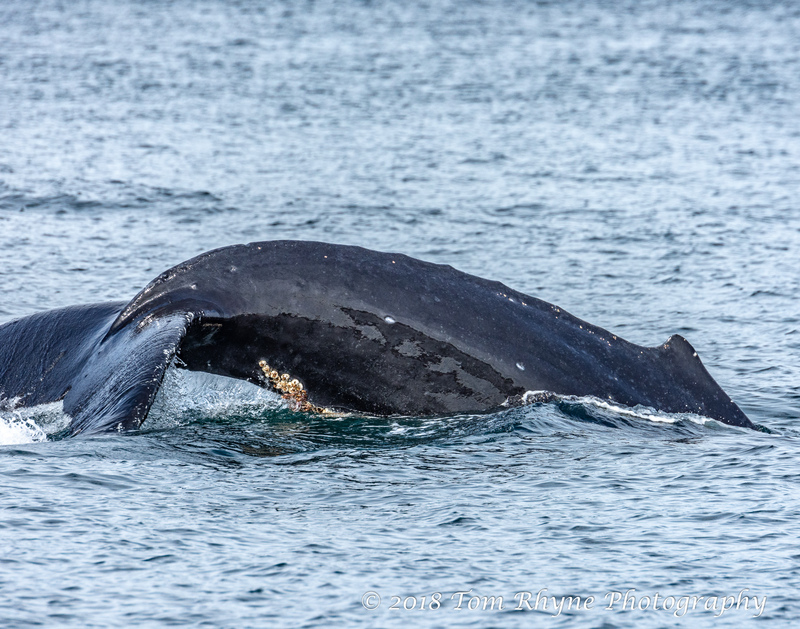 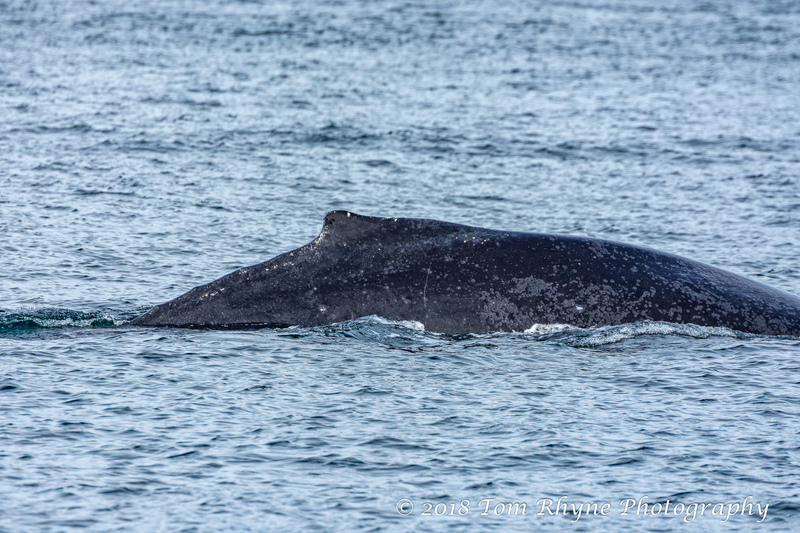 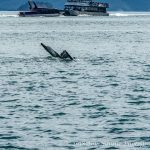 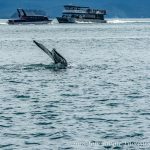 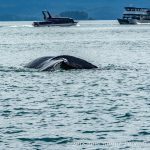 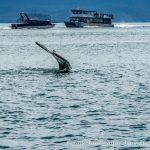 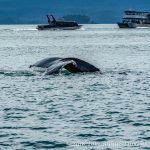 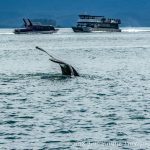 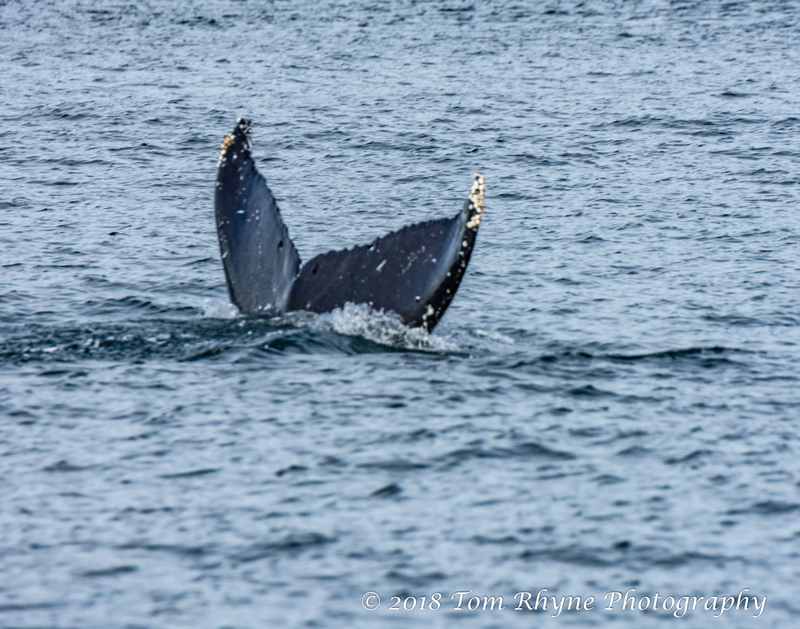 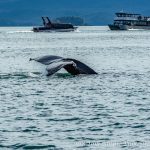 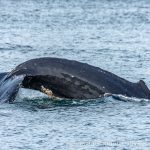 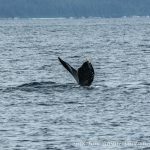 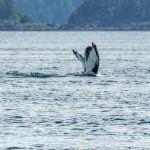 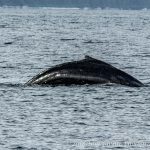 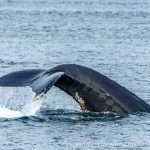 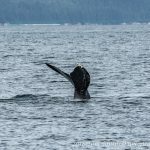 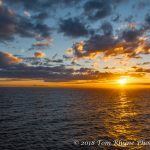 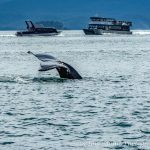 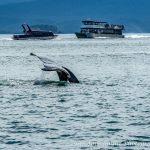 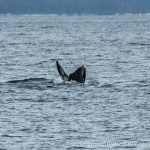 Our captain took us to a secluded spot which gave us a private close encounter (less than thirty yards) with a feeding humpback whale, and then we moved on to less private but more abundant whale sightings. 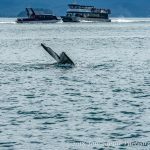 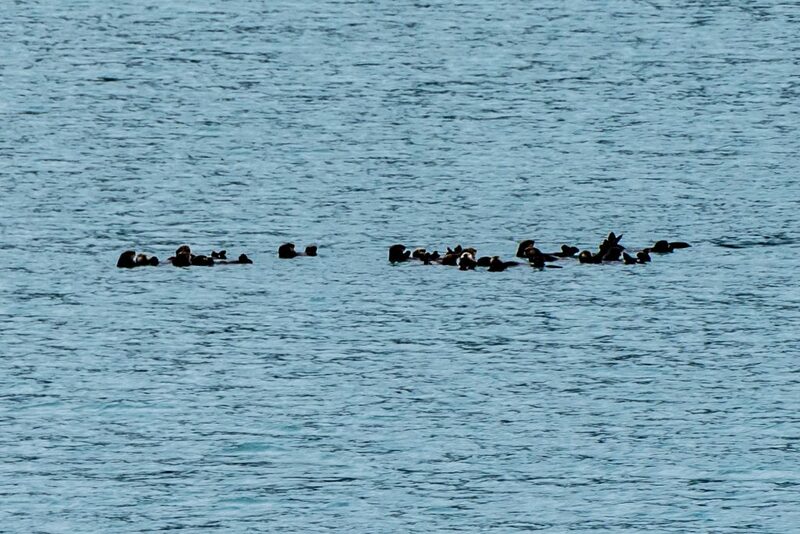 The excursion was exciting and well worth the booking. 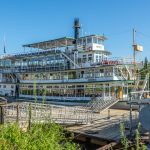 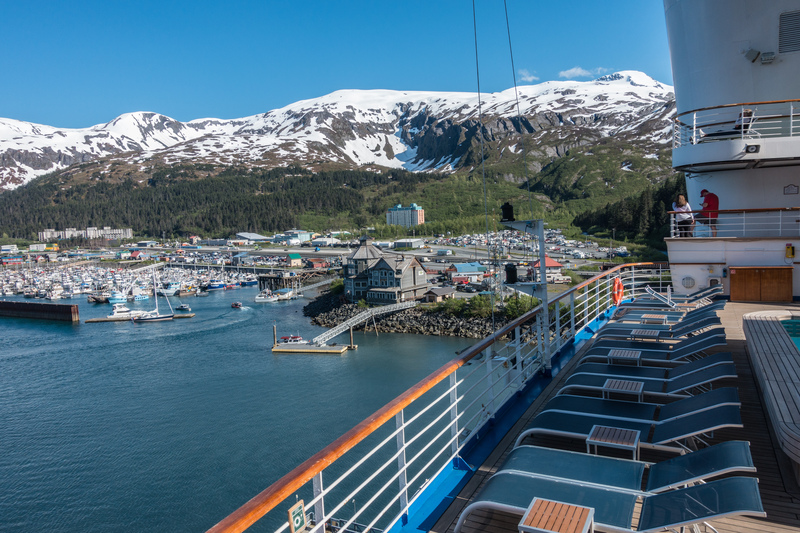 Today we cruise from Glacier Bay to the Alaskan town of Skagway where we walked ashore and explored the Gold Rush theme of the town. 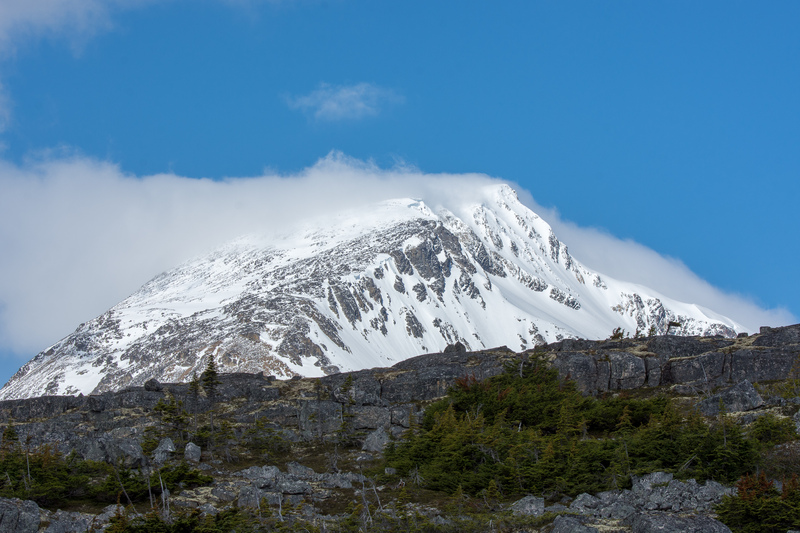 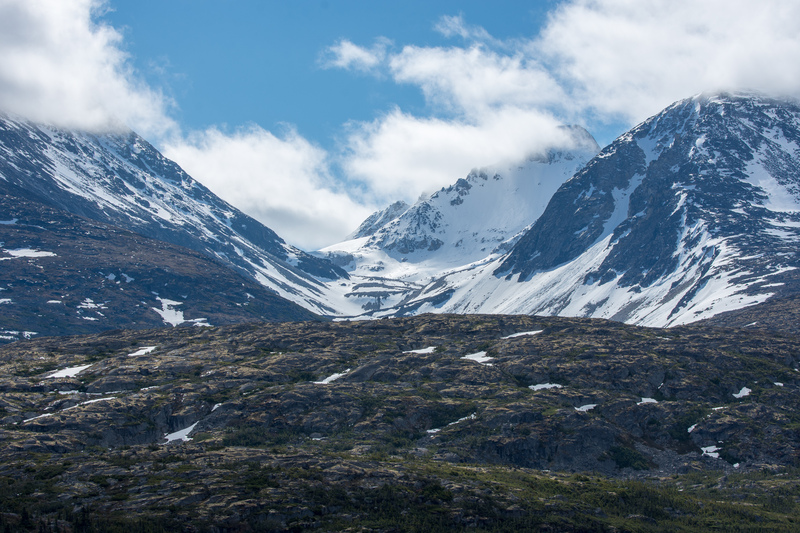 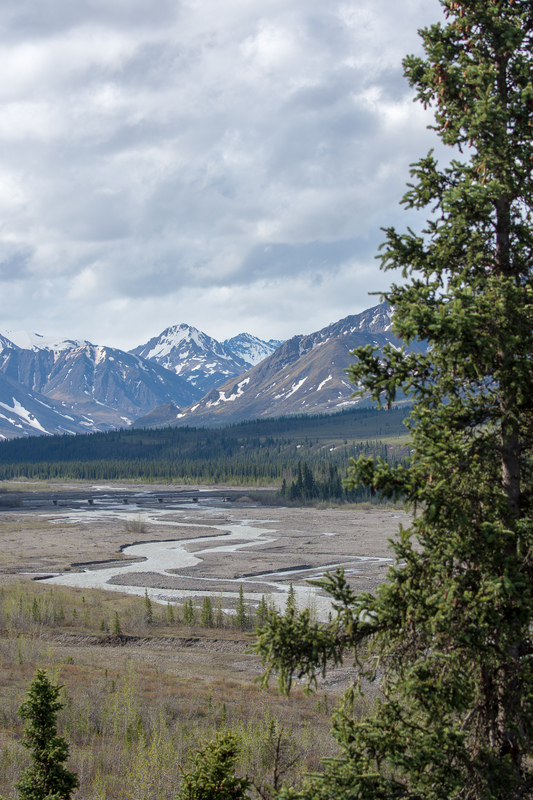 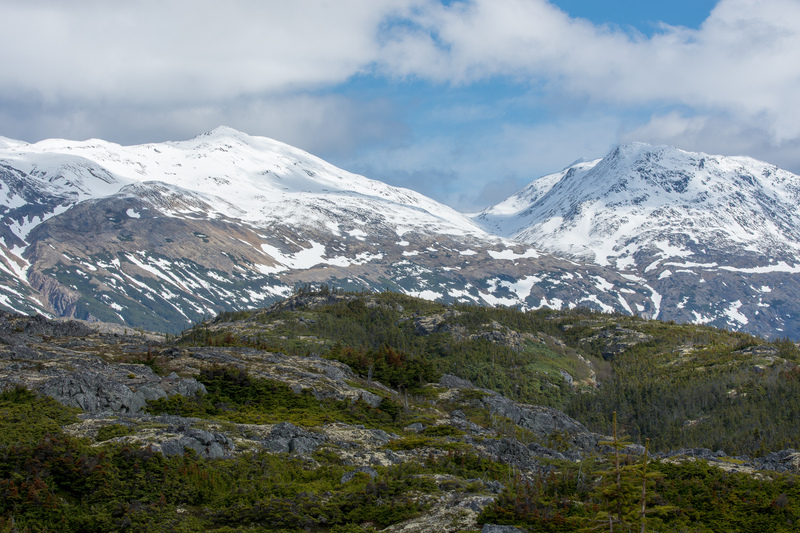 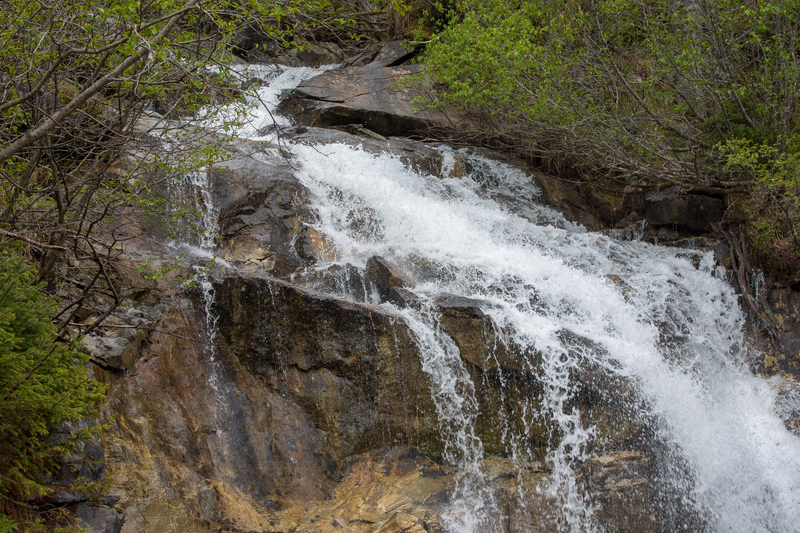 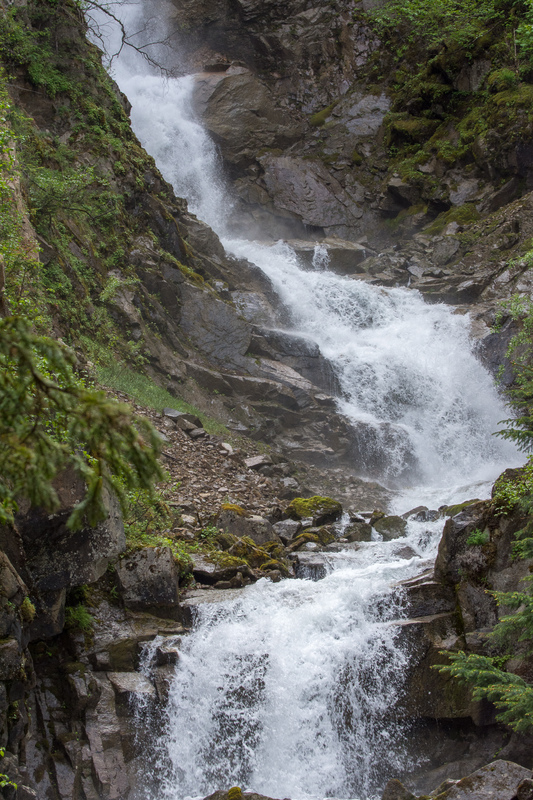 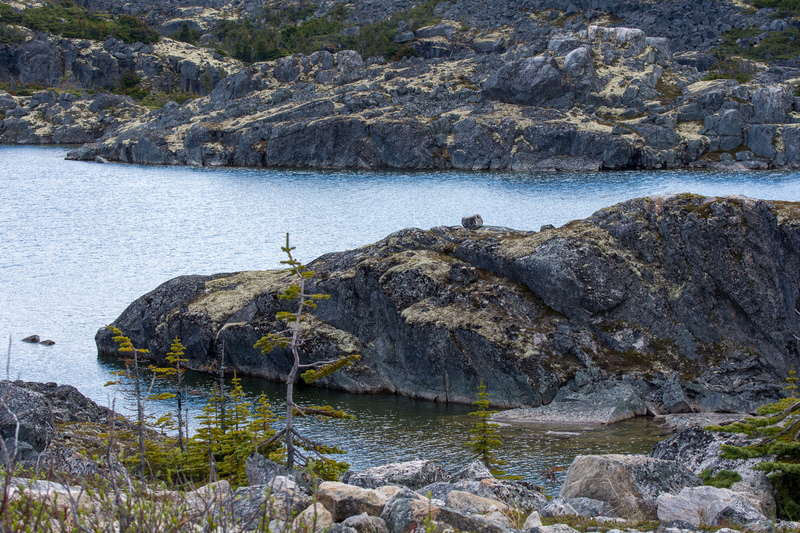 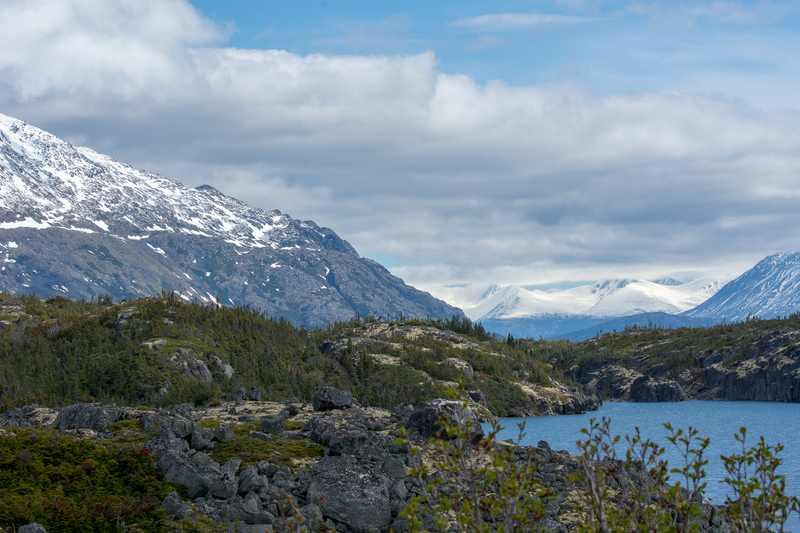 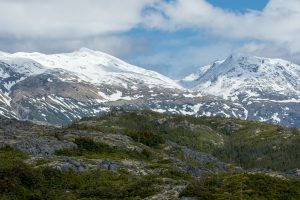 We took a tour of the Chilkoot Trail through mountain passes to the Yukon Territory of Canada. 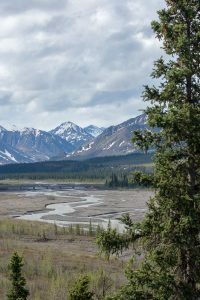 The scenery was fantastic and the terrain suggested perils that men ignored when the call of “gold in the Yukon” lured them on. 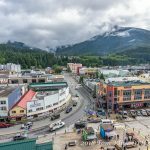 Finding a local yarn shop was a top priority while exploring the town of Skagway, and we had little trouble locating one. 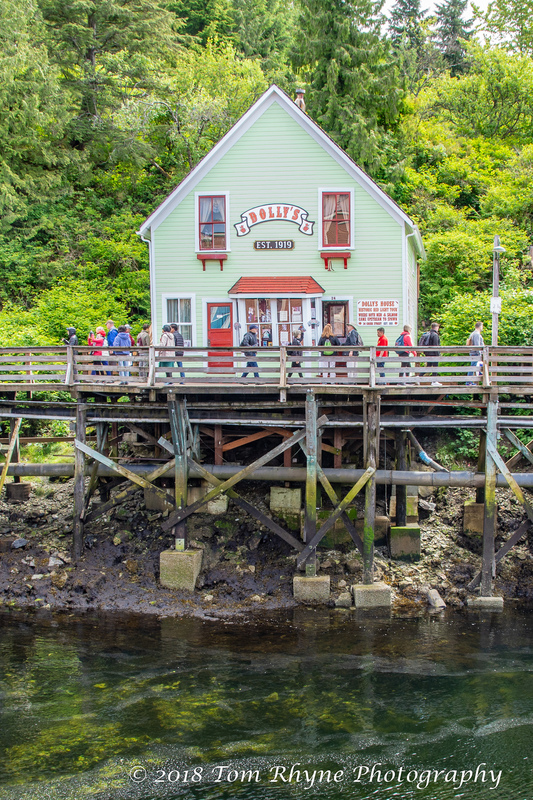 The “knitters’ network” is spread far and wide! 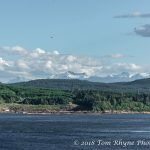 As we entered Glacier Bay National Park we immediately notice the increasing numbers of sea birds surrounding the cruise ship. 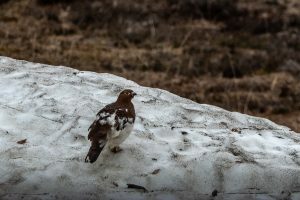 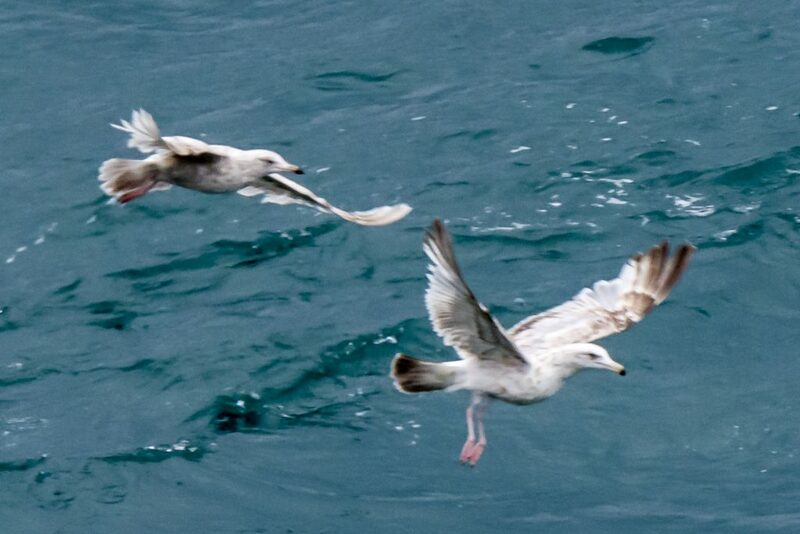 These birds followed us throughout the park as we explored glaciers near the north end of the Bay. 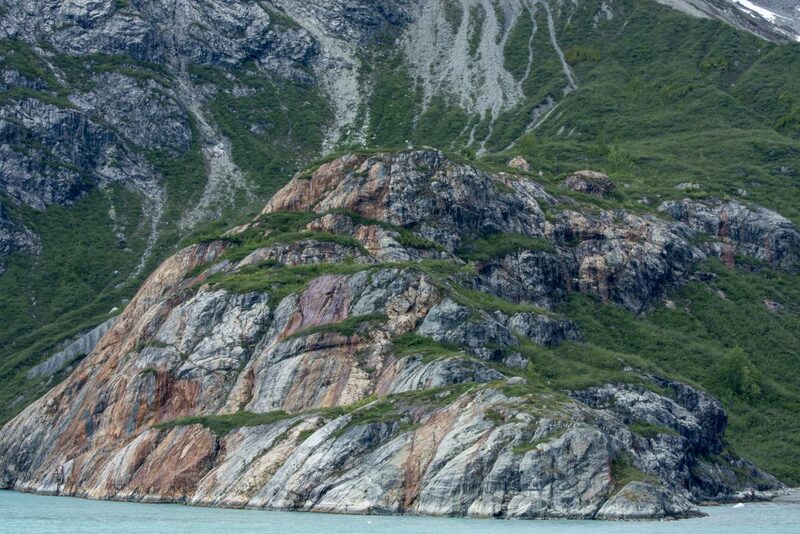 Glaciation over a long period of time in the Bay has produced some beautiful rock formations. 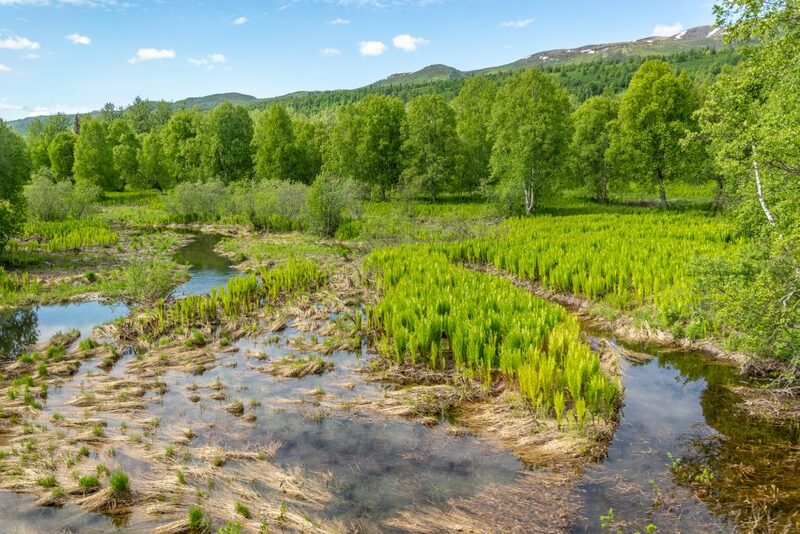 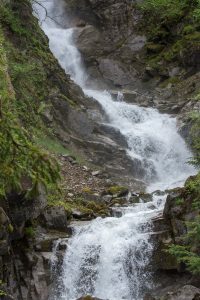 As we toured the Park’s northern borders we were able to closely approach a number of glaciers, some which reached into the Bay and others which were hanging glaciers whose meltwater produced small streams of water flowing down to the sea. 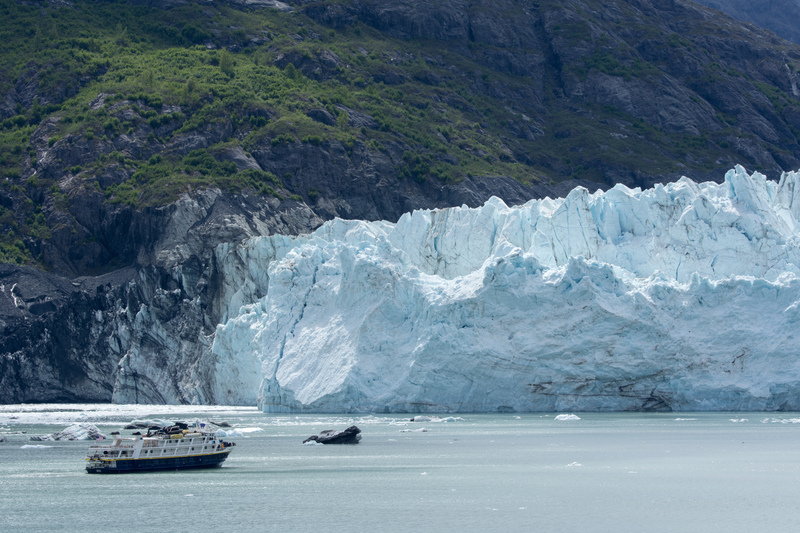 Today we cruised past the mammoth Hubbard Glacier, one of Alaska’s advancing glaciers. It is more than six miles wide where it meets the ocean, and the face is up to 400 feet tall. Icebergs 3 to 4 stories in height aren’t uncommon. 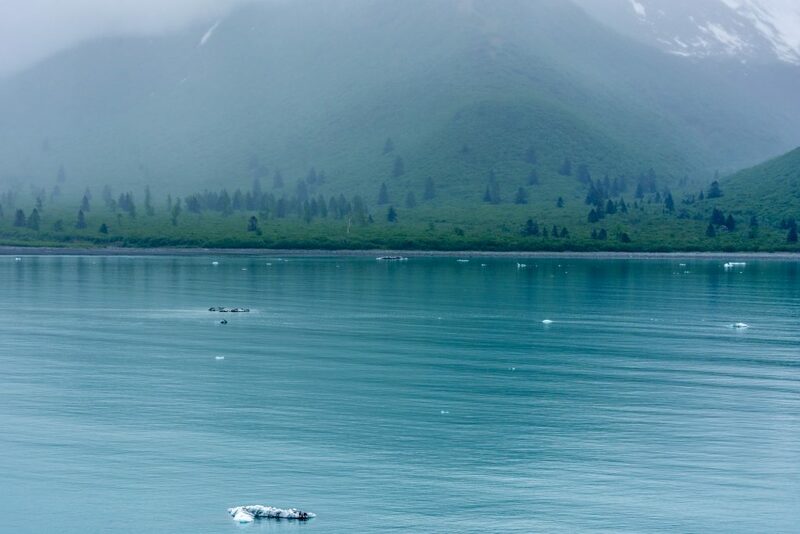 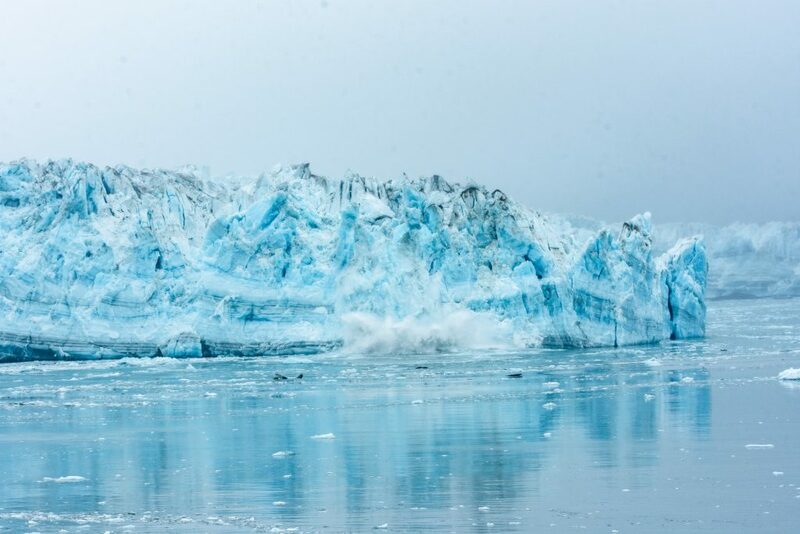 As we approach the glacier, we begin to see small icebergs dotting the water. The sky is overcast and the shoreline has a hazy appearance. 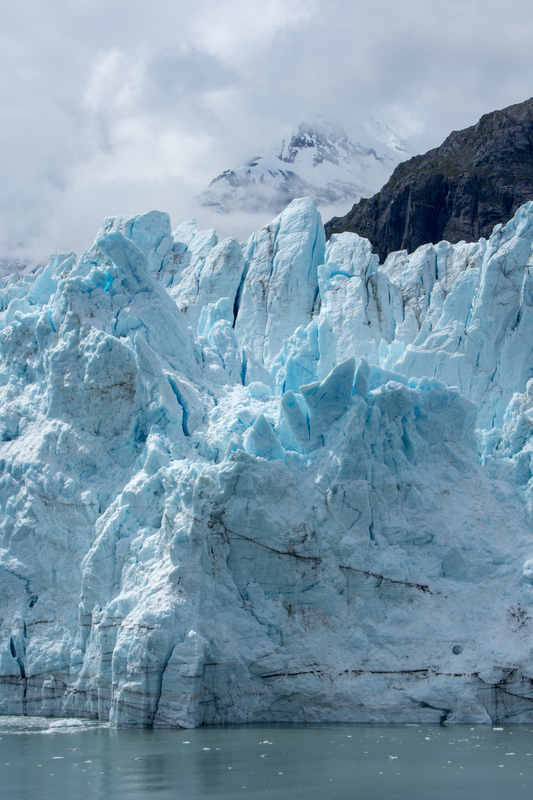 The glacier is massive and from a distance offers little clue as to the actual scale. 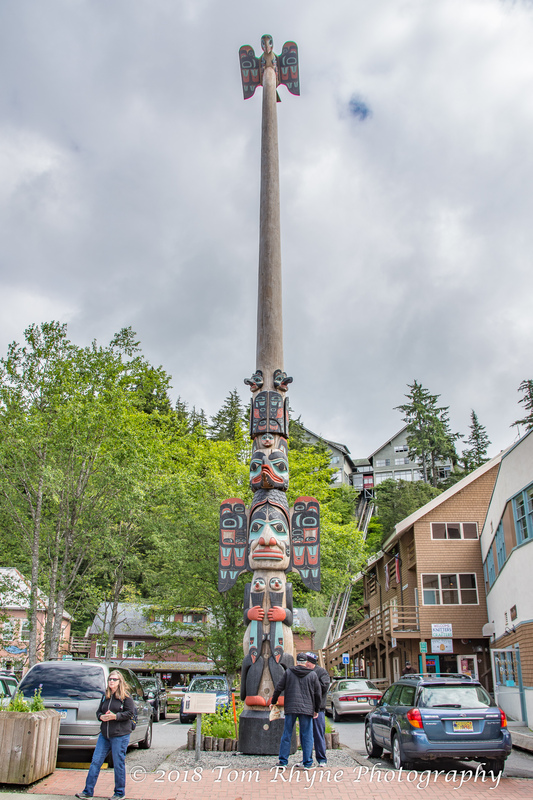 Remember that the face is up to 400 feet tall and about six miles wide. 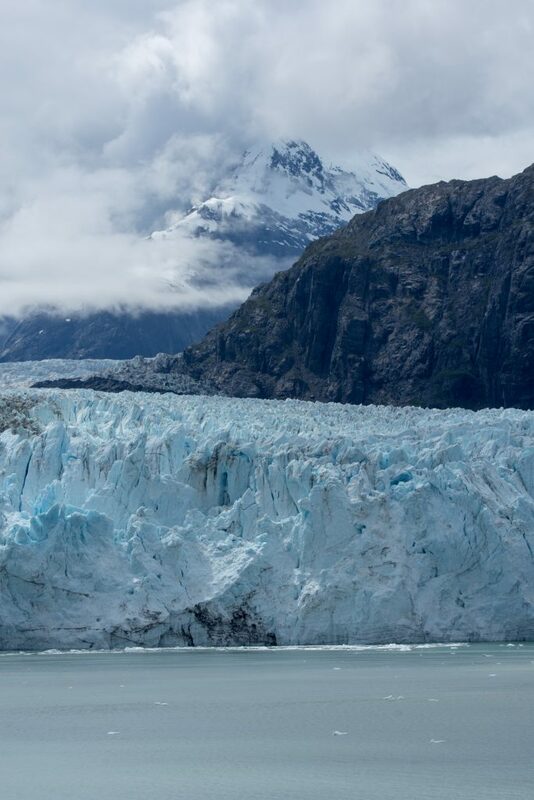 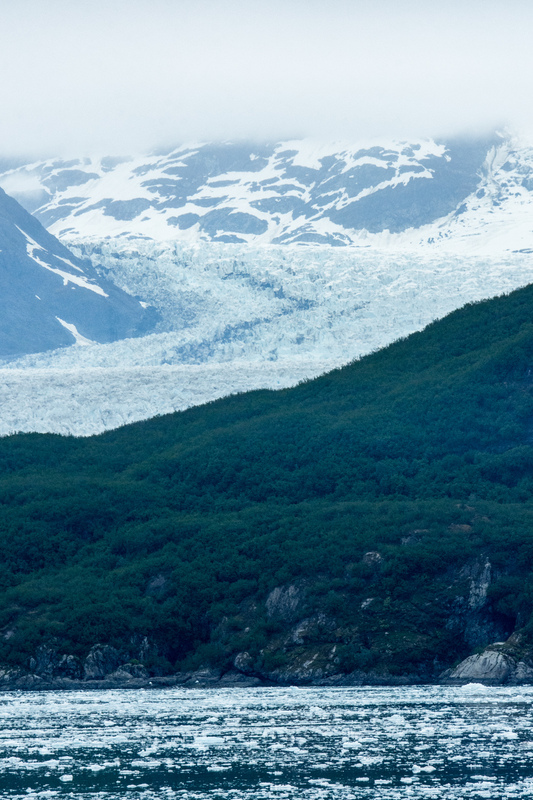 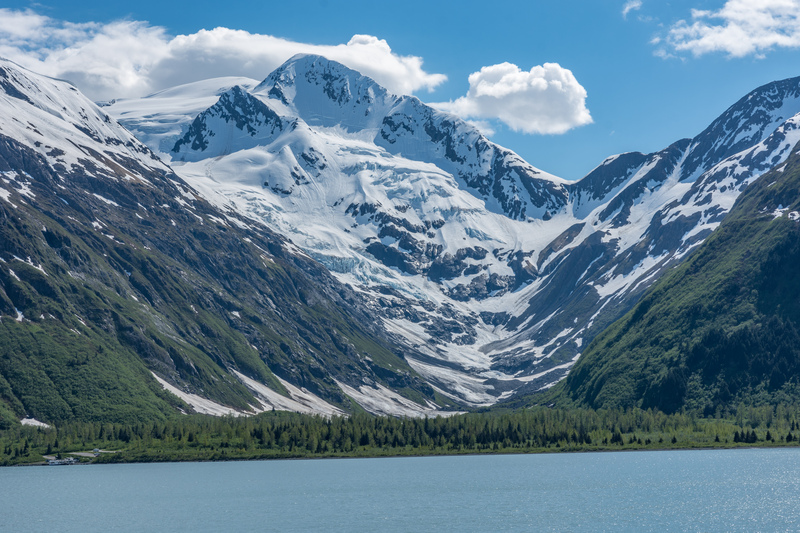 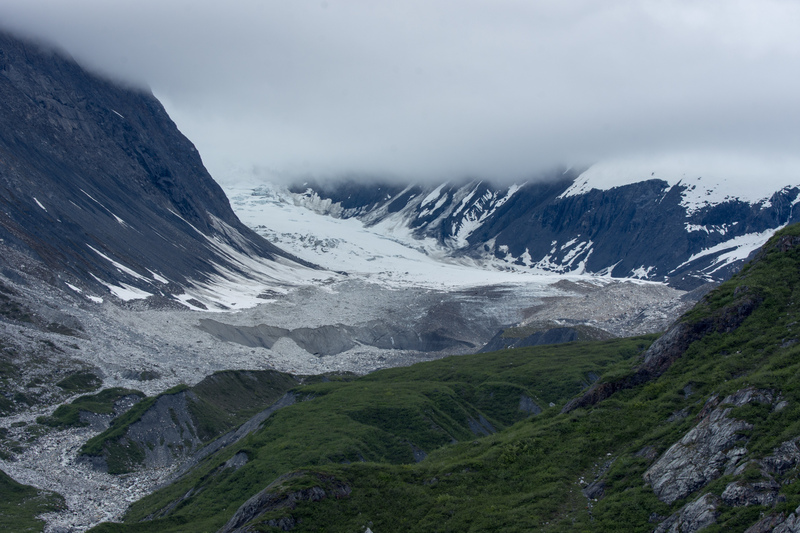 The glacier extends more than 75 miles up into the mountains of Alaska and the Yukon. 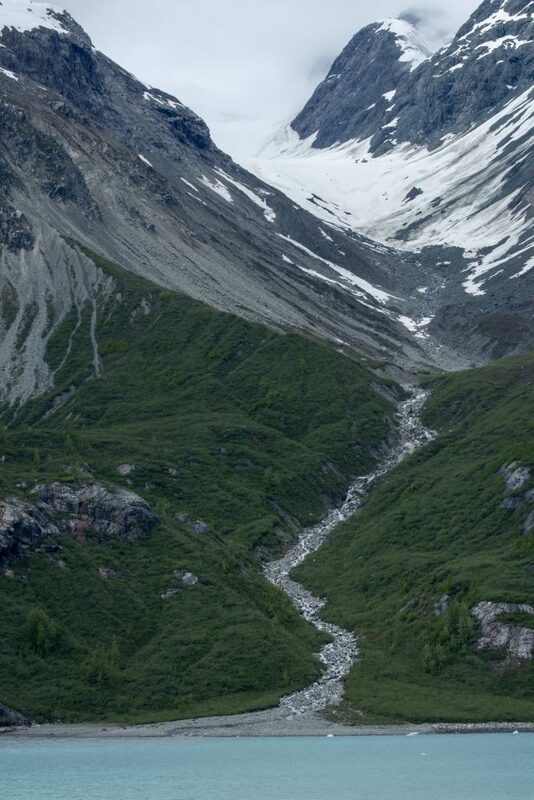 Ice at the foot of the glacier fell as snow, somewhere inland, about 400 years ago. 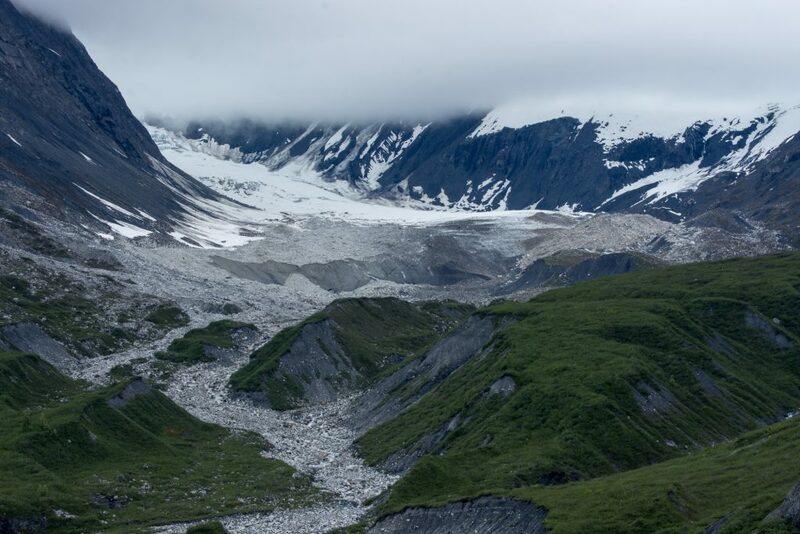 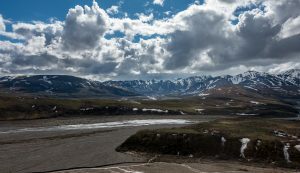 The movement of the glacier is slow enough that it takes about 400 years for compacted snow and ice to travel the 75-mile length of the glacial pathway. 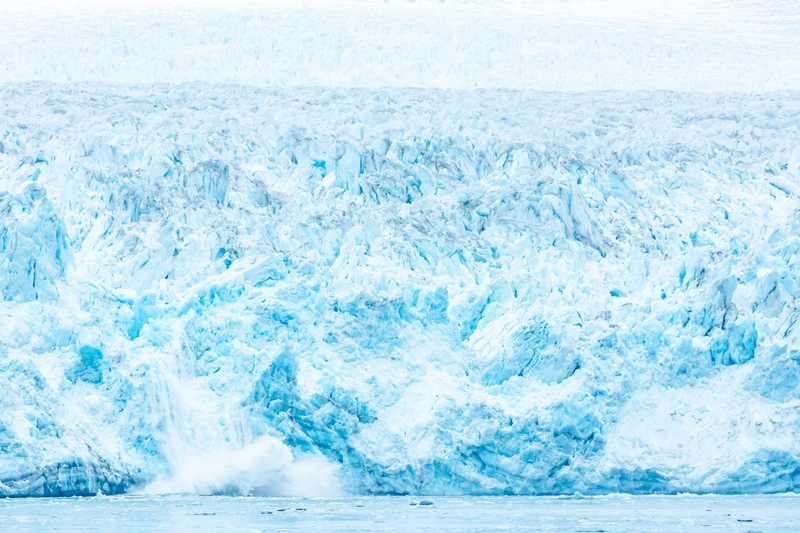 As an active glacier, Hubbard is known to frequently calve, as icebergs break off from the glacier face. 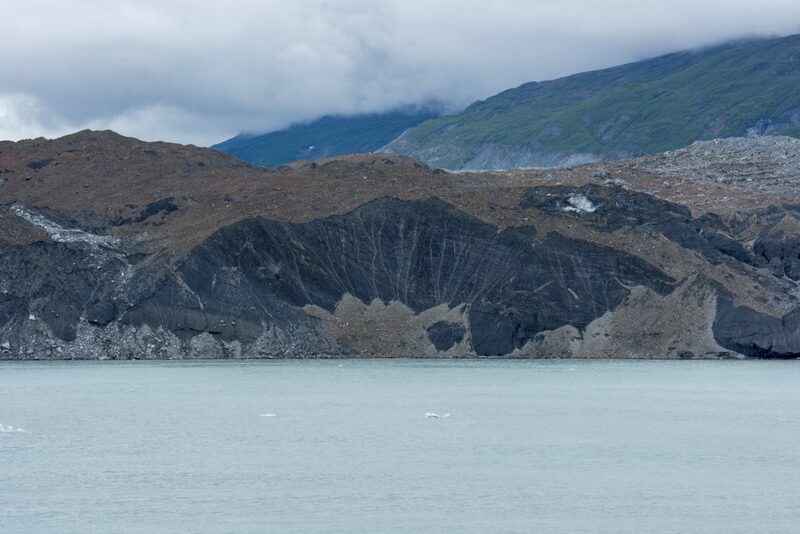 We observed this phenomenon a number of times as we approached the glacier. 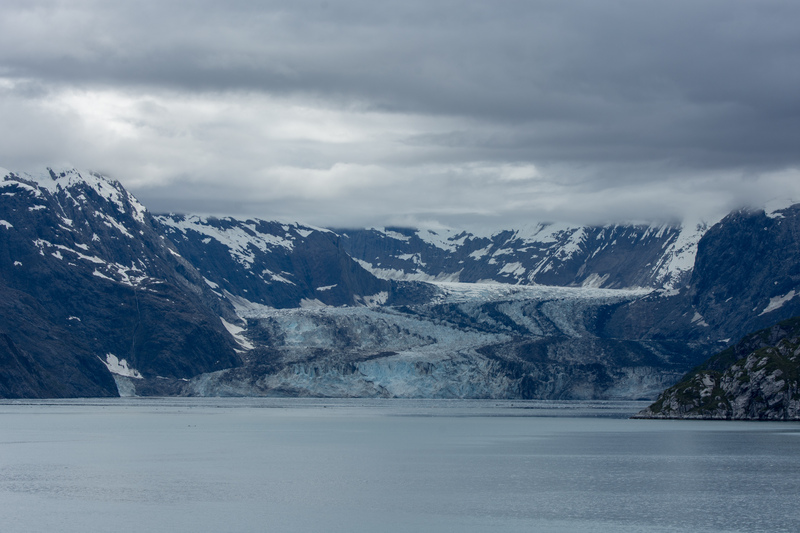 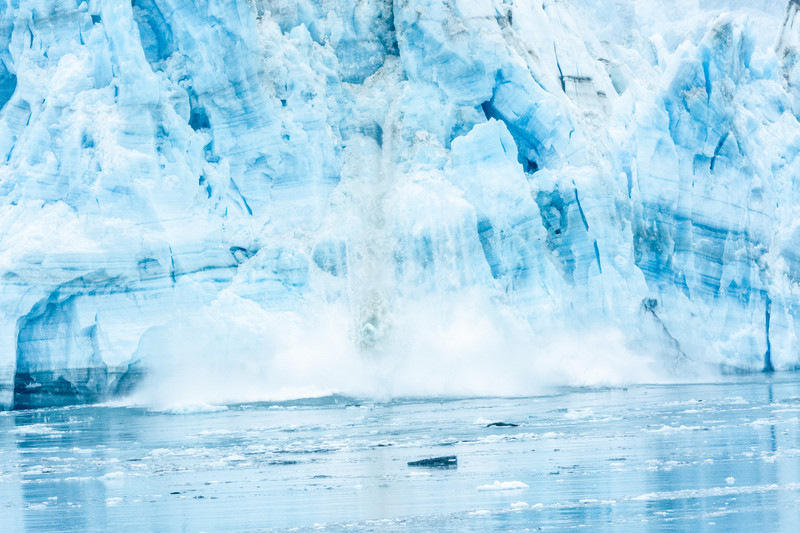 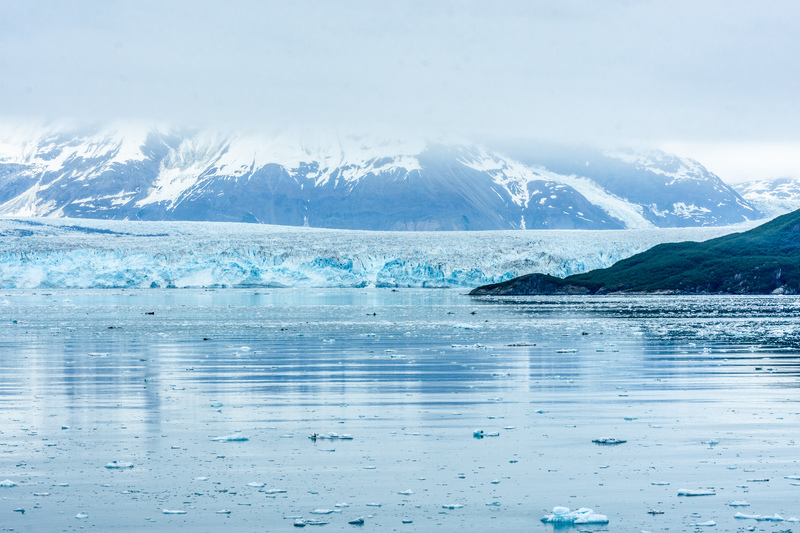 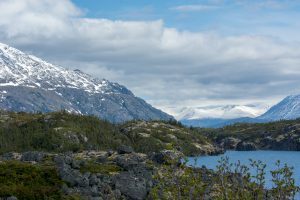 The sounds (creaks, pops, loud cracks) associated with the glacier movement were fascinating, and explosions of sound were produced when the glacier calved. After a long day of glacier watching we joined our table mates for our first dinner together. 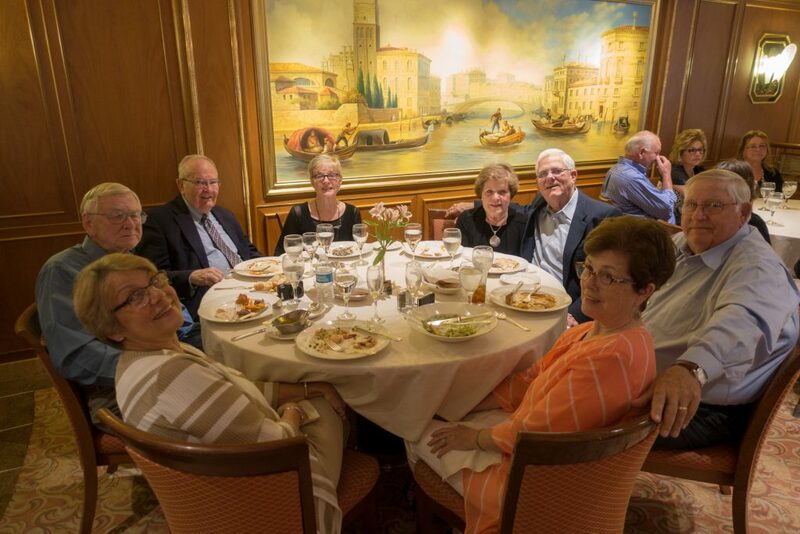 Clockwise around the table are: Tom and Billie Rhyne; Elmire and Dave Barrios of Thibodaux, LA; Jim and Judy Brady of Maumelle, AR; and Nancy and Gary Weir of Maumelle, AR. 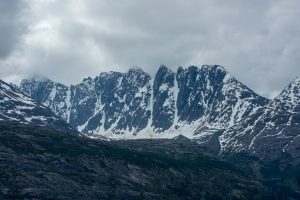 Today we traveled from the Mt. 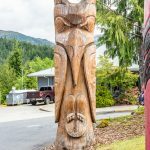 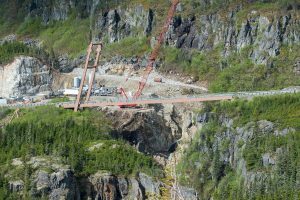 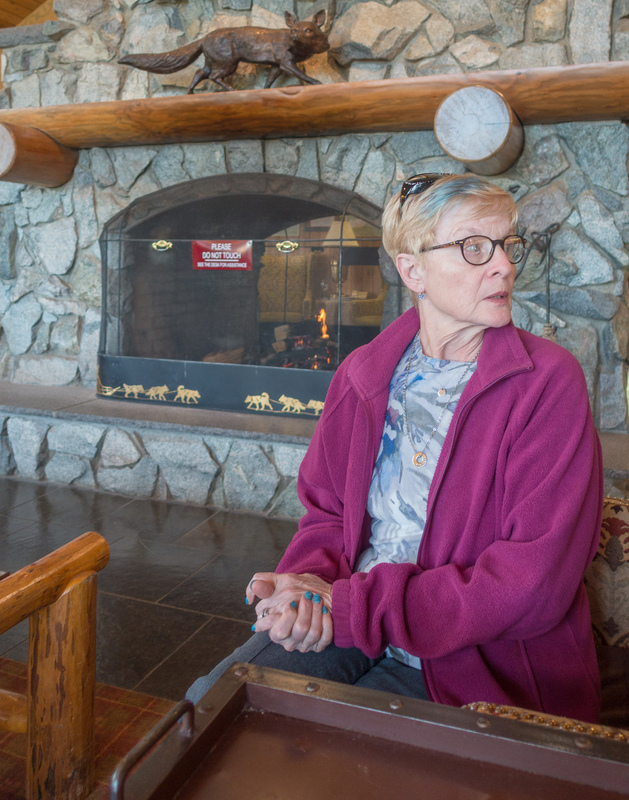 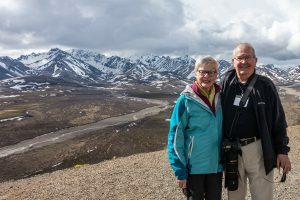 McKinley Wilderness Lodge to meet our cruise ship at the port in Whittier, passing through Wasilla and Anchorage, then along the Turnagain Arm of the Cook Inlet, and finally through the tunnel to Whittier. 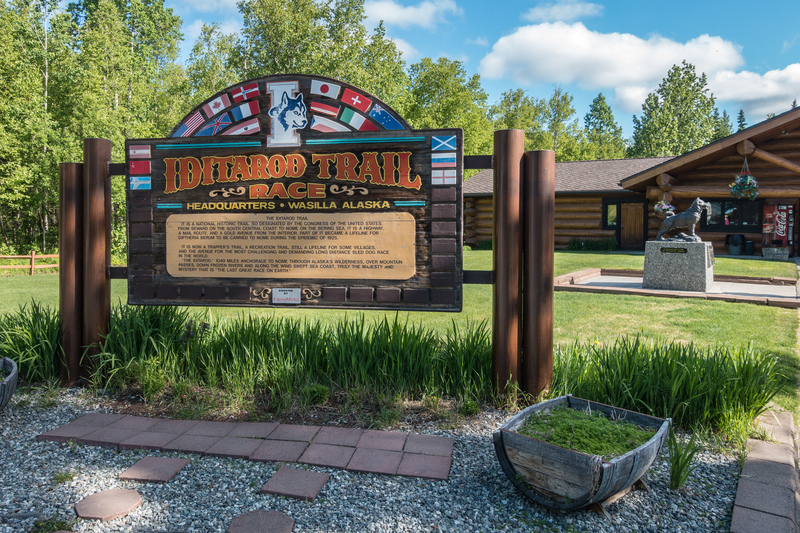 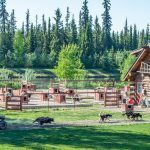 At Wasilla we visited the Iditarod headquarters and rode behind a real team of sled dogs. 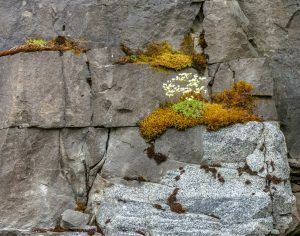 What a rush! I recorded a video of this ride, but so far I can’t get it to load properly and play on this site. 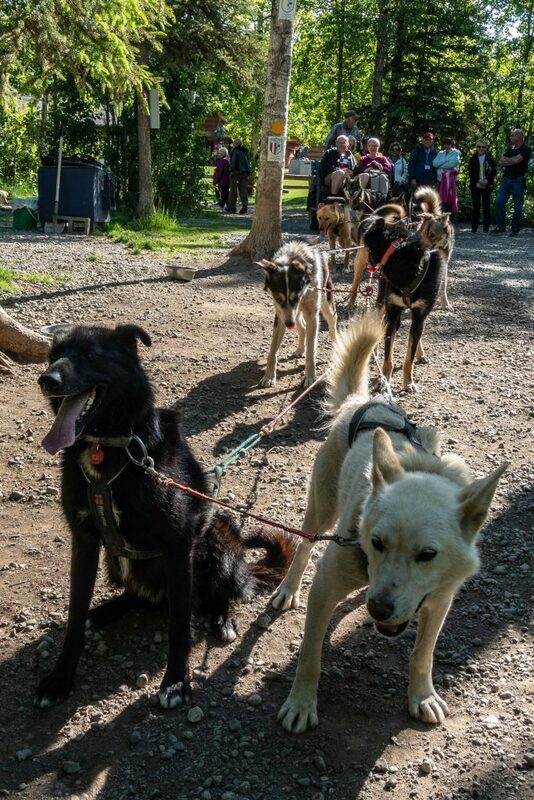 Trust me, it was a rush and we were really moving! 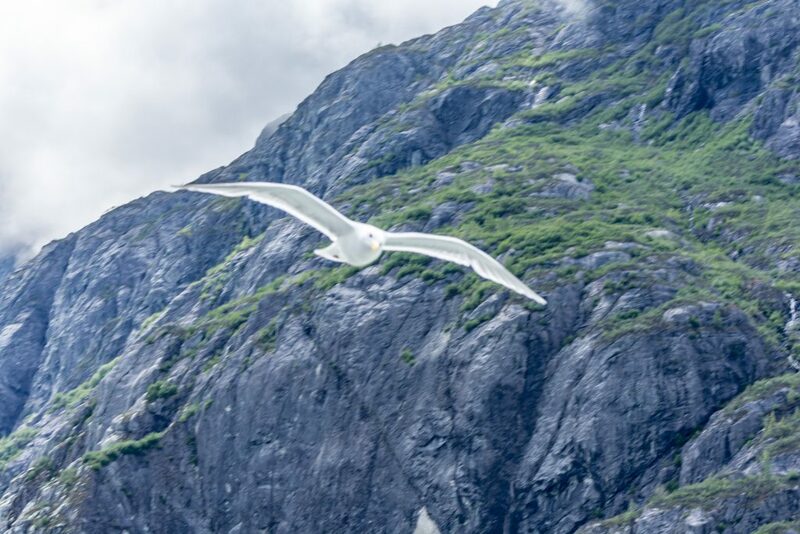 Come visit and I’ll play the video for you. 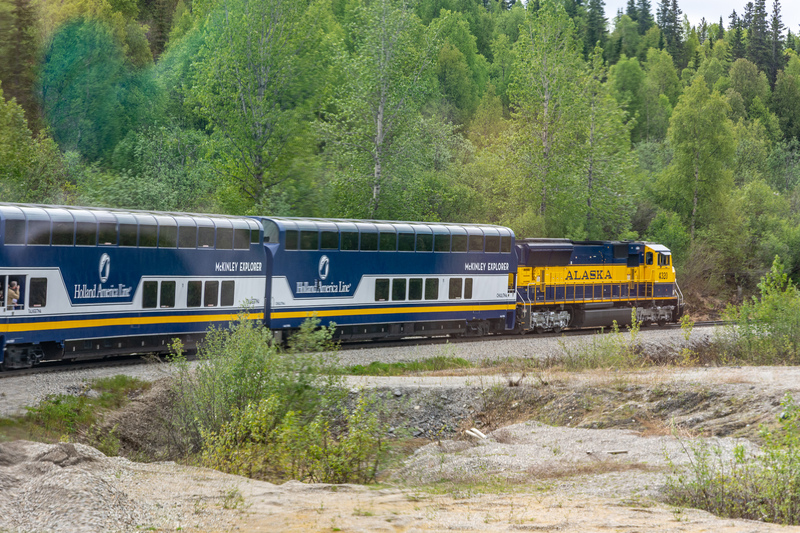 Next stop is Anchorage, the largest city in Alaska. 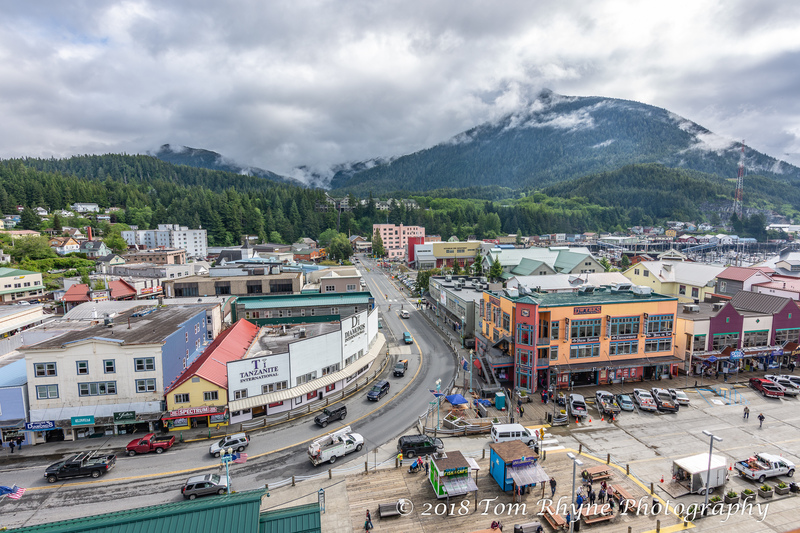 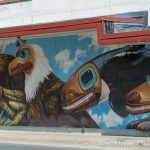 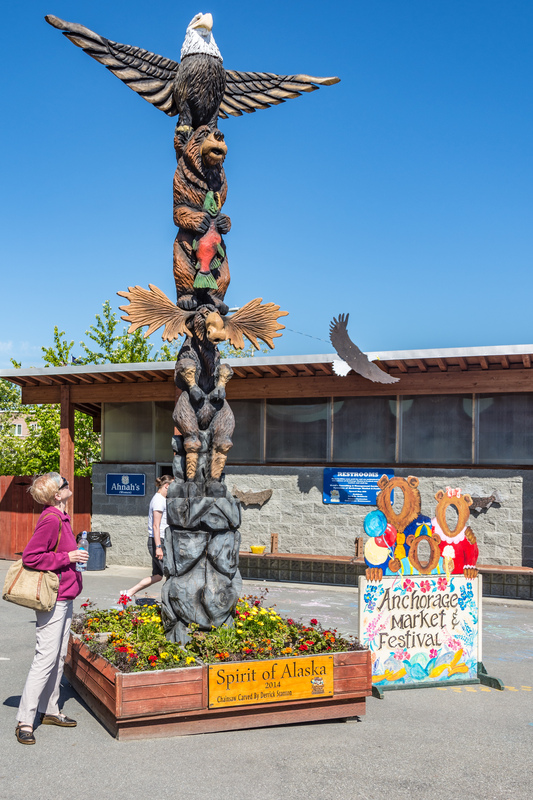 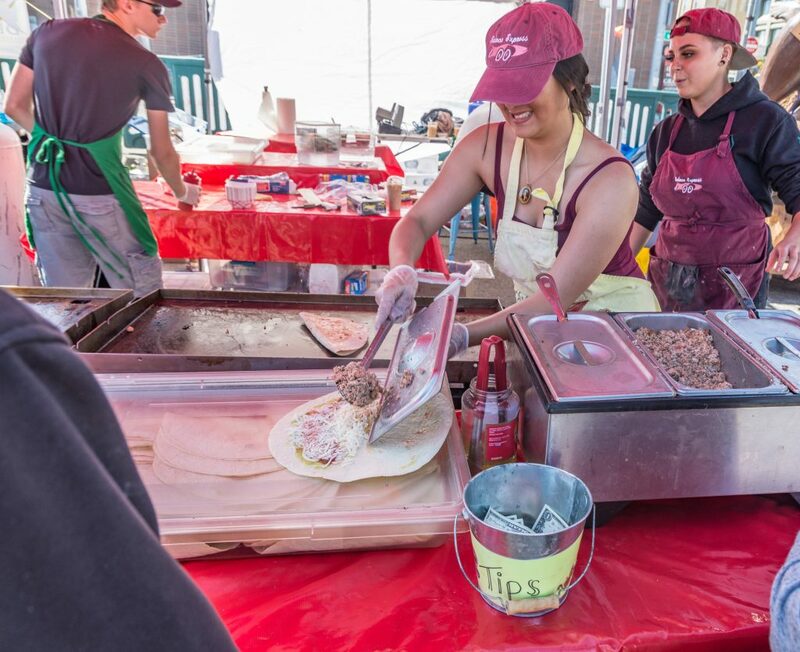 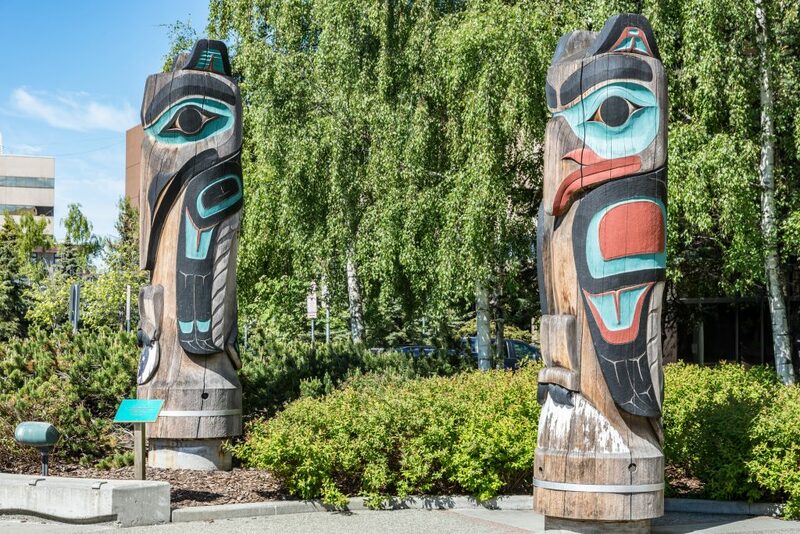 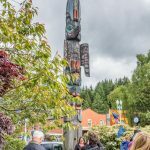 We took a short motor tour and then explored the city on foot, beginning with the Anchorage Market and Festival (it looked like a big Farmers’ Market to me) where we had salmon quesadillas for lunch. We were entertained by cloggers/singers who might have come from Nashville, and then we took in the city sights. 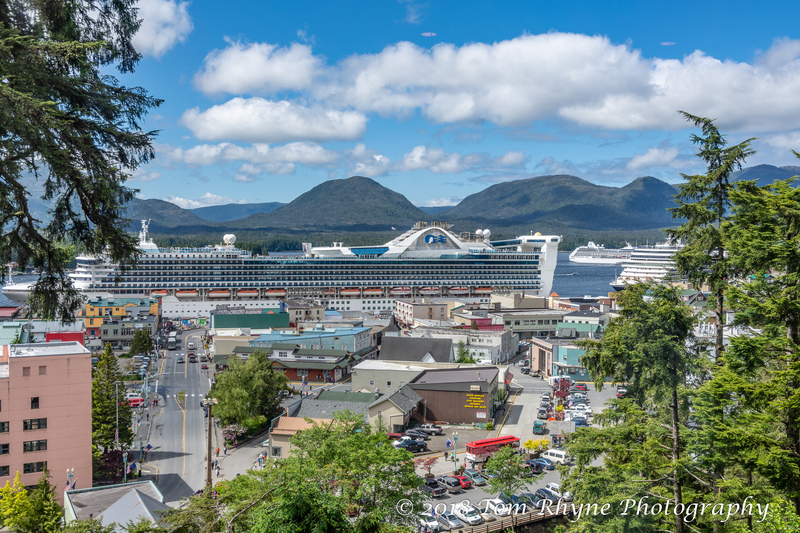 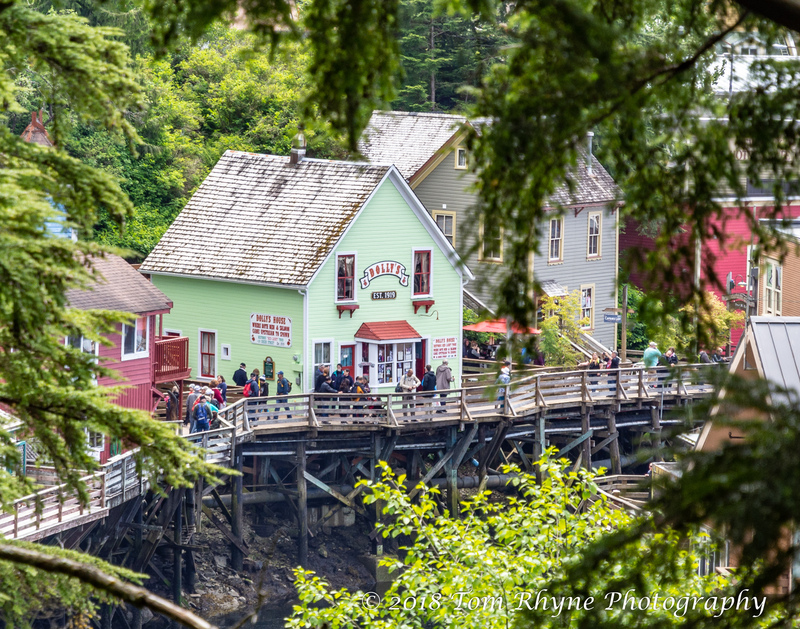 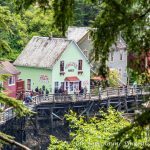 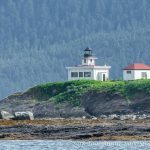 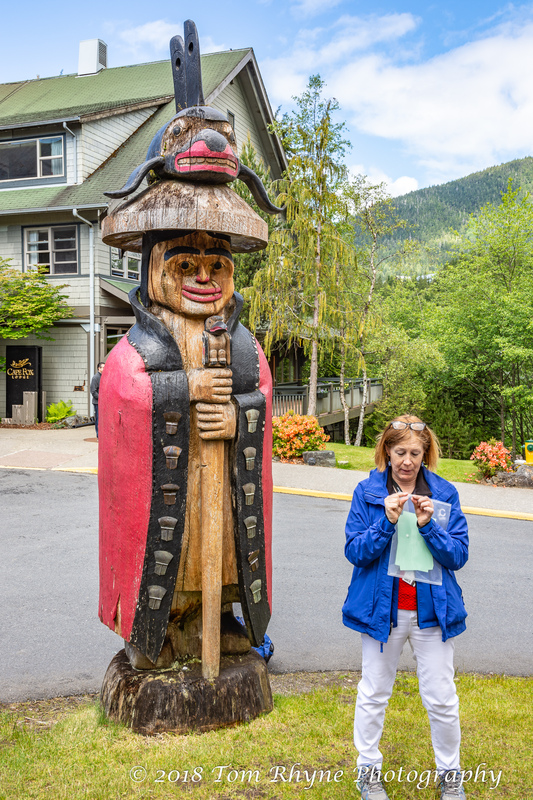 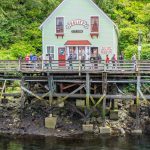 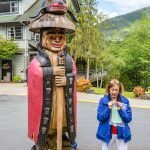 Our ultimate destination today is the cruise ship harbor at Whittier, but we have another stop or two before we get there. 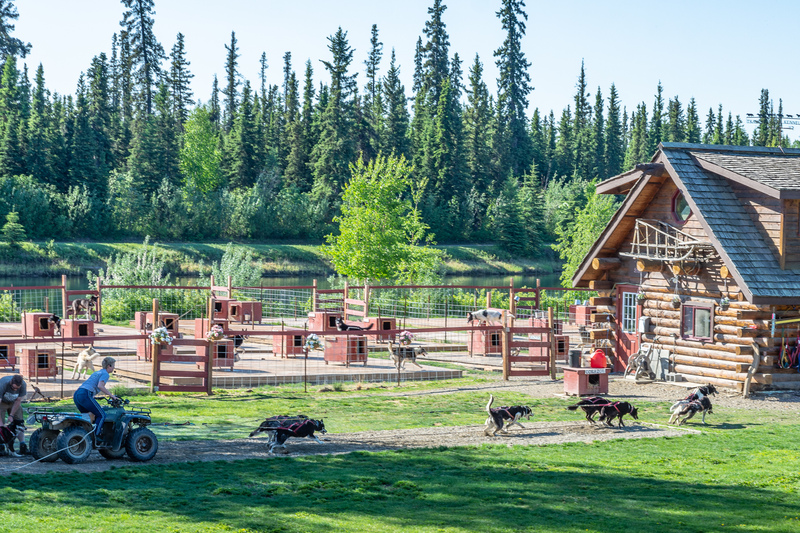 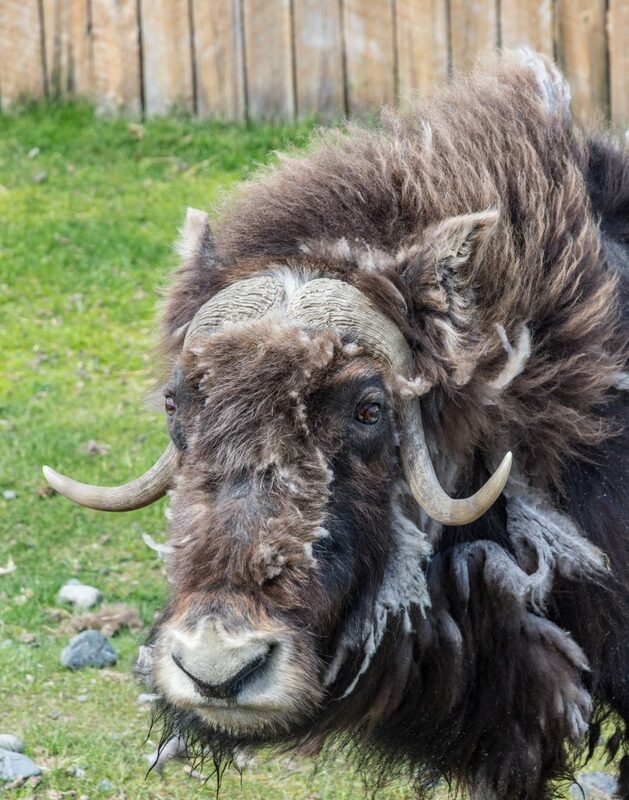 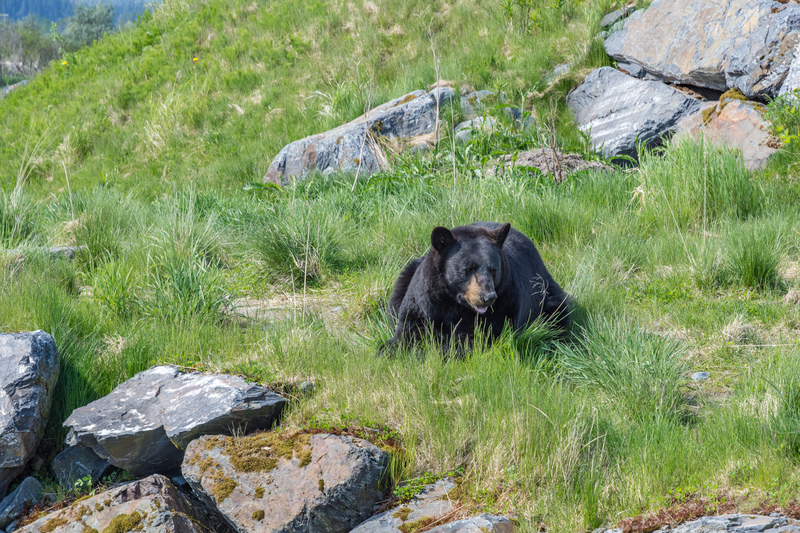 We spent some time at the Alaska Wildlife Conservation Center in Portage before setting out for Whittier. 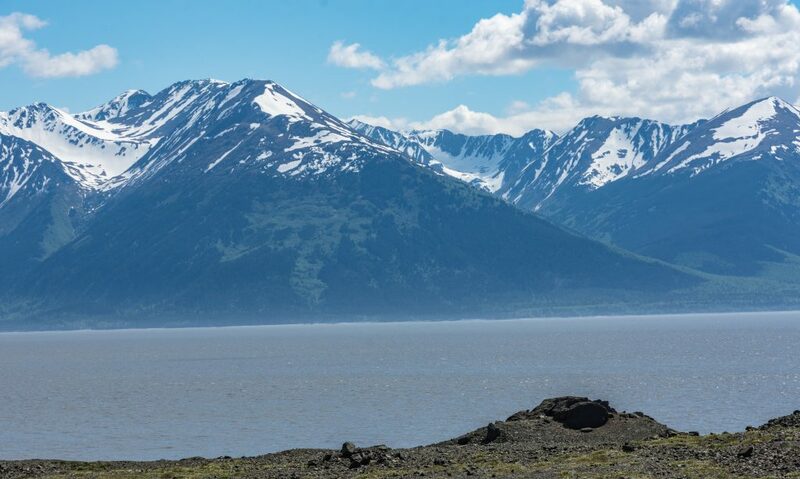 Our roadway took us along the Turnagain Arm which is one of two branches off the Cook Inlet. 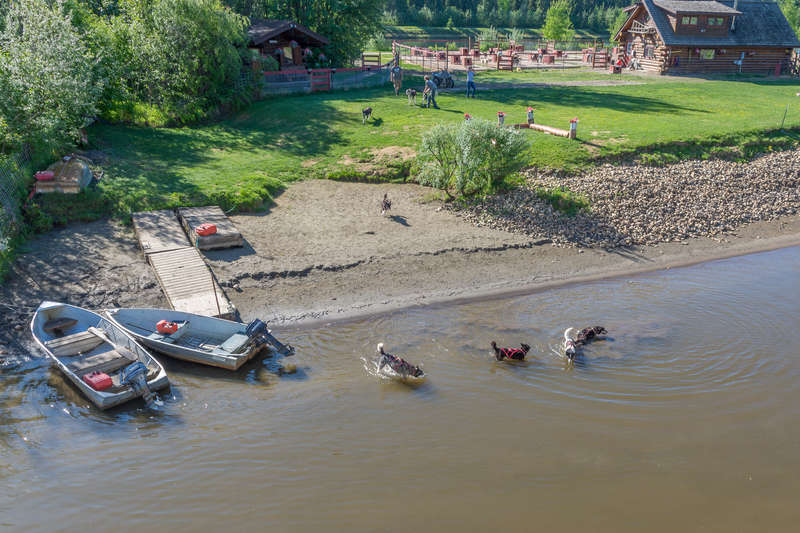 This Arm has the second-highest tides (behind those in the Bay of Fundy) in the world, and the spring tidal bore gives surfers a thrill. We found the area to be beautiful! 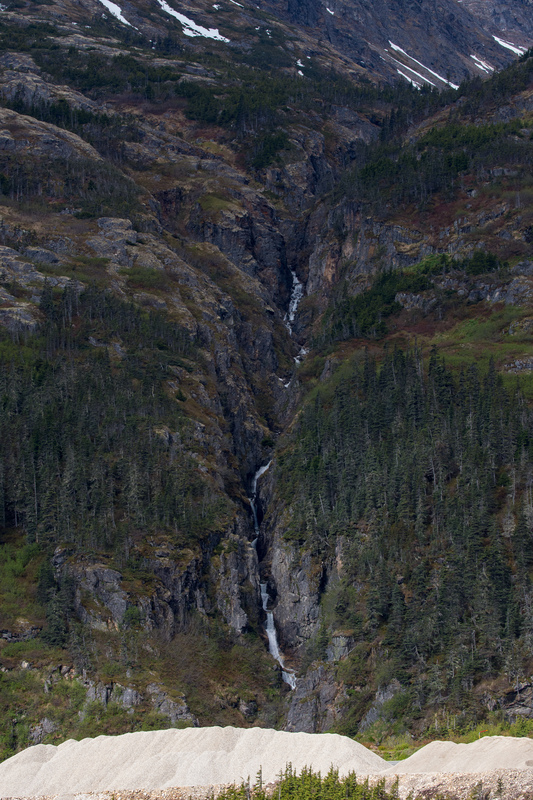 Whittier is reached by traveling through a 2.5 mile tunnel, the Anton Anderson Memorial Tunnel. 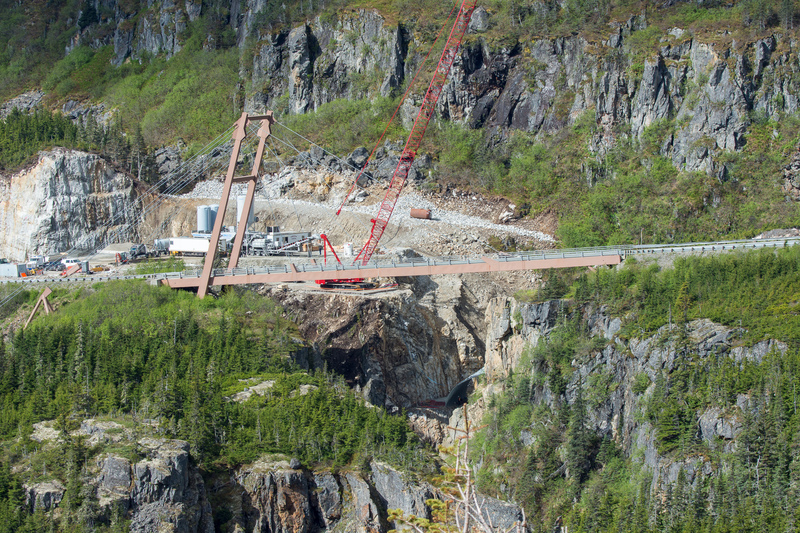 This tunnel carries railroad traffic, motorized vehicles to Whittier, and motorized vehicles from Whittier, alternating the flow since the tunnel is only one lane wide! 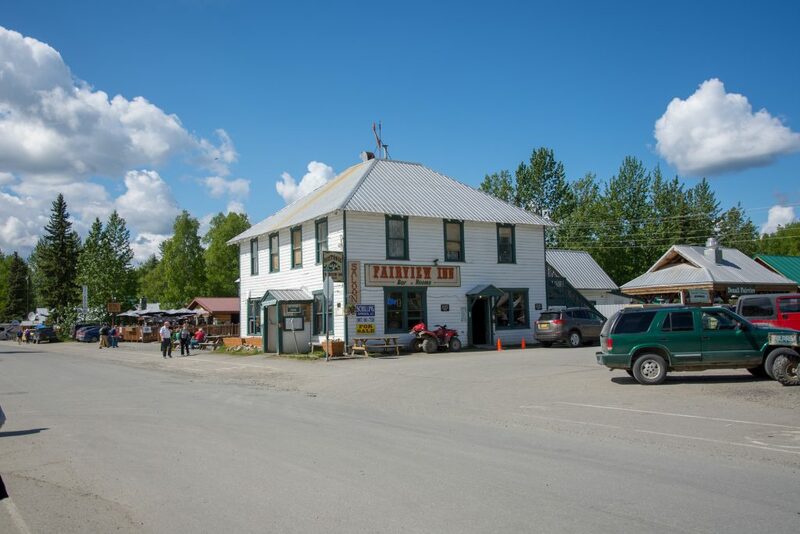 One must have an appointment to go through at a particular time. 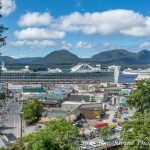 We made our appointment time and after a flurry of activity we boarded the Golden Princess and found our stateroom on the Lido deck. Now the second part of our fantastic trip begins! Today we boarded the train for Talkeetna, AK. 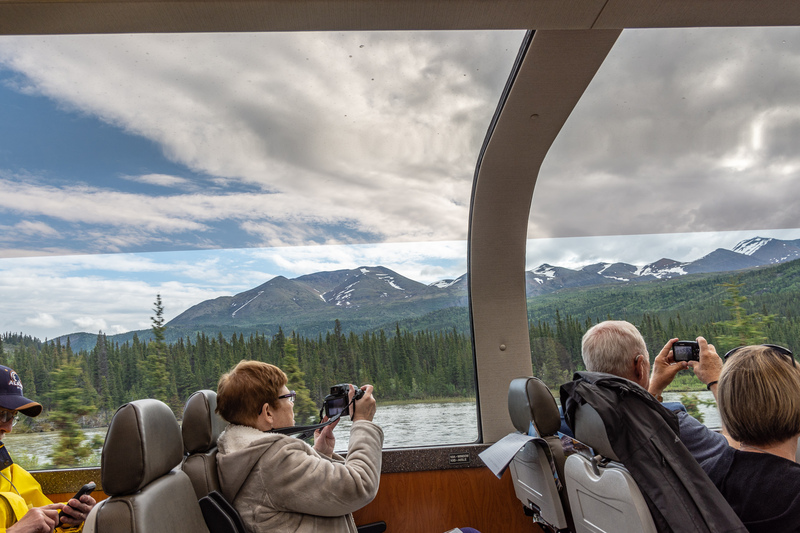 These observation cars gave us a great view of the surrounding mountains and, at one point, another chance to view Denali. 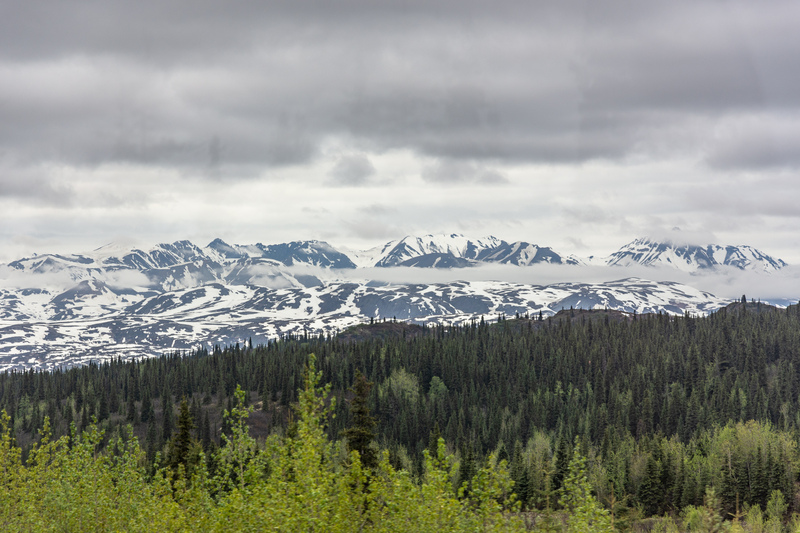 Unfortunately, the mountain was shrouded in snow clouds as we passed the viewing point. 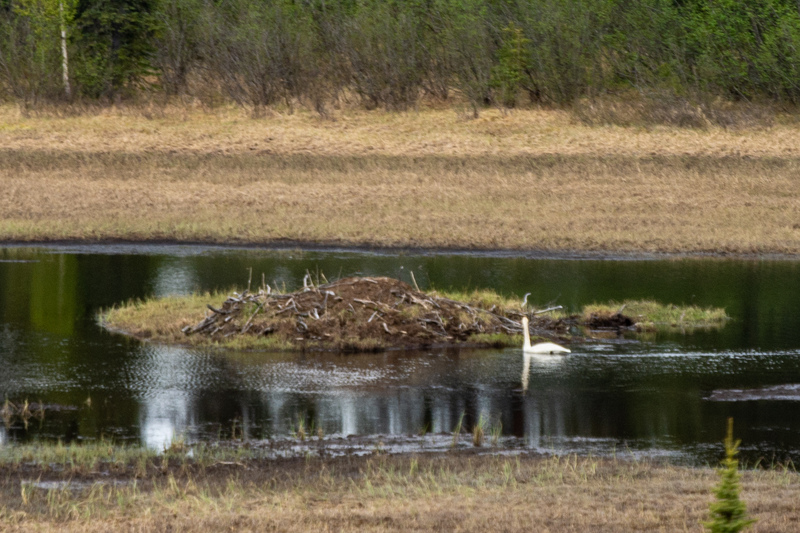 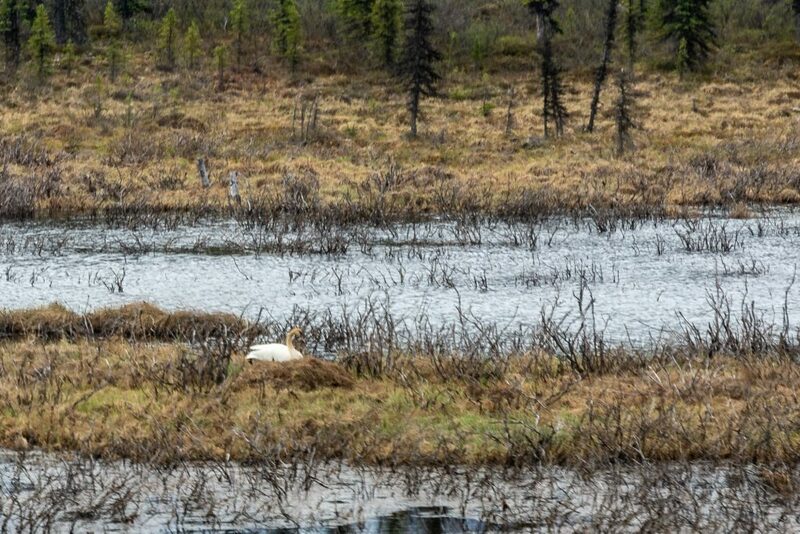 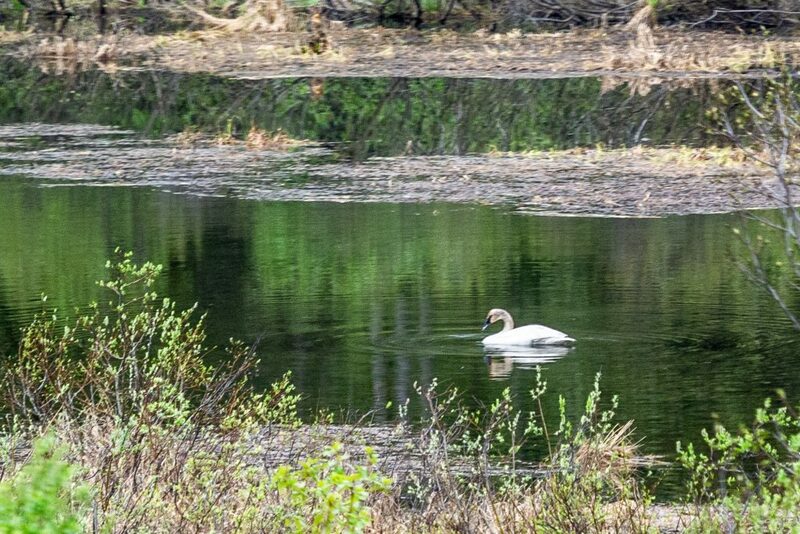 We saw several nesting trumpeter swans on protected island areas near the tracks. The scenery we passed on this trip was as gorgeous as any we had seen and it seemed to change constantly as we moved south. 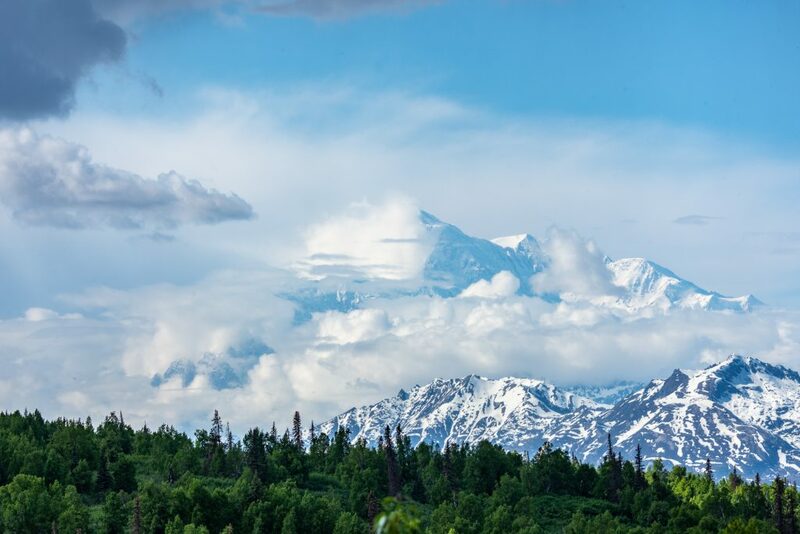 Unfortunately we were not able to see Denali because it was covered by snow clouds. 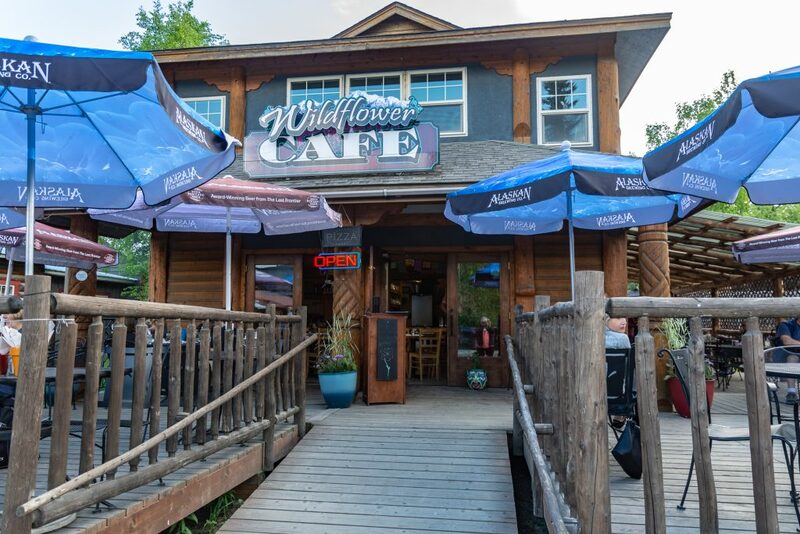 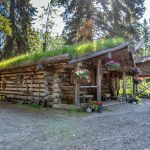 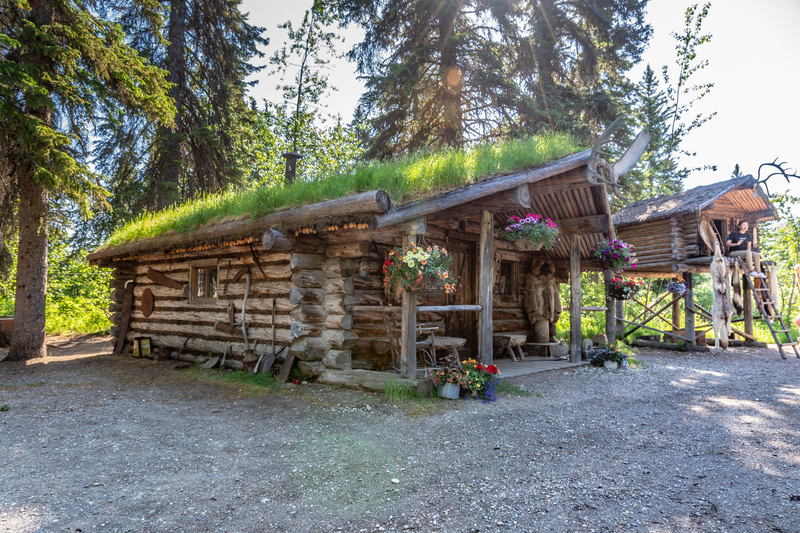 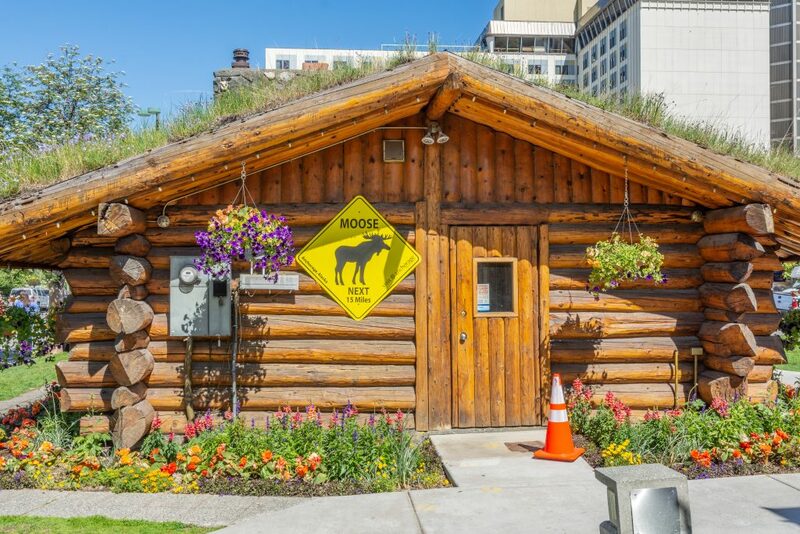 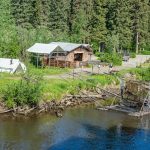 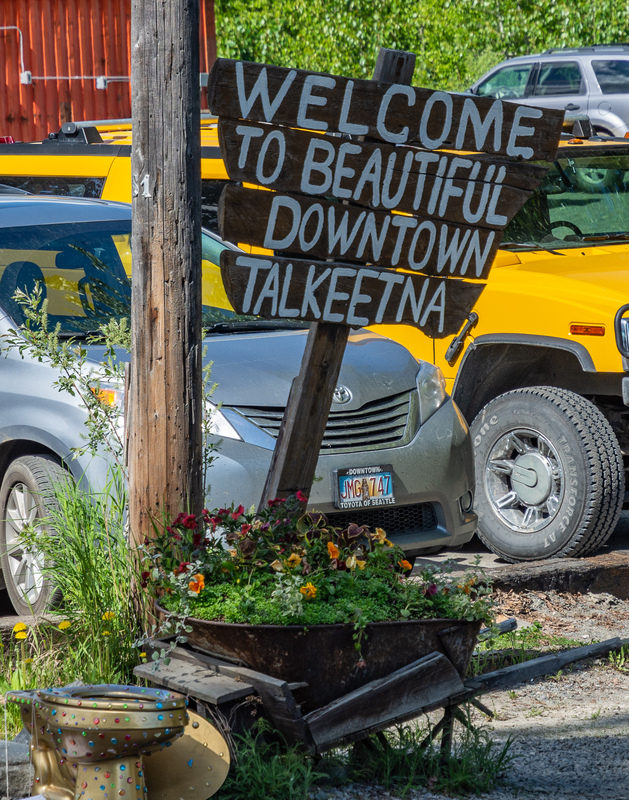 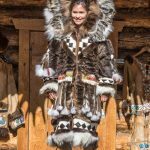 Our destination was the village of Talkeetna, often referred to as the model for the TV program “Northern Exposure.” This is rustic “splendor” at the extreme. 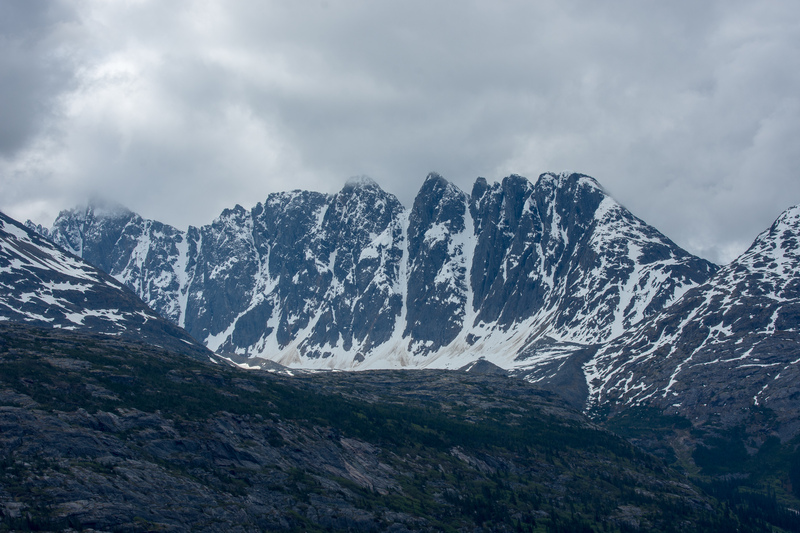 Our final destination for the night was the Mt. McKinley Wilderness Lodge which offered our last chance to view Denali, a comfortable bed, some good food, and an opportunity to send dirty clothes home via USPS Priority mail at a good price. 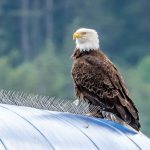 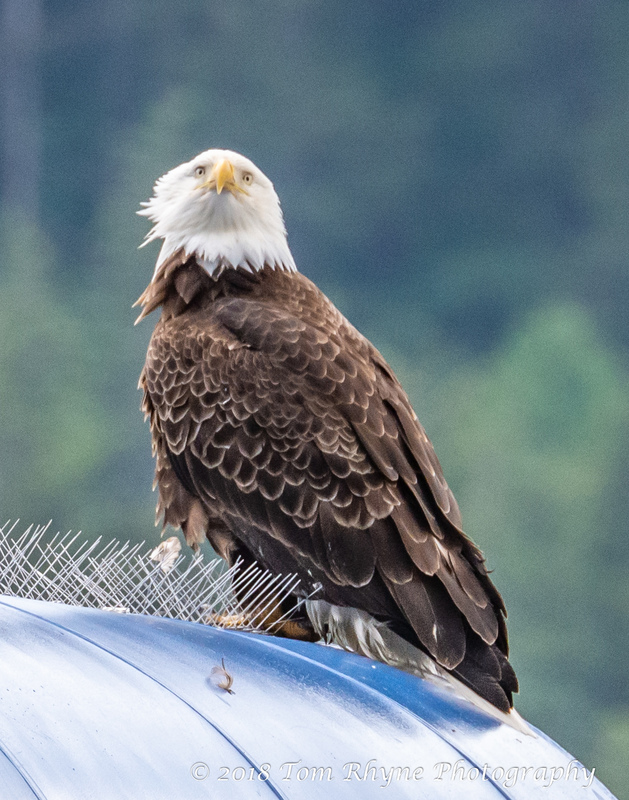 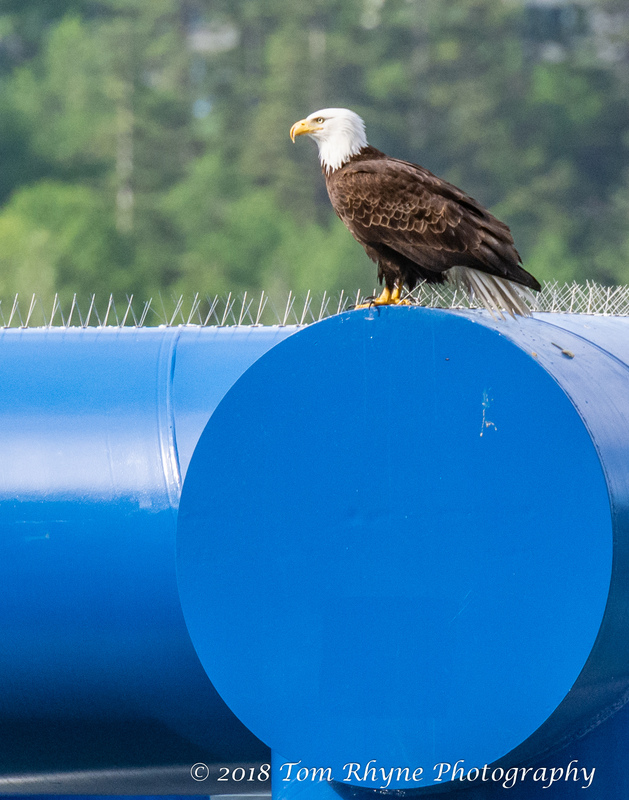 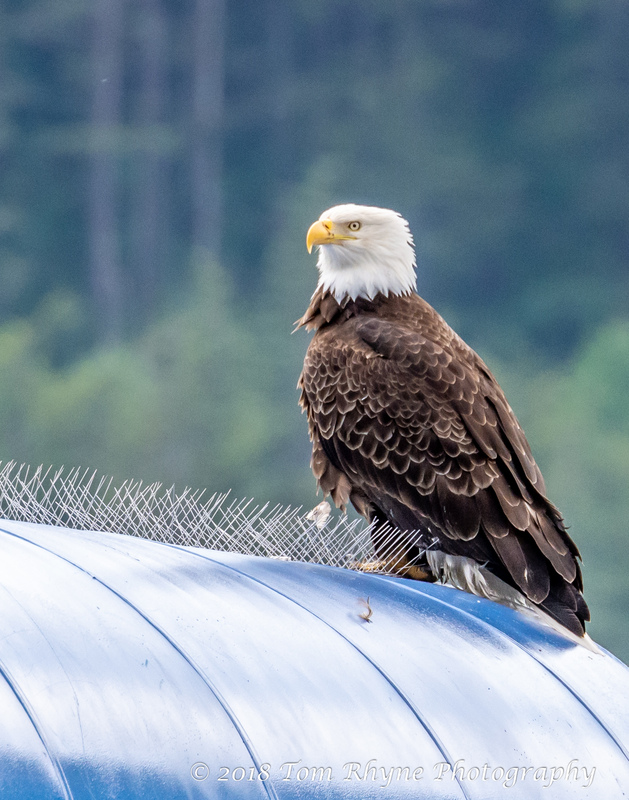 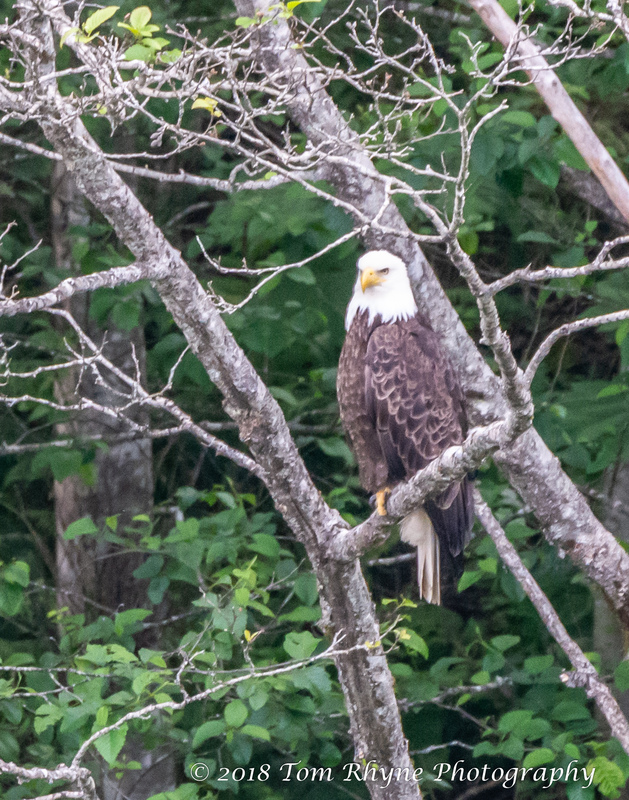 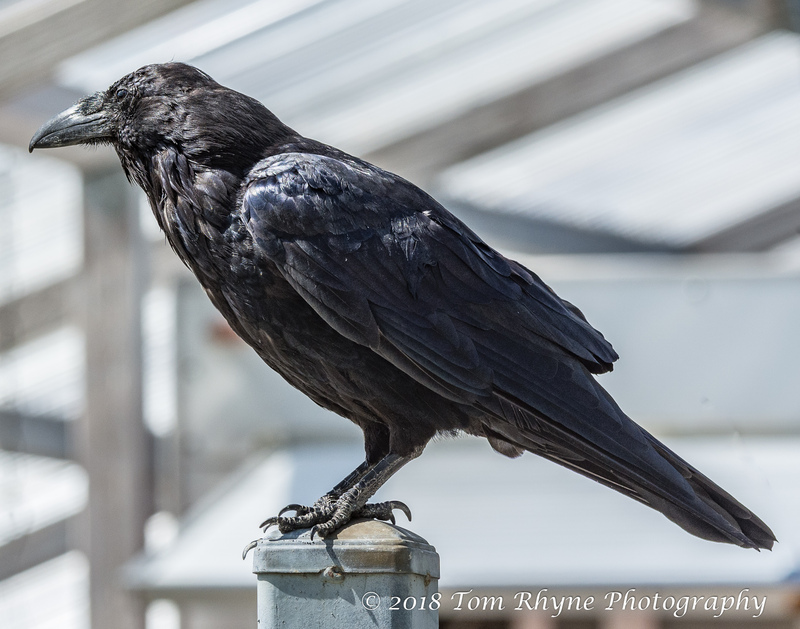 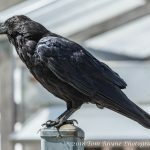 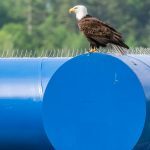 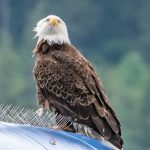 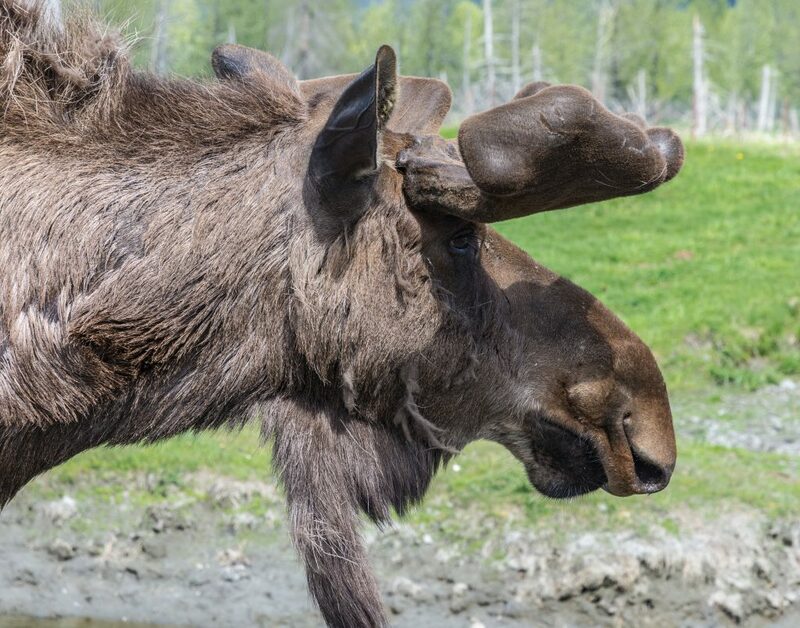 The state bird of Alaska. 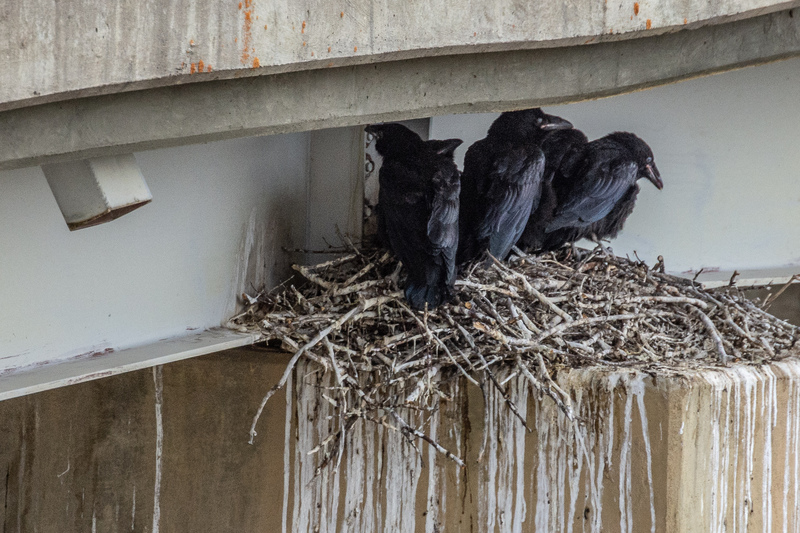 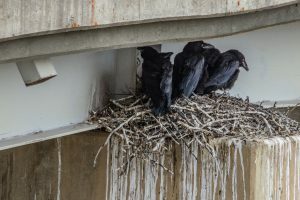 This nest of ravens was in a sheltered location under a bridge. 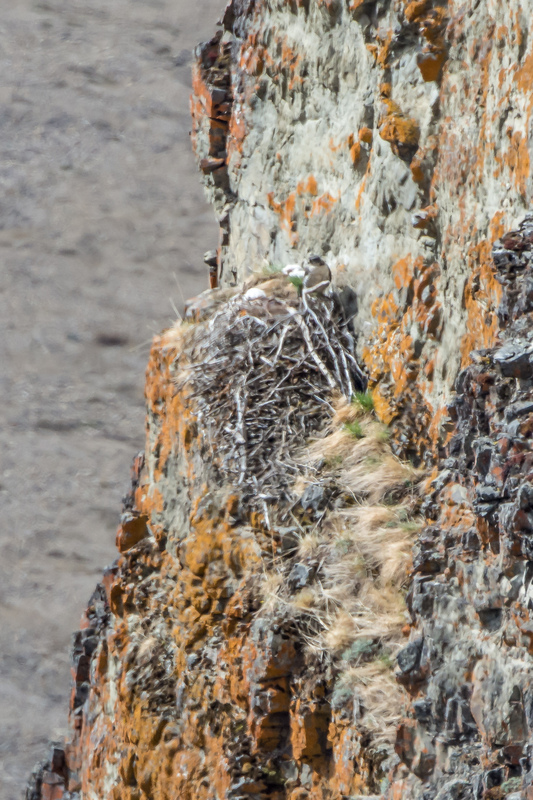 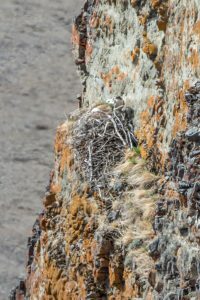 and this gyrfalcon nest was on a sheer cliff beyond reach of all predators. 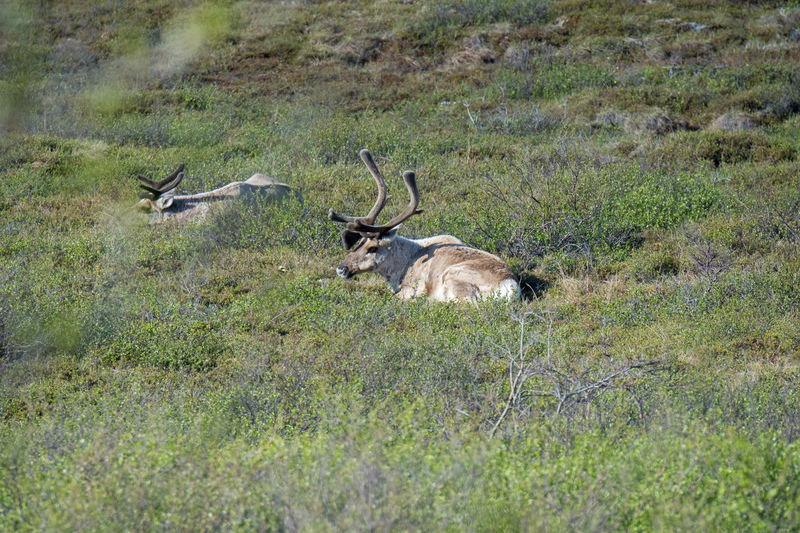 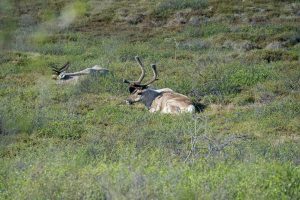 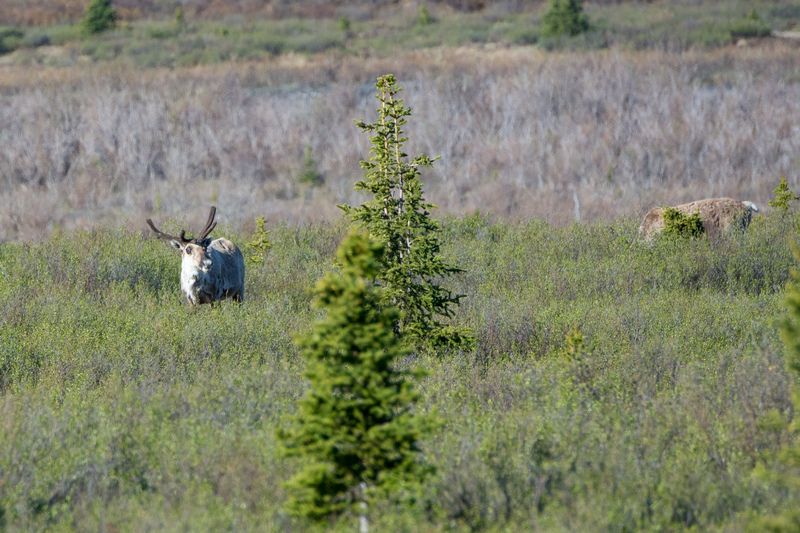 Caribou were very plentiful throughout the park. 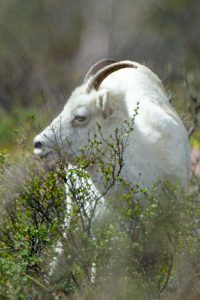 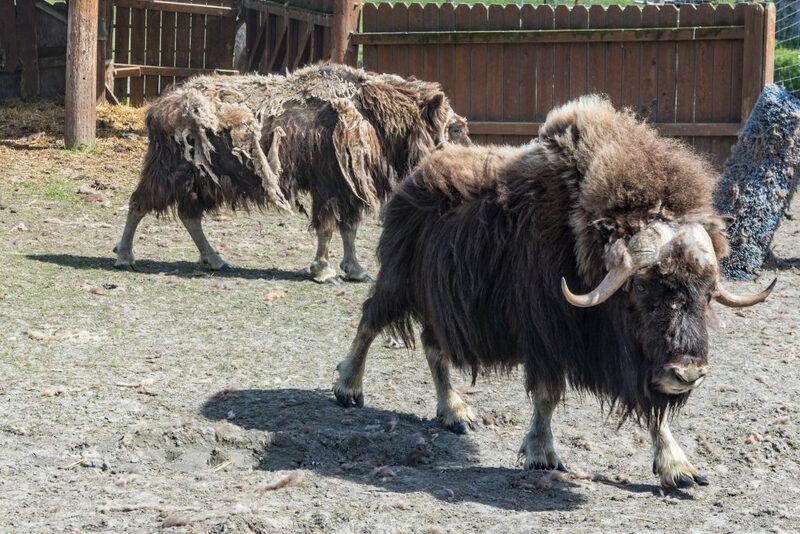 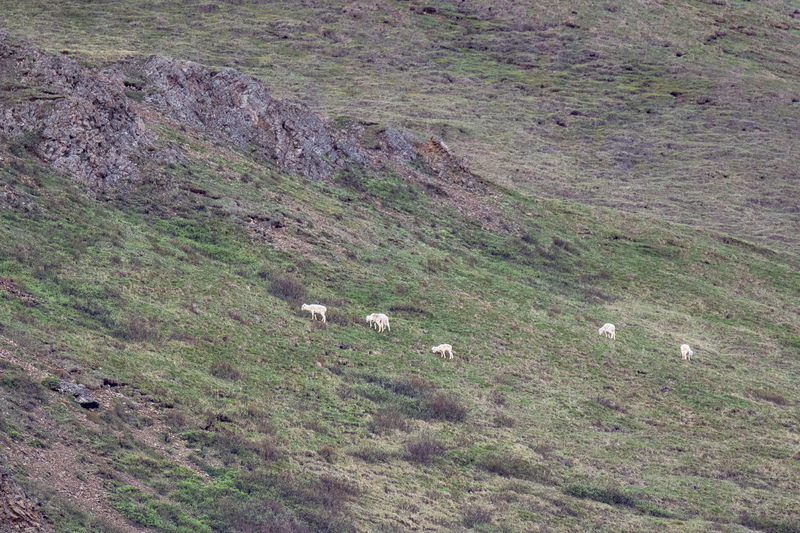 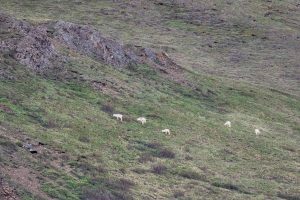 and the only known wild white sheep, Dall sheep, were plentiful. 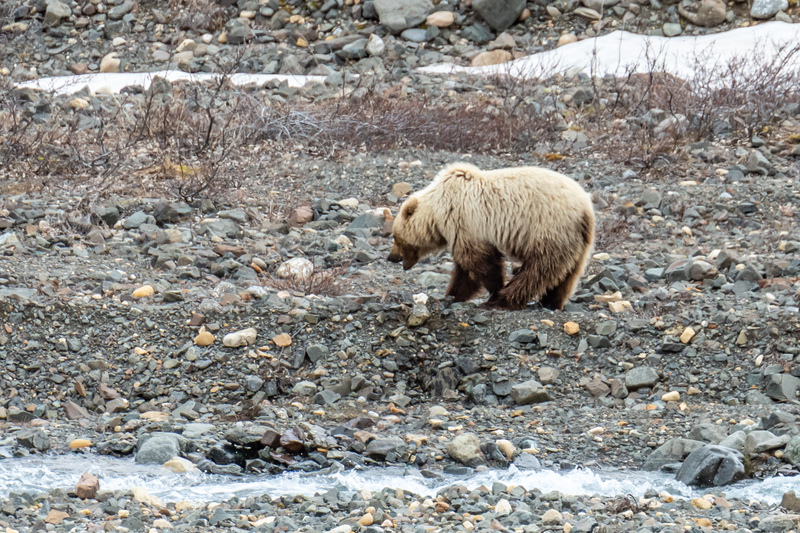 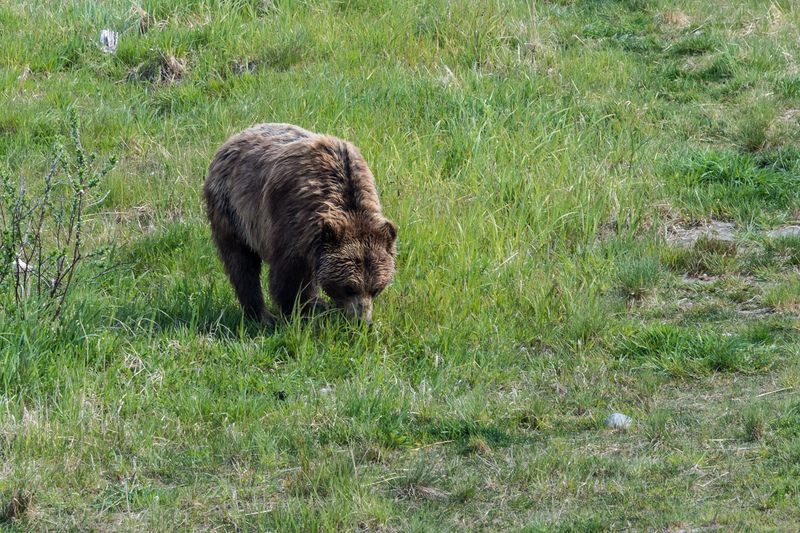 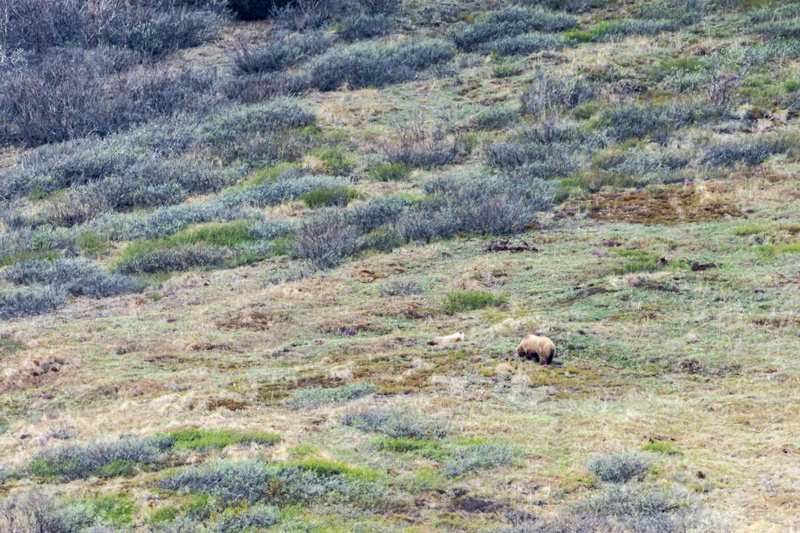 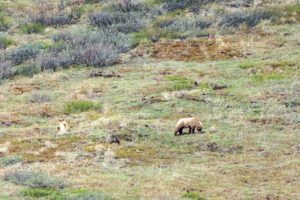 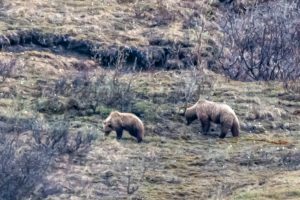 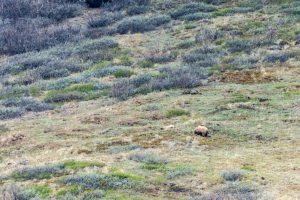 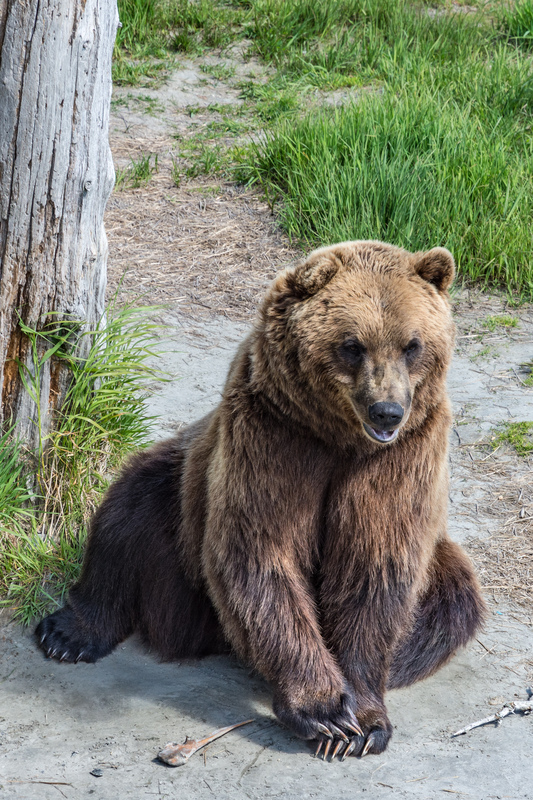 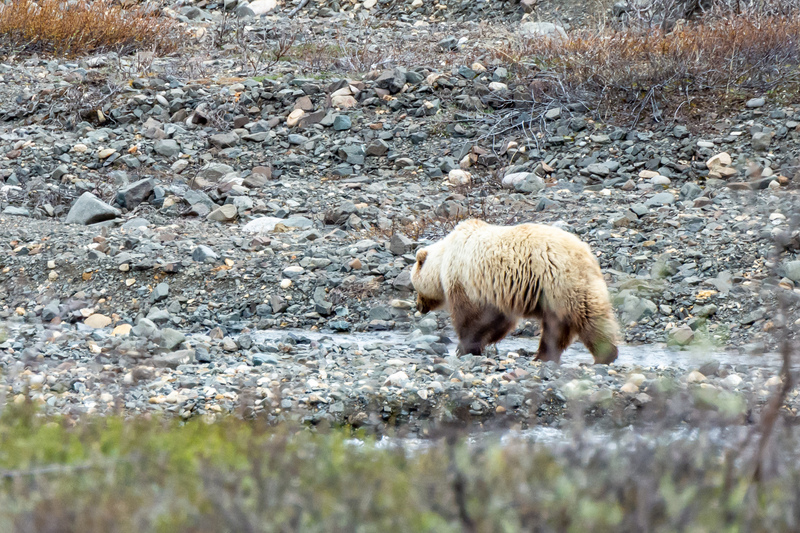 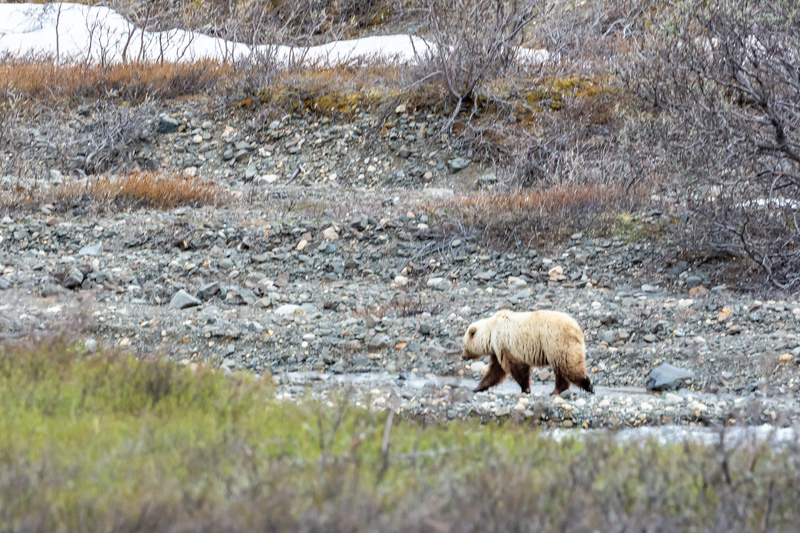 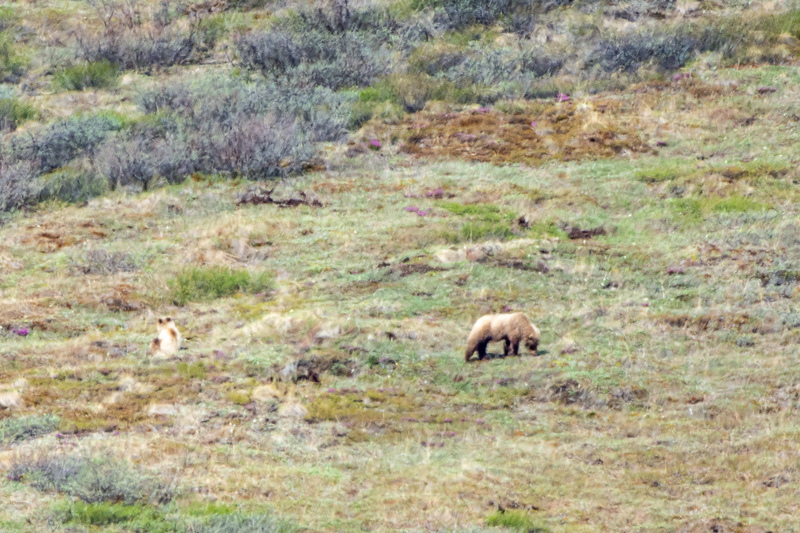 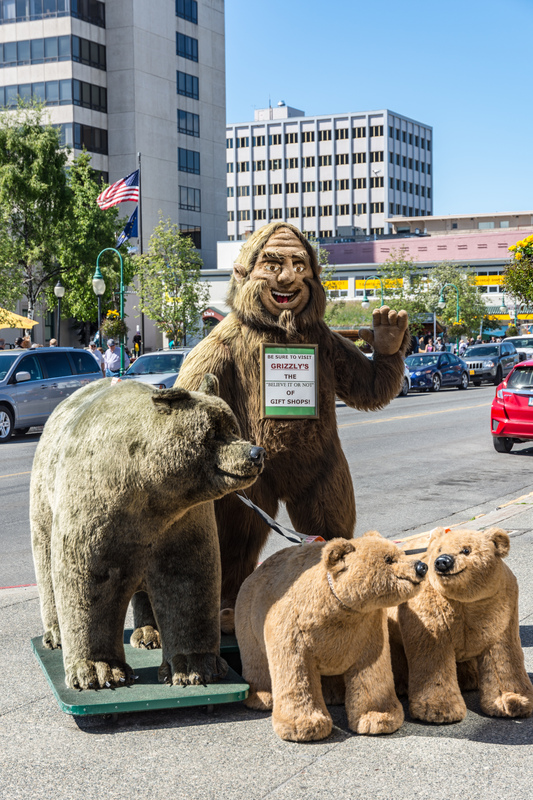 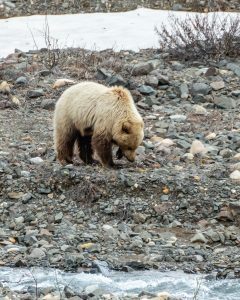 We were excited to find plenty of grizzlies around. 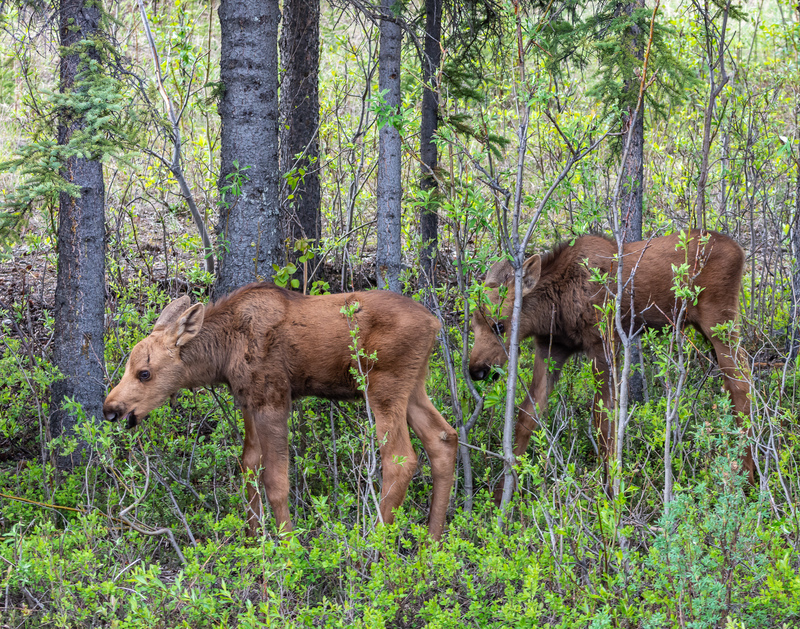 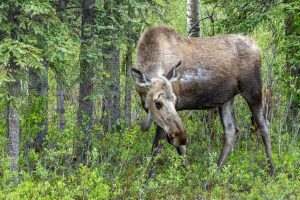 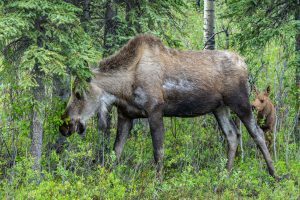 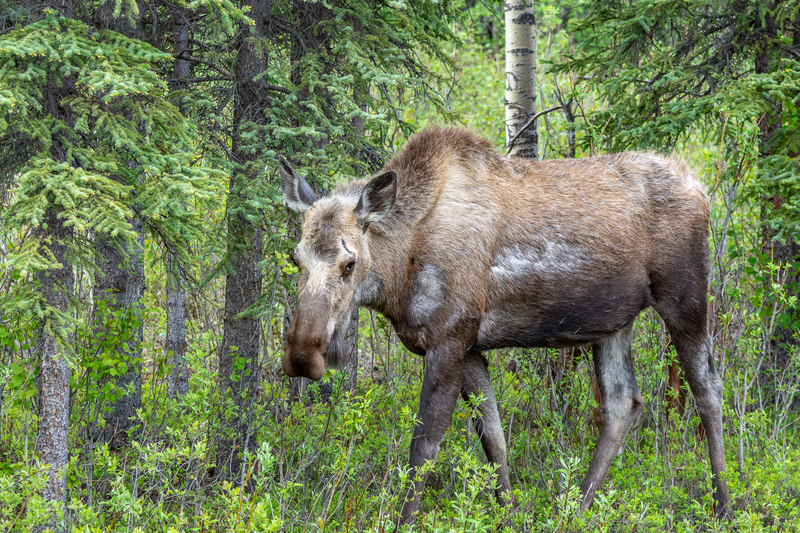 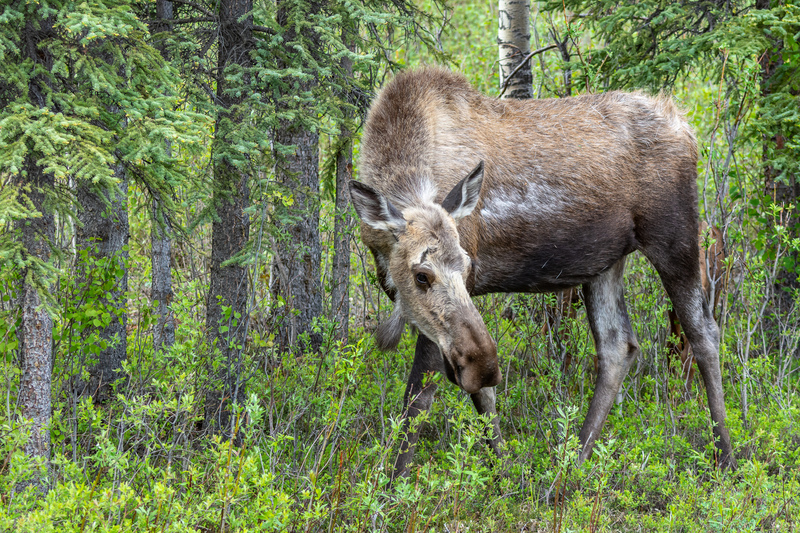 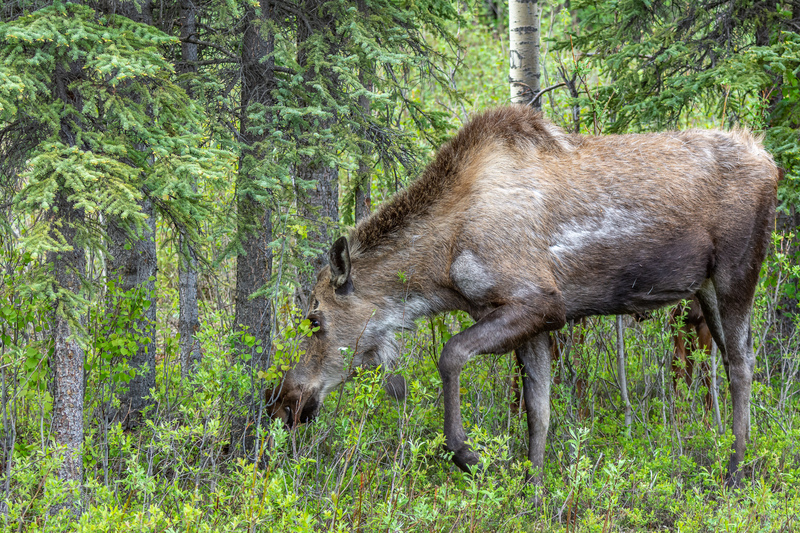 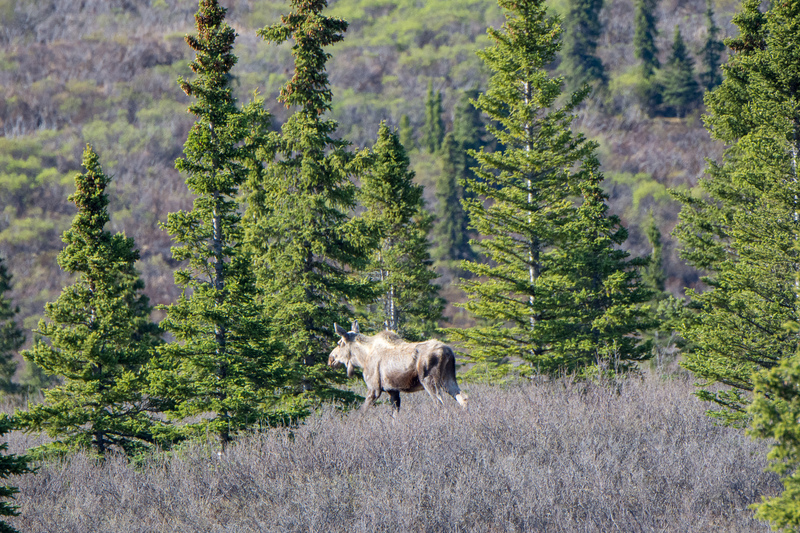 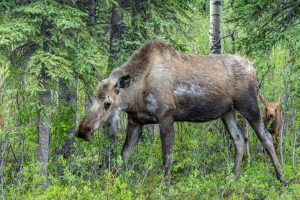 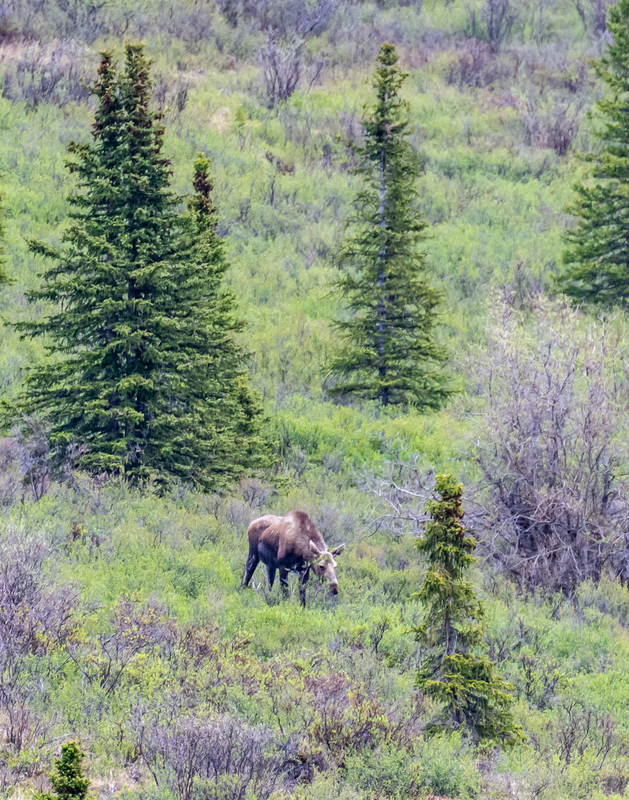 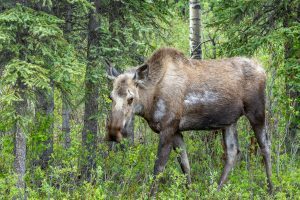 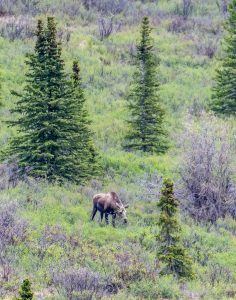 and we were very lucky with moose, finding a number of them grazing along the park road. 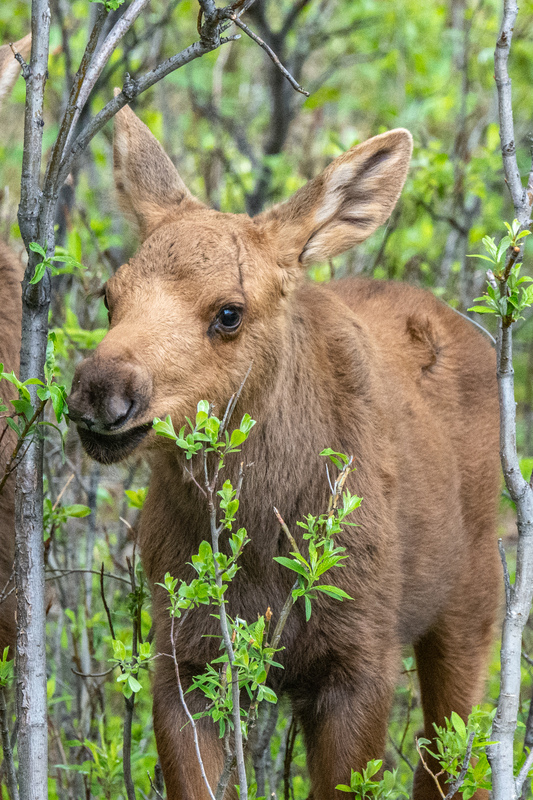 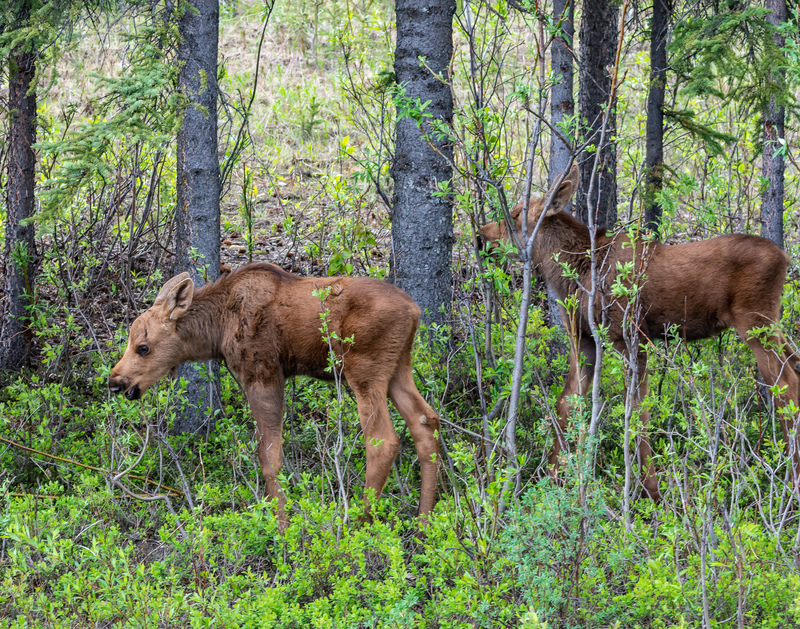 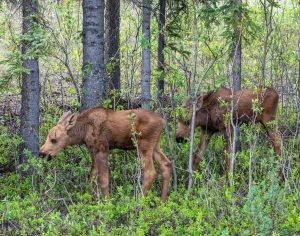 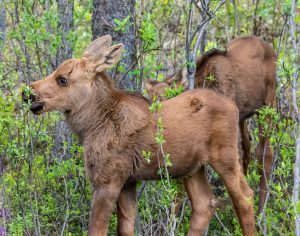 Our big lucky break came with a close encounter with a female and her twin calves grazing on willows just by the roadway. 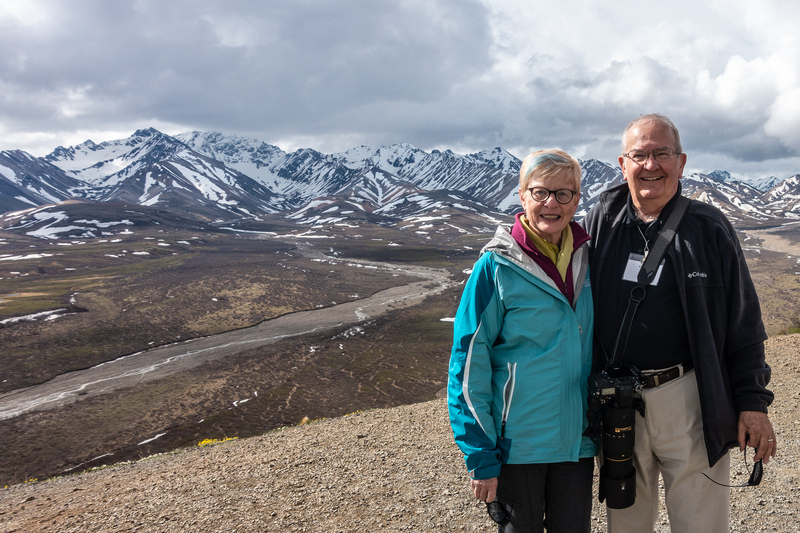 The scenery was magnificent even when it was overshadowed by the wildlife. 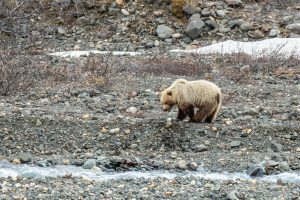 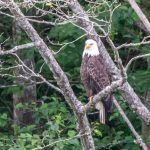 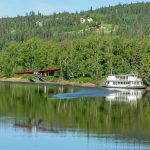 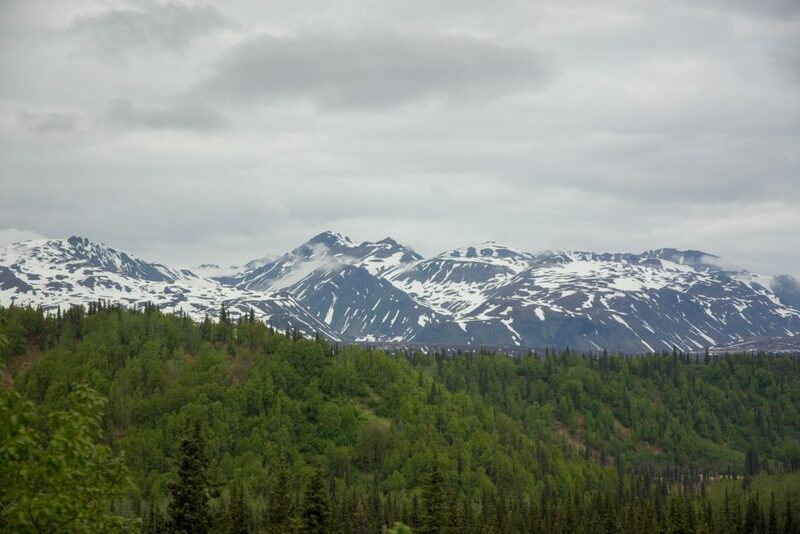 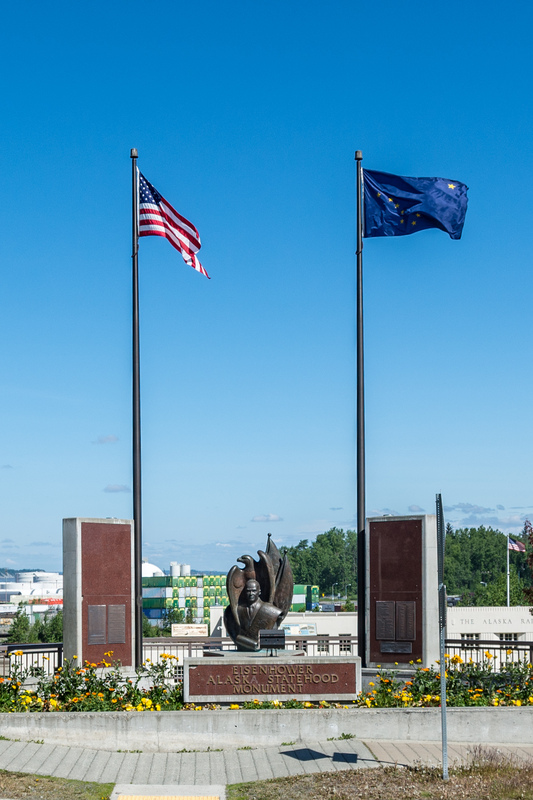 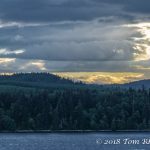 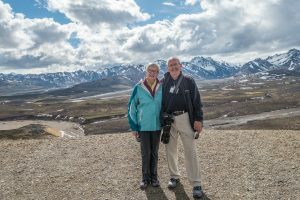 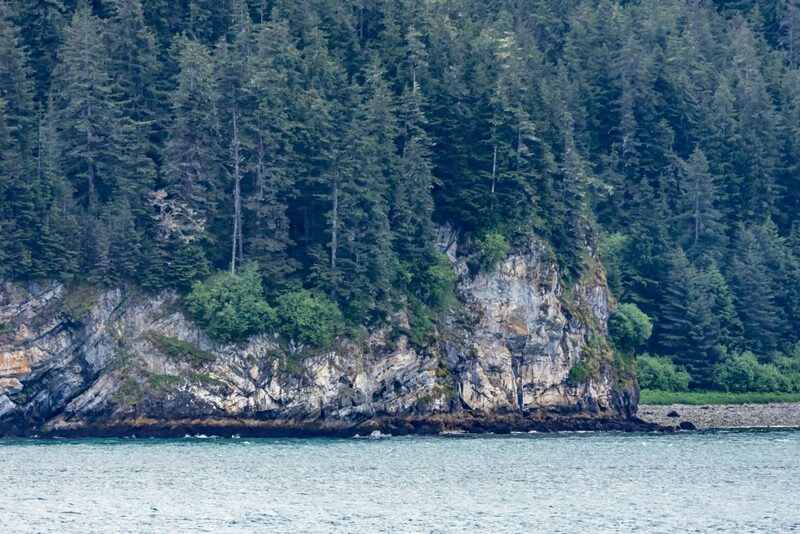 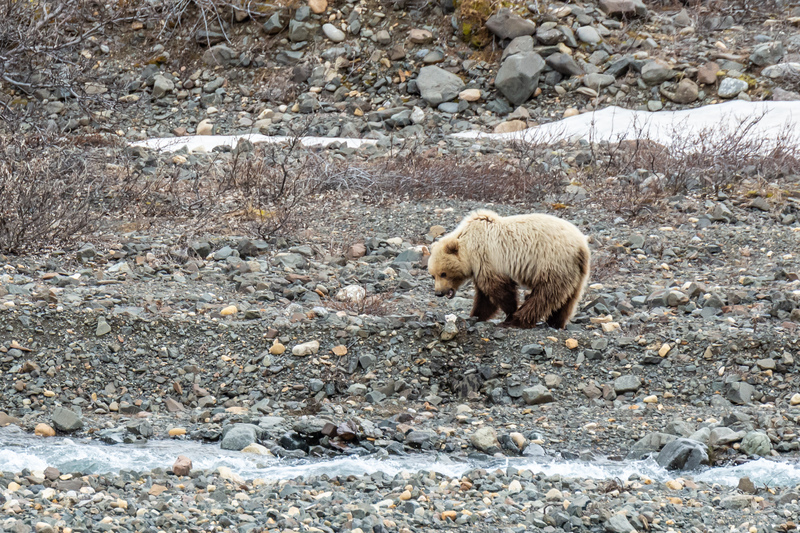 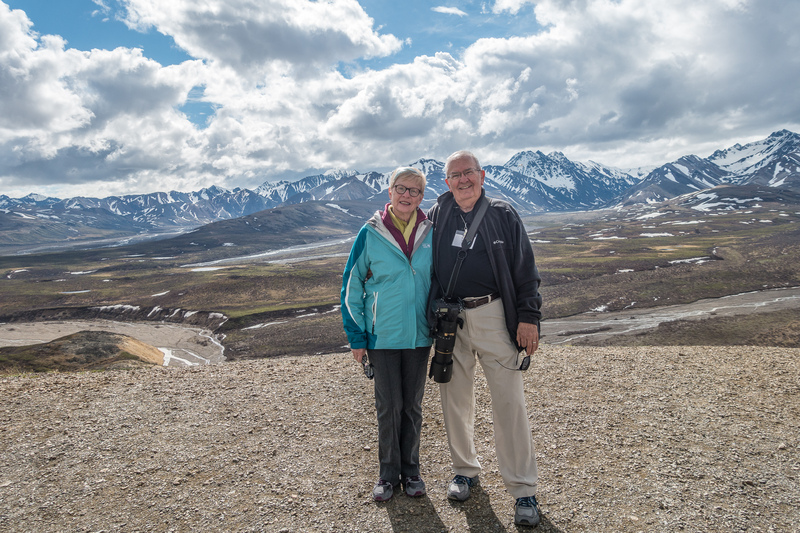 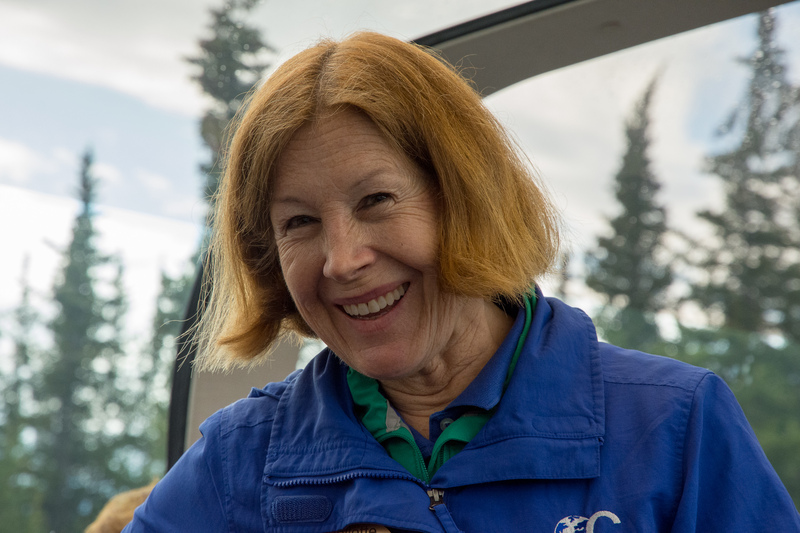 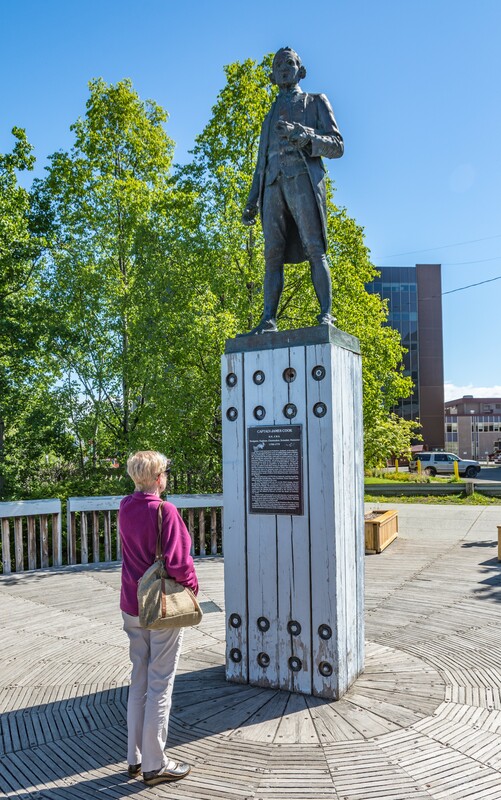 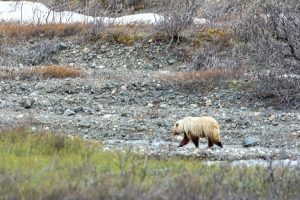 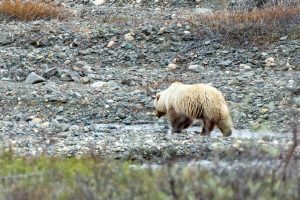 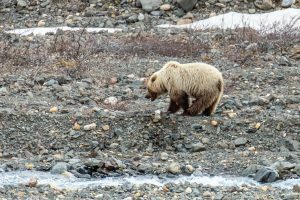 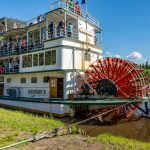 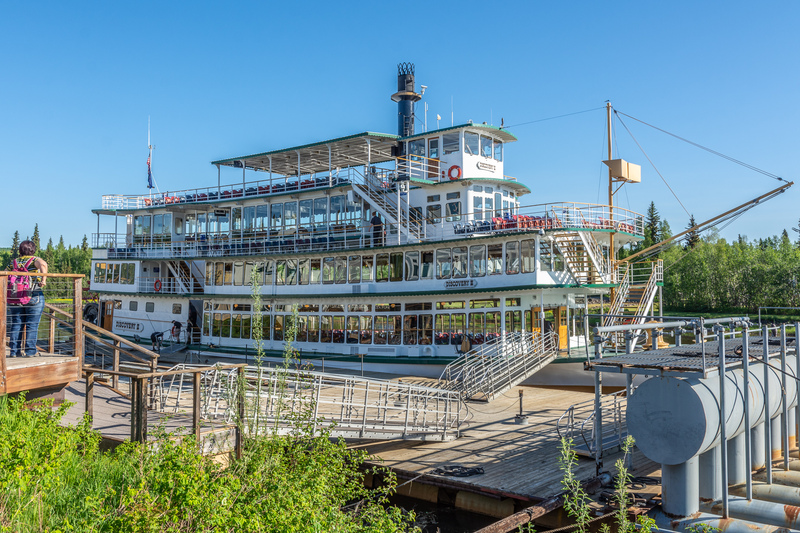 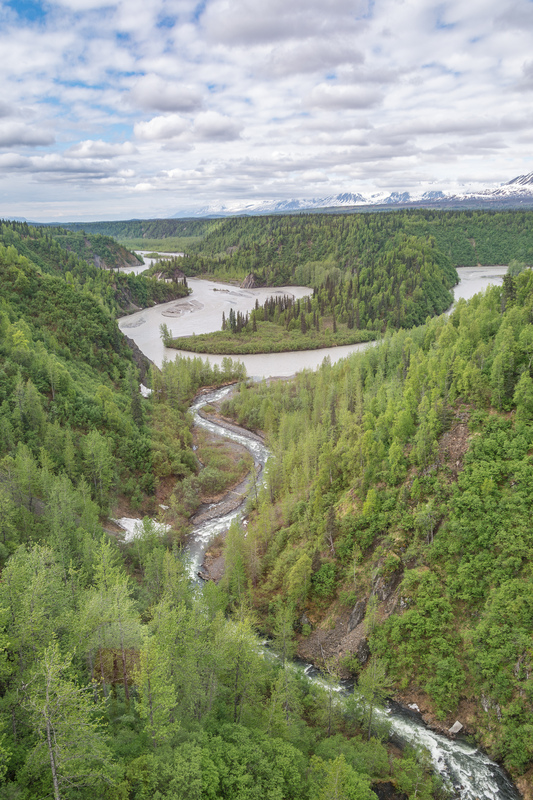 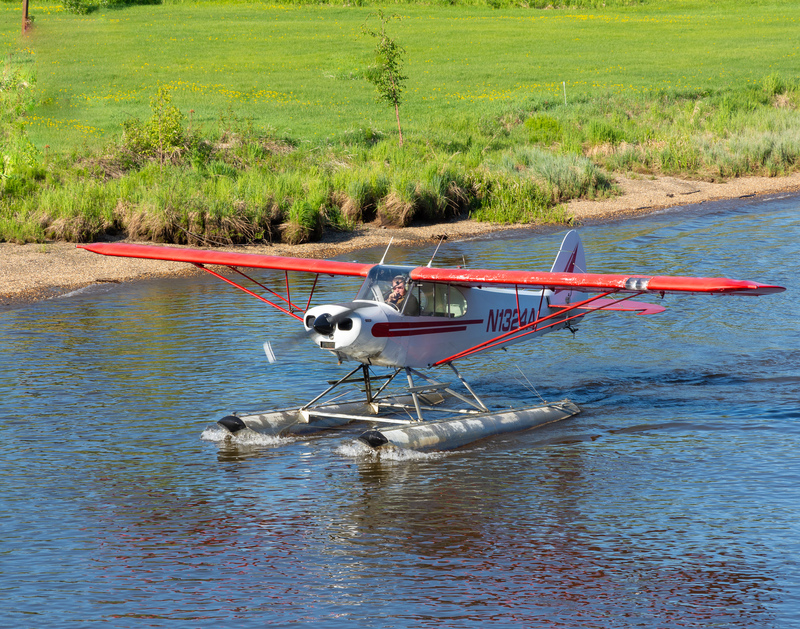 Our first day in Alaska began with a three-hour river cruise on the Chena River into the heart of Alaska where we were introduced to the world of bush pilots, sled dogs, and the Athabascan heritage. 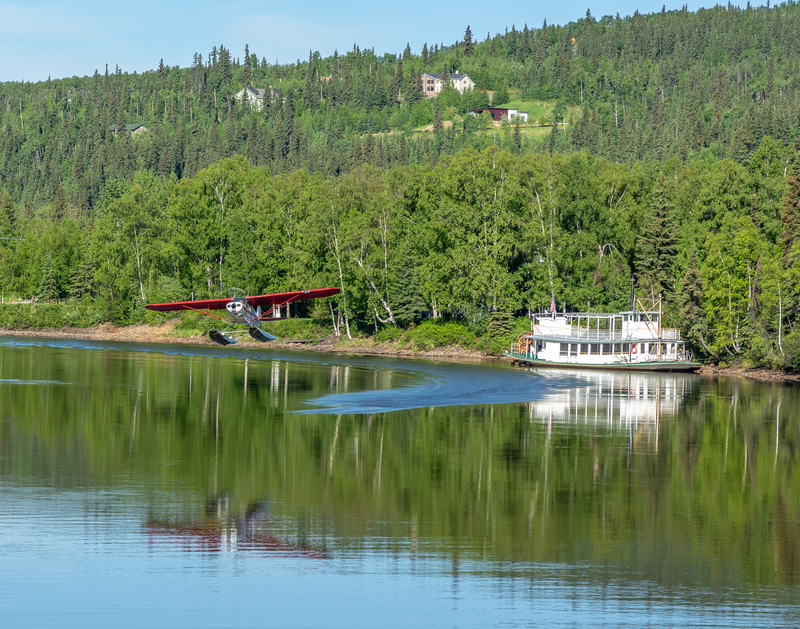 The bush plane was the commuter vehicle for most of the year, covering the huge distances of the Alaskan wilderness in much shorter times than any other means. 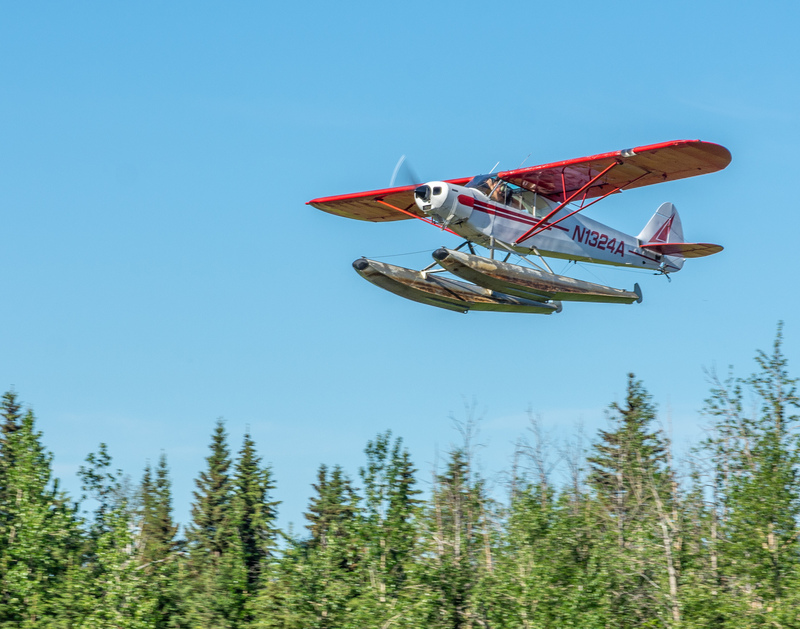 Depending of the time of year and the weather, the planes were outfitted with wheels, floats, or even skis. 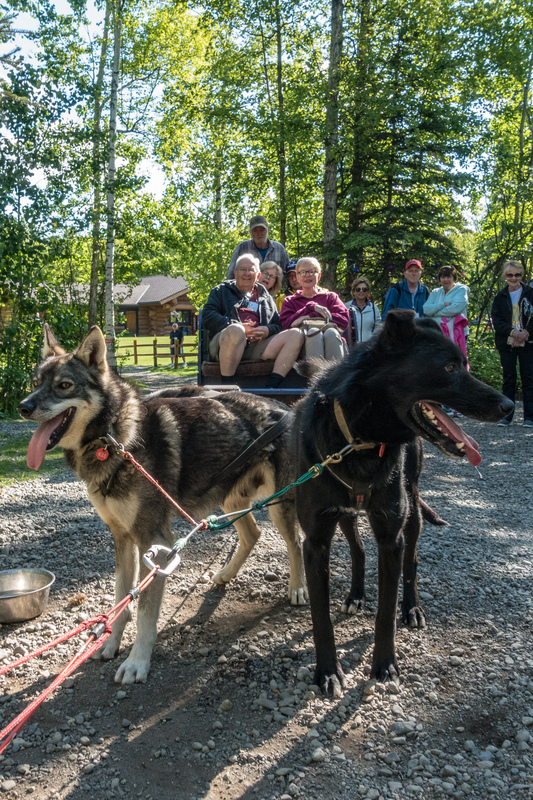 The sled dog is a universal symbol for Alaskan transportation and it represents the only true Alaskan sport: mushing. 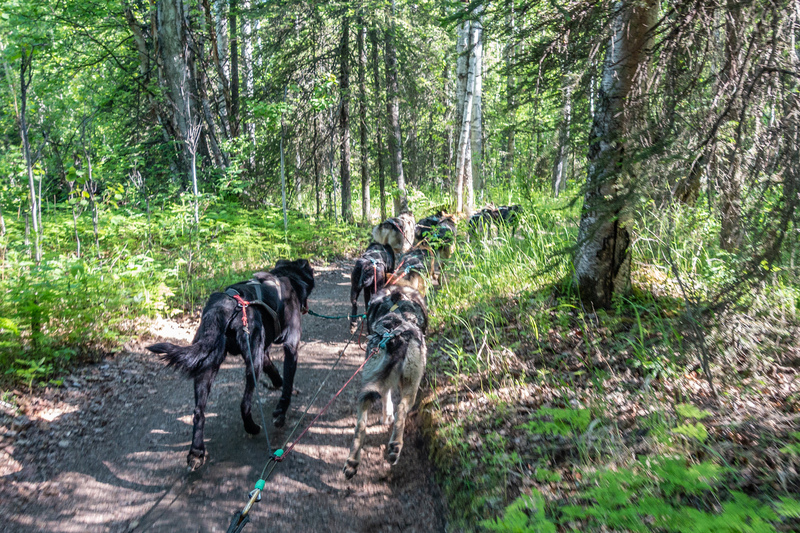 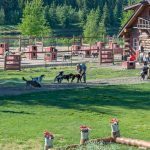 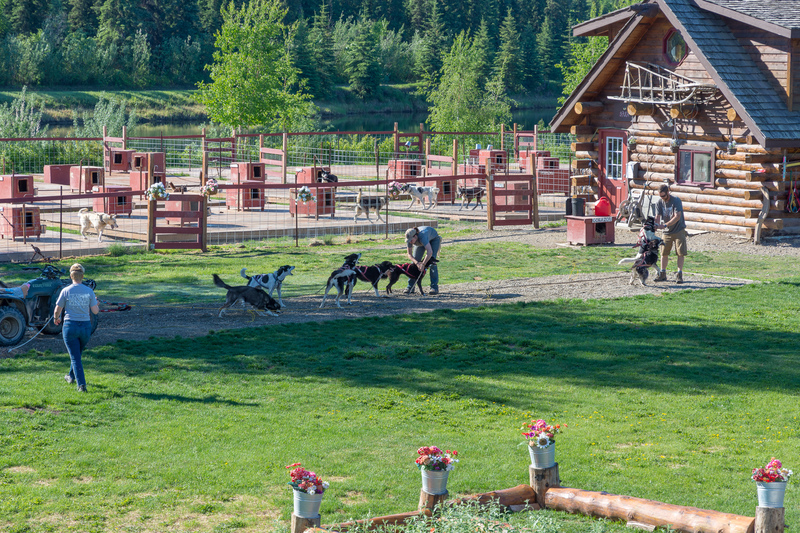 The Iditarod race represents the ultimate challenge of this sport, and dogs are trained for this race throughout the year. 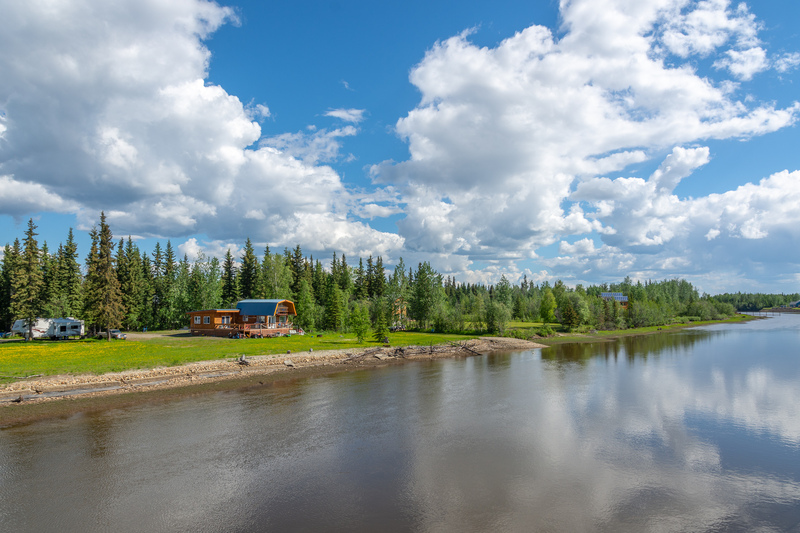 The Athabascan heritage was demonstrated during our visit to the village alongside the river. 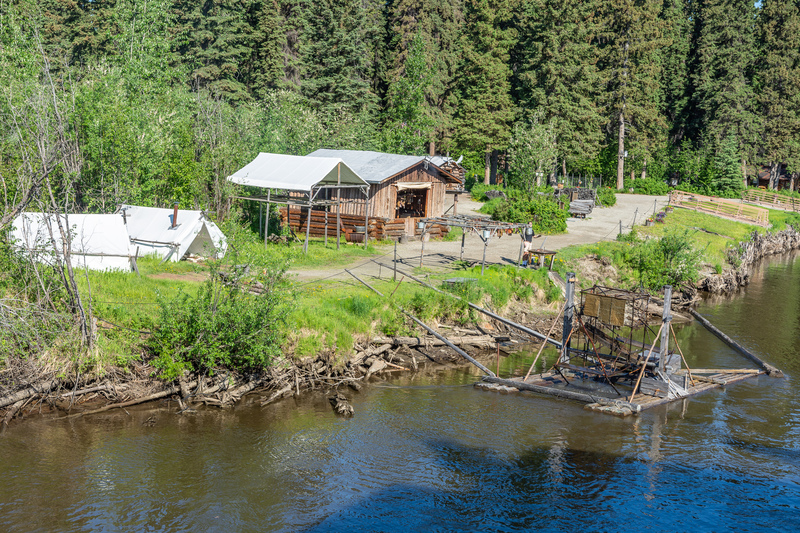 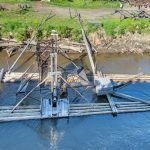 The fish wheel was used to lay in a supply of salmon during the spawning run each year and the fish were prepared and arranged in the smoking and/or drying shed to preserve them. 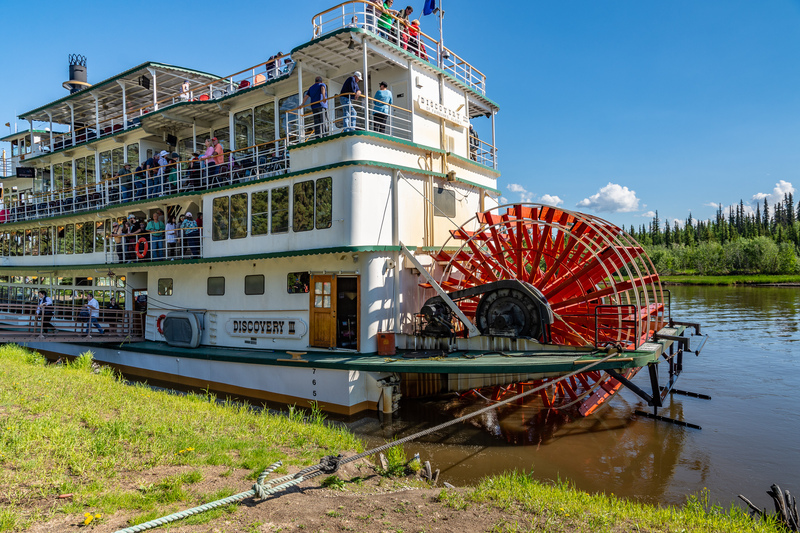 We were lucky to have wonderful weather on the cruise on this beautiful river (and almost every other day of our trip).